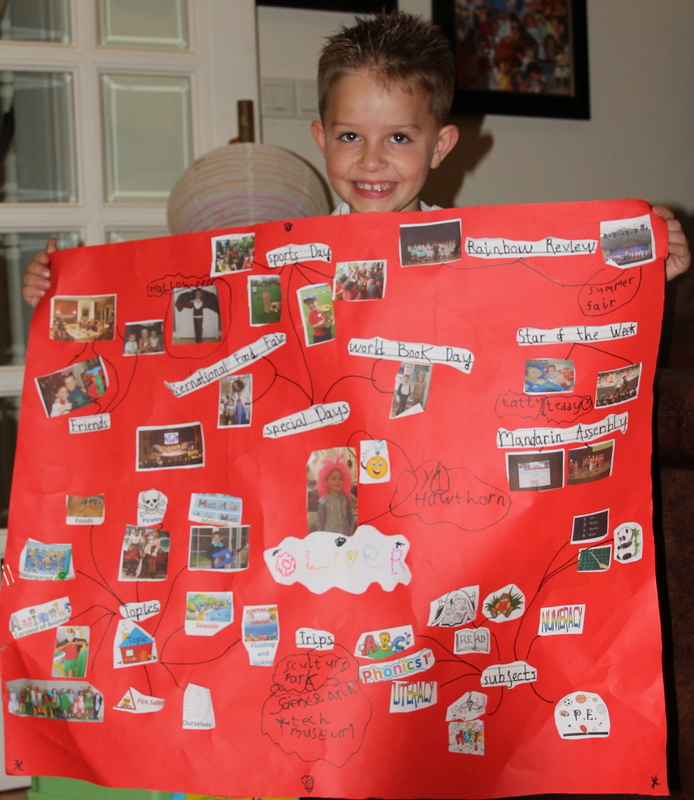 The last homework that Oliver had to complete was to create something that summarized his year of learning. He has just completed Year 1 at BISS. He received a fabulous end of year report (so did Isabelle!) and they have both really accomplished so much in the year. We are so proud of them. They scored top marks for effort in every subject which means they are trying their very best at everything – can’t ask for more!! Oliver’s year 1 at BISS! 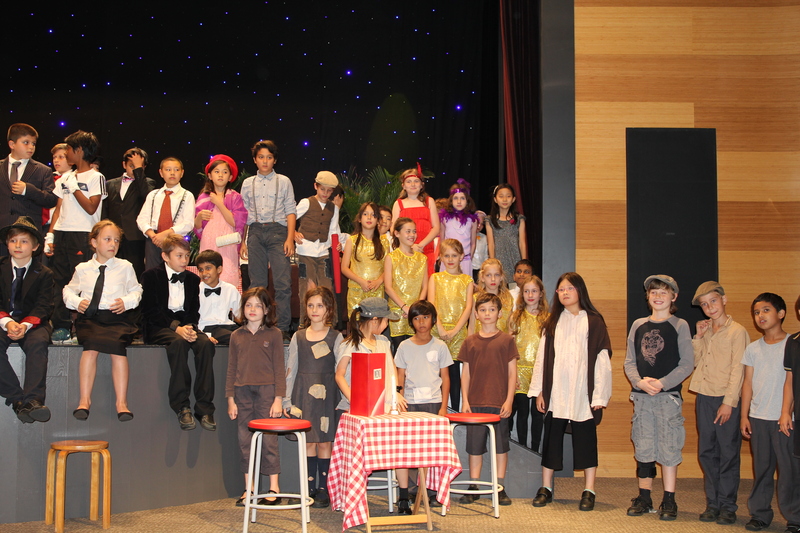 We have just watched an amazing performance from the Junior School at BISS. 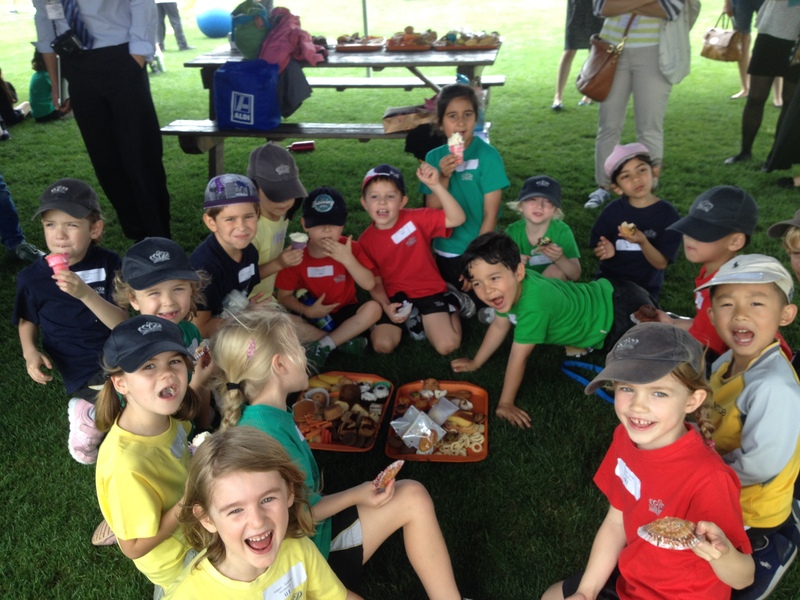 When I say, Junior School, I mean ALL of the Junior School! 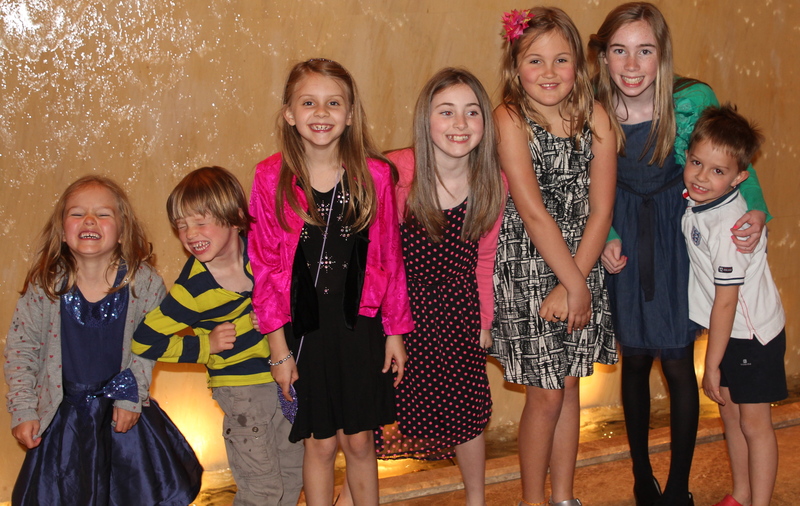 Over 200 childrend, (every single student in Year 4 and Year 5) had a part to play. 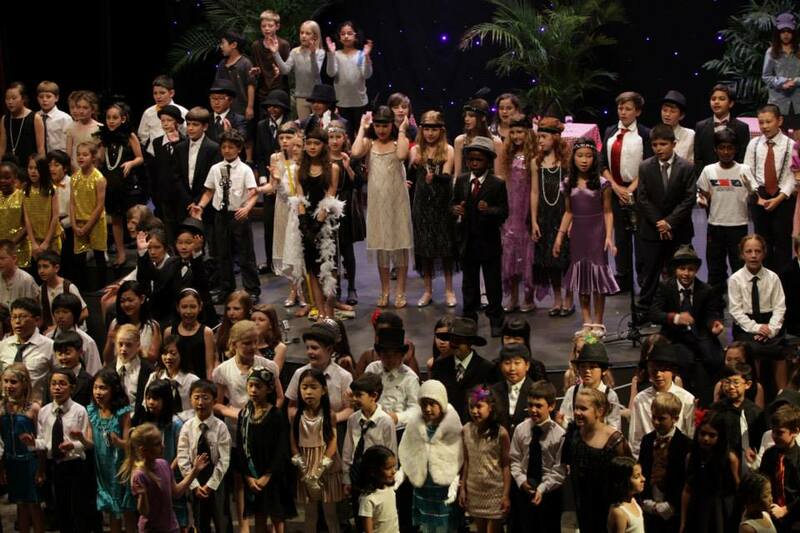 All 200+ children were on the stage, (and in front of the stage!) for the final song. The professionalism from 8 ,9, 10 year olds completely astounded me. 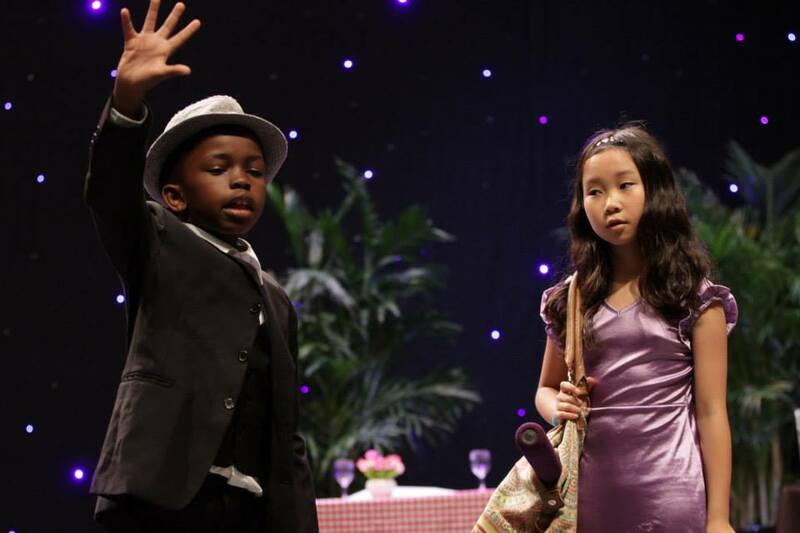 The vast majority of the performance was done without microphones, yet every child who had a speaking or singing part was clear, loud and articulate. Their confidence was brilliant to watch. This was a massive co-ordination effort and has taken months of planning. The play was directed by Steve King (Head of Junior School) and you could see the pride and joy written all over him at the end of the show. 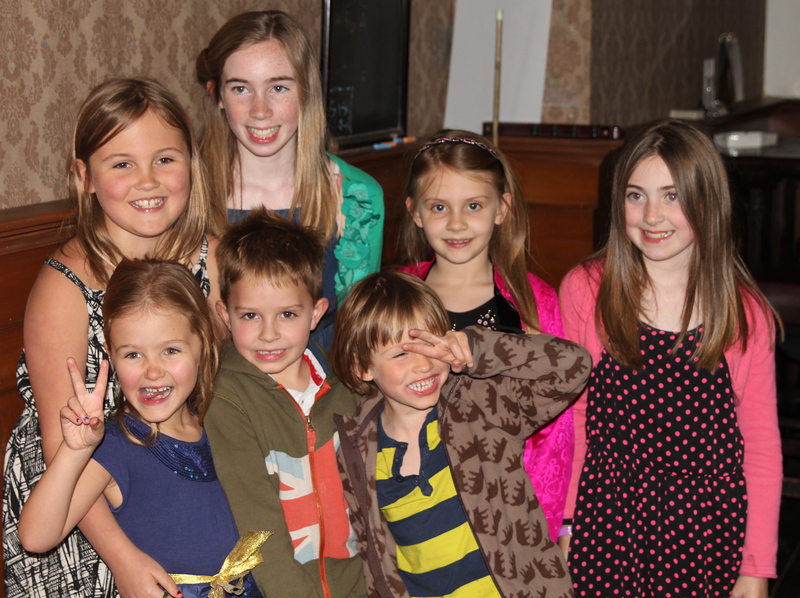 He gave thanks to all the children and the teachers who had worked so hard to deliver such a flawless performance. In fact, the show was originally only planned for 2 nights, but the demand for tickets was so high, that the school had to offer a Matinee performance in addition!! 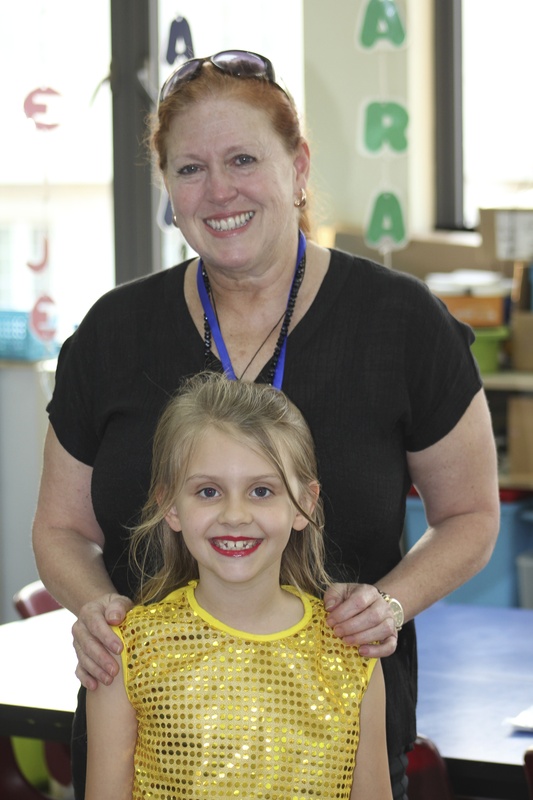 Isabelle and her teacher, Mrs Suzanne Sinclair. This was drop off time prior to curtain up! 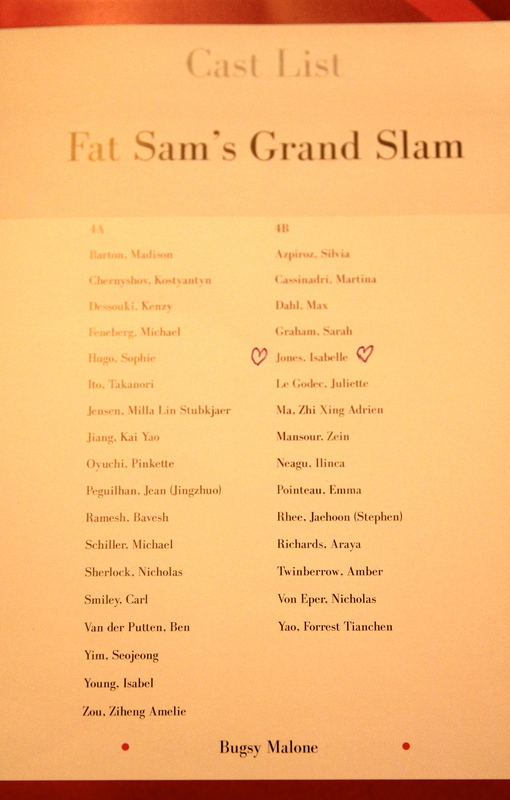 Isabelle was part of Fat Sam’s Dancing Girls. She came out with a huge smile on her face and it didn’t leave her face. 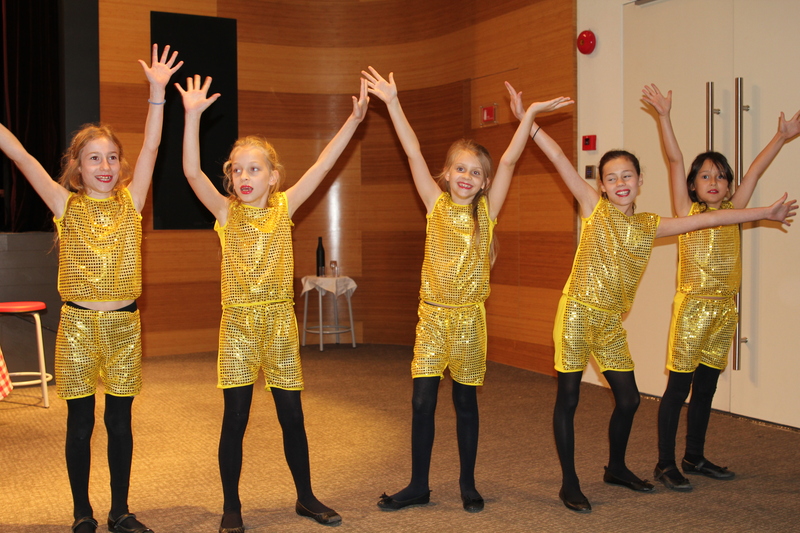 She sang beautifully and all the girls did a very professional dance routine. Huge smiles from all the girls. In synch and in step. BISS is a very diverse school with students from all over the world. This was, of course, represented in the cast. 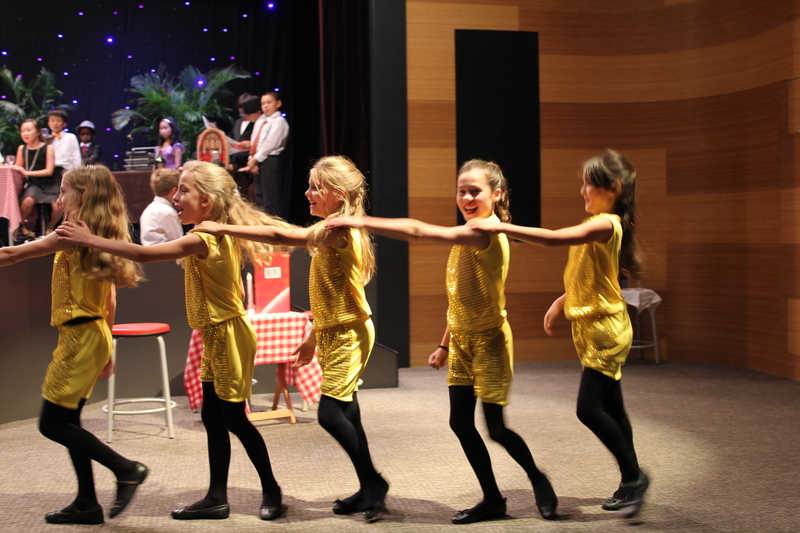 In addition, 2 very talented pianists from year 5 played all the music for the show. 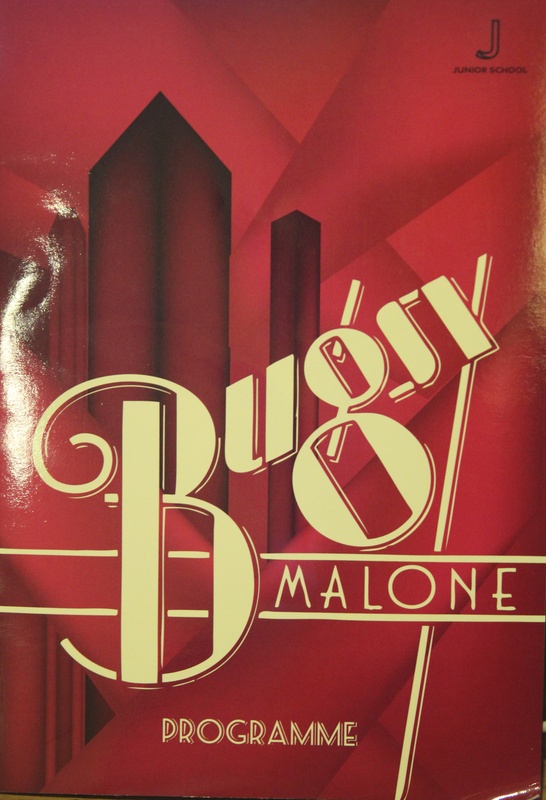 Bugsy Malone and Blousey Brown – both perfectly cast! Starting to bring all cast members out for the finale. 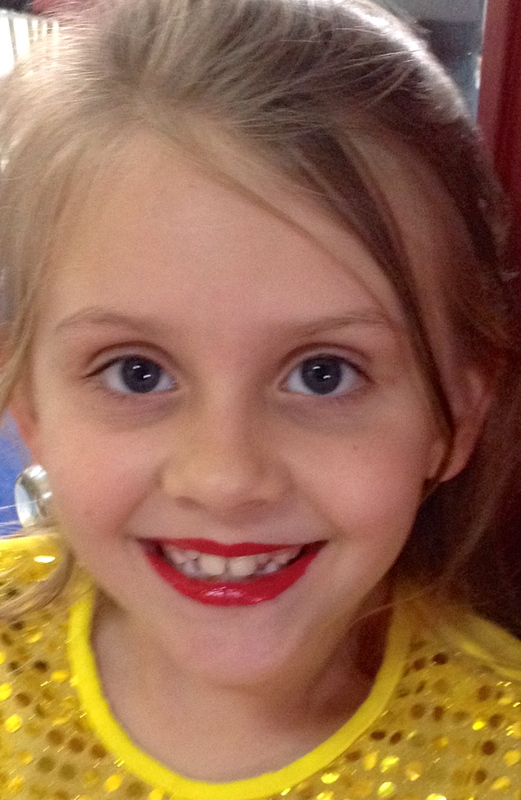 Isabelle is still smiling. It was the first time I had been to a school production where the audience gave a very extended standing ovation. 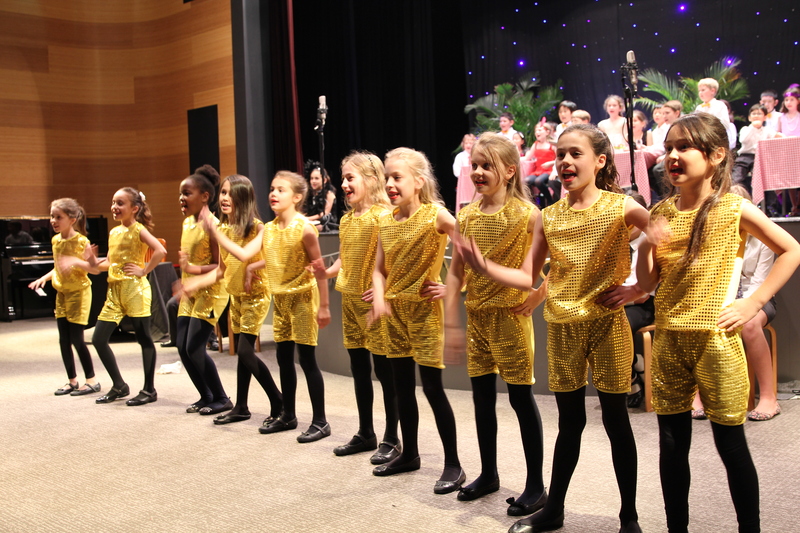 Every child had poured their heart and soul into their performance. It was wonderful and very moving. 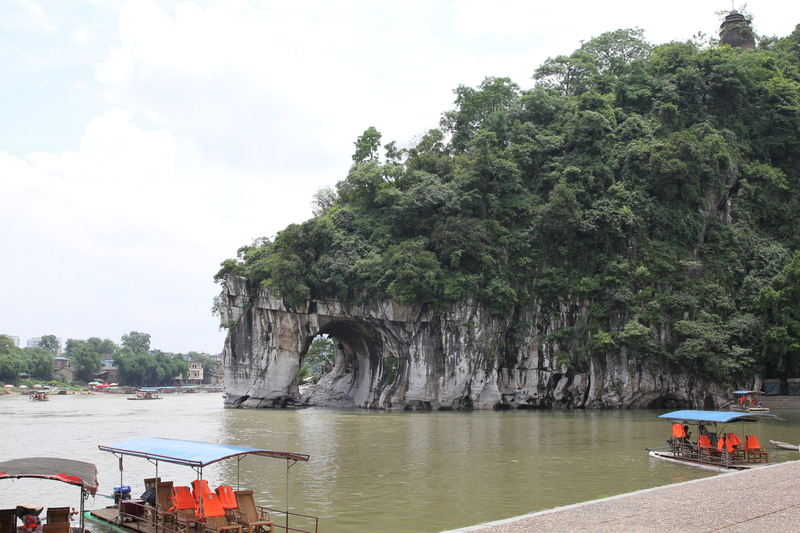 Another long weekend, this time due to Dragon Boat Festival and we had booked a long weekend to Guilin. On Friday afternoon we picked the kids up a little early from school and then set off for the airport. In true China fashion, we had a delay, but it was only 30 minutes. 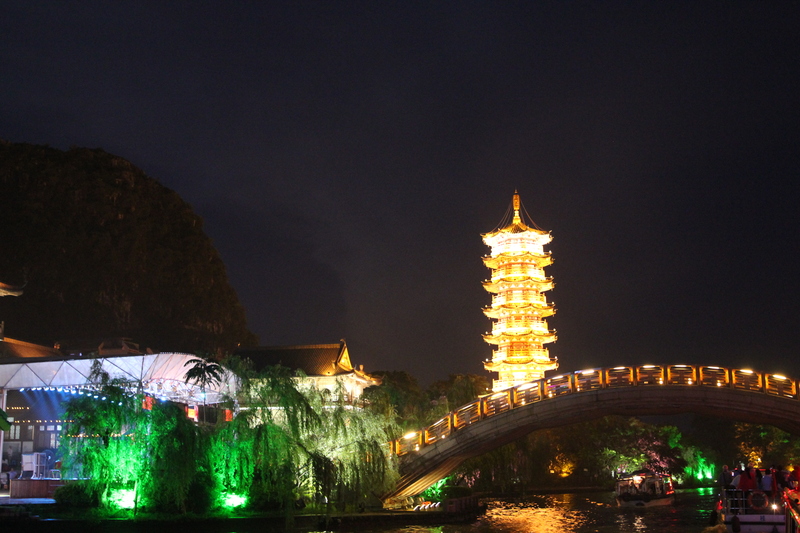 We landed in Guilin at 7.15 and a driver from the hotel we had booked (the Sheraton) met us ready to take us to hotel. We had a late dinner in the cafe and then settled in for the night. The Sheraton is a nice hotel on the river and there is spectacular scenery all around this beautiful city. 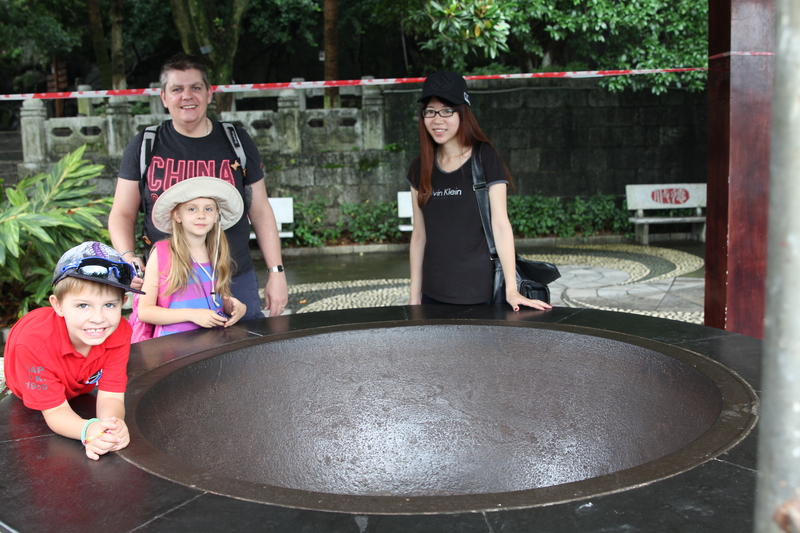 On Saturday morning our guide, Lily met us to start our days adventures. 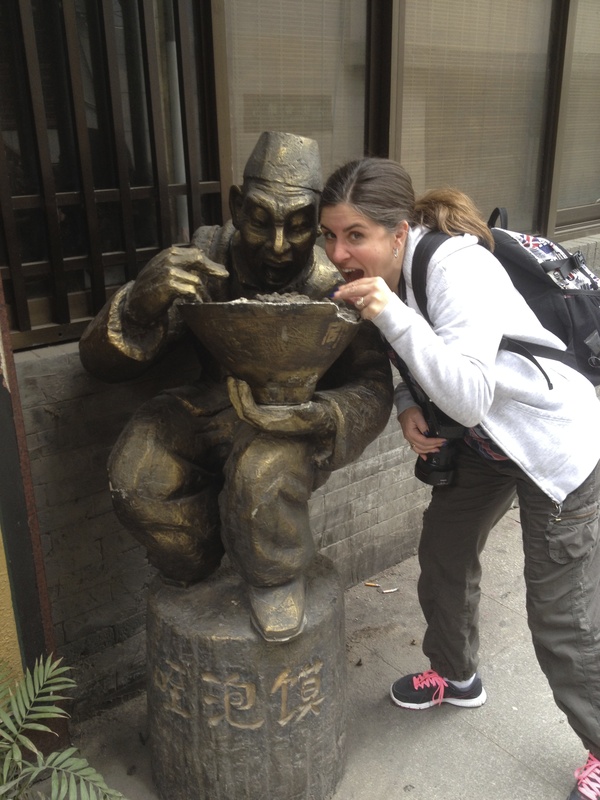 Just like our guides in Beijing and Xi’an, Lily was knowledgeable, flexible and attentive. She had arranged a nice minivan for our transportation and we had a good driver to go with that! 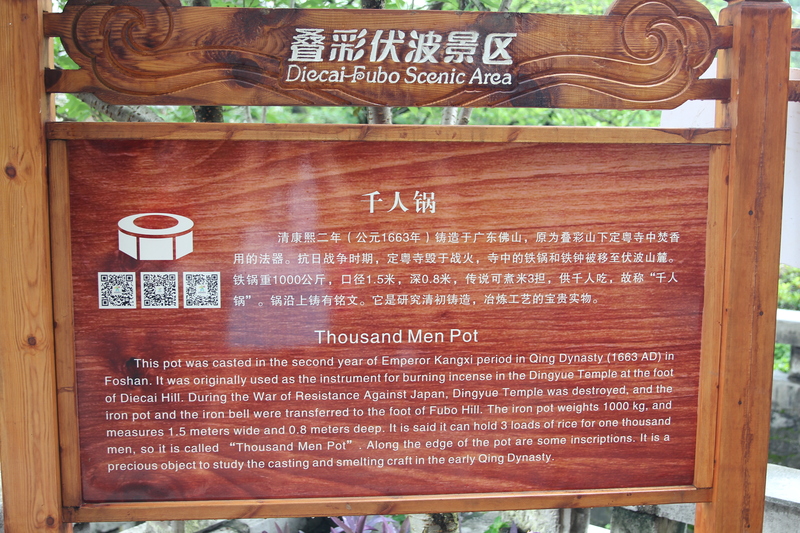 We started the morning by visiting Fubo Hill which is a large local park set around a large rock hill. 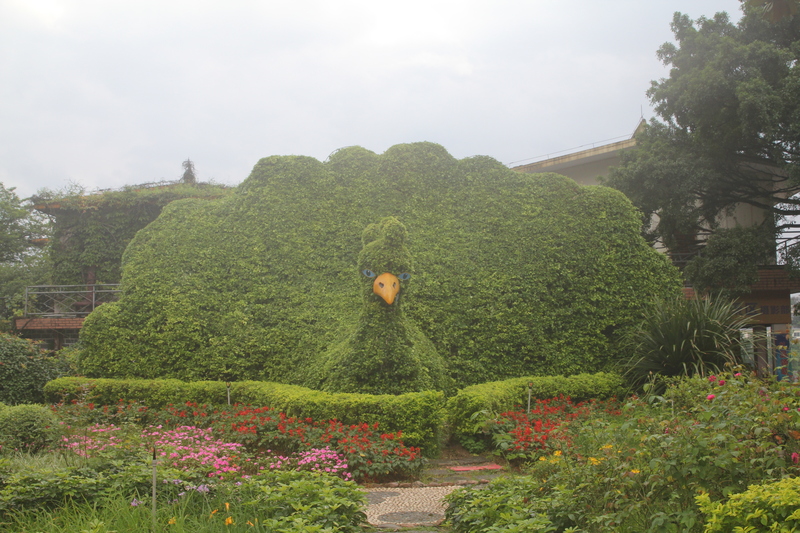 Fubo Hill Park – a peacock! Isabelle and Oliver trying to pull the sword out! 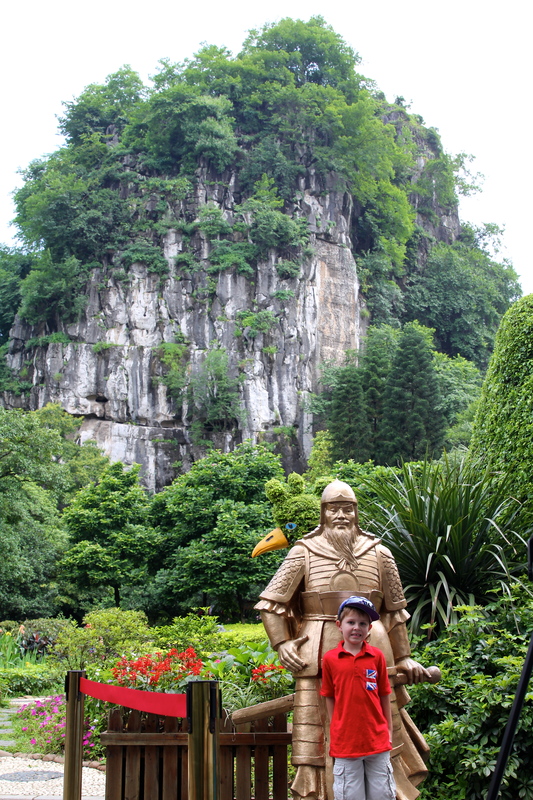 Oliver (and Army General) by the entrance to Fubo Hill Park. 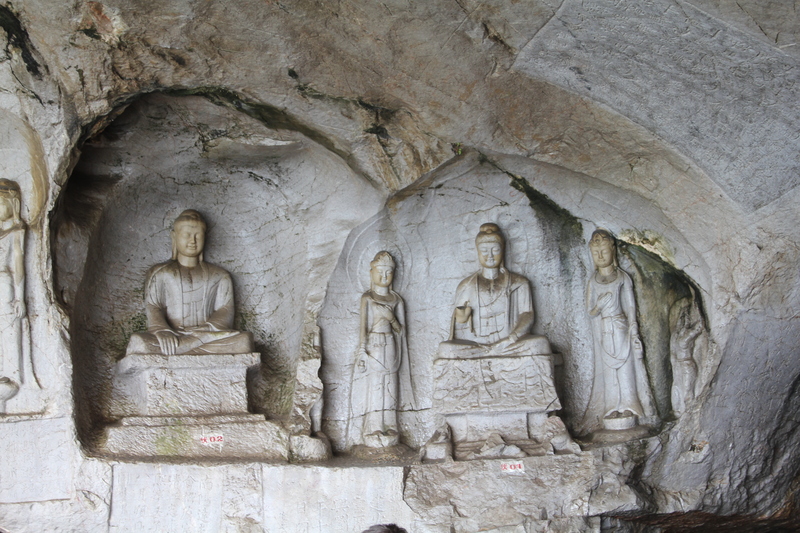 Inside of the huge stone hill are caves, with stone carvings, statues and walkways. The back of Fubo Hill Park opens onto water. There are caves everywhere! 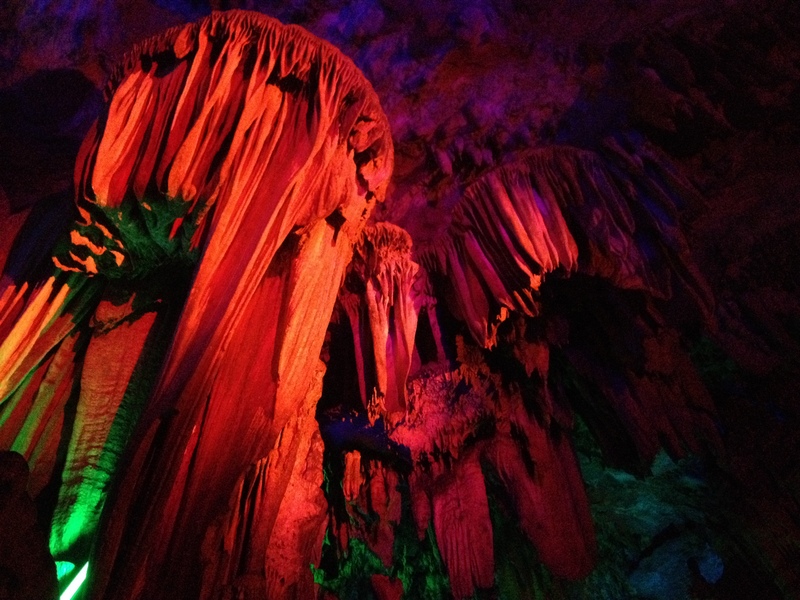 After spending a few hours at Fubo Hill Park, we then set off for Reed Flute Cave, which is absolutely stunning. 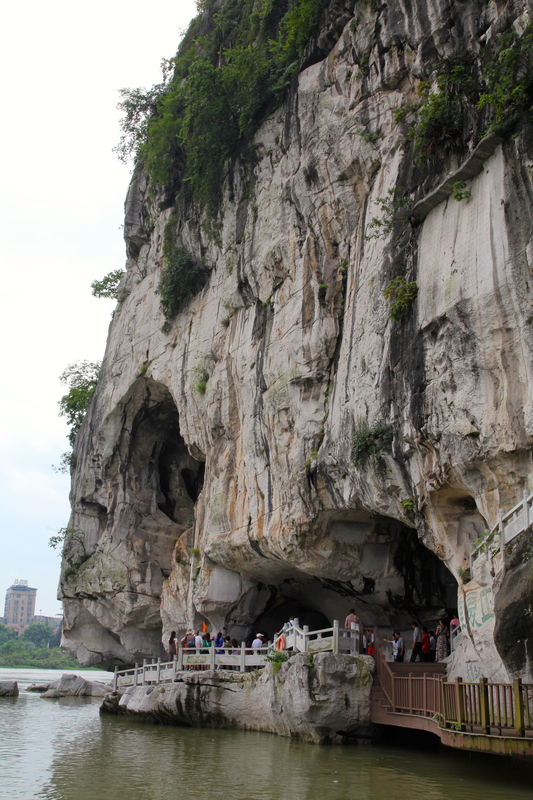 The cave received its name in the Tang Dynasty (618-907) for the numerous reeds growing outside the cave. 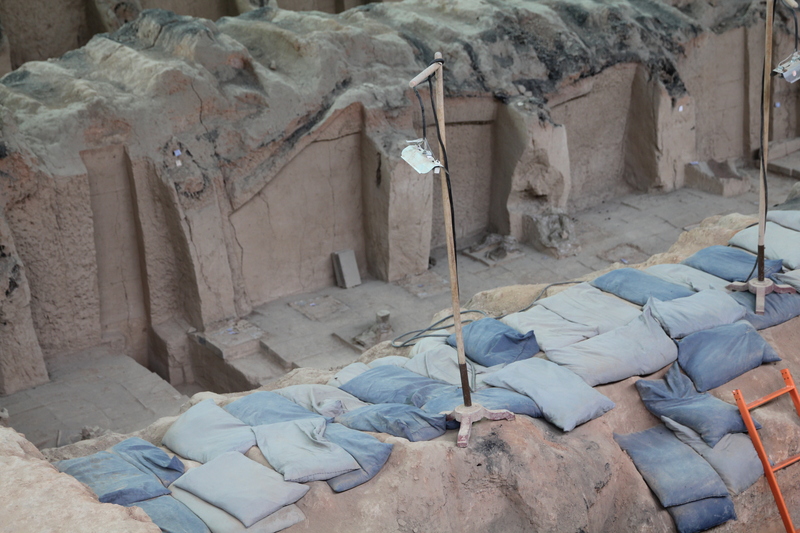 Back then, the local children liked to carve the reeds into flutes and even today, children can be seen around the cave’s entrance offering to sell the reed flutes that they make to visitors. 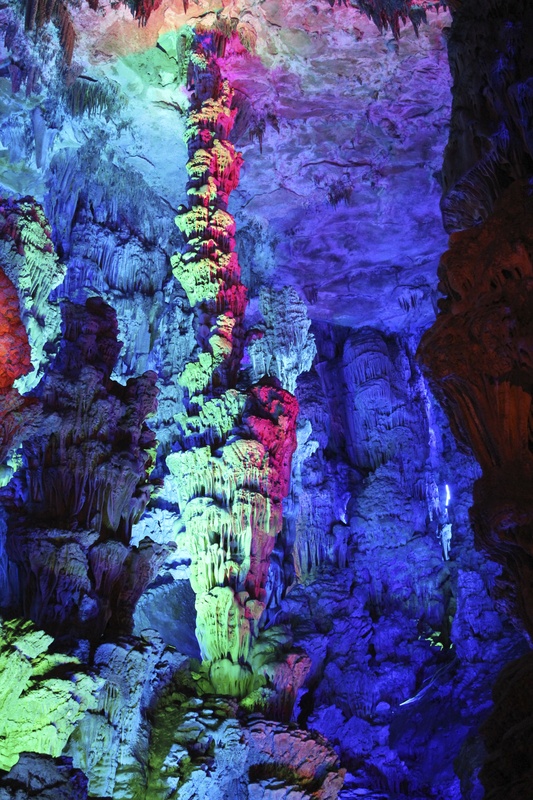 What makes Reed Flute Cave so marvelous are the stalactites, stalagmites, and columns that can be found inside the cave and the very creative and effective lighting for tourists. 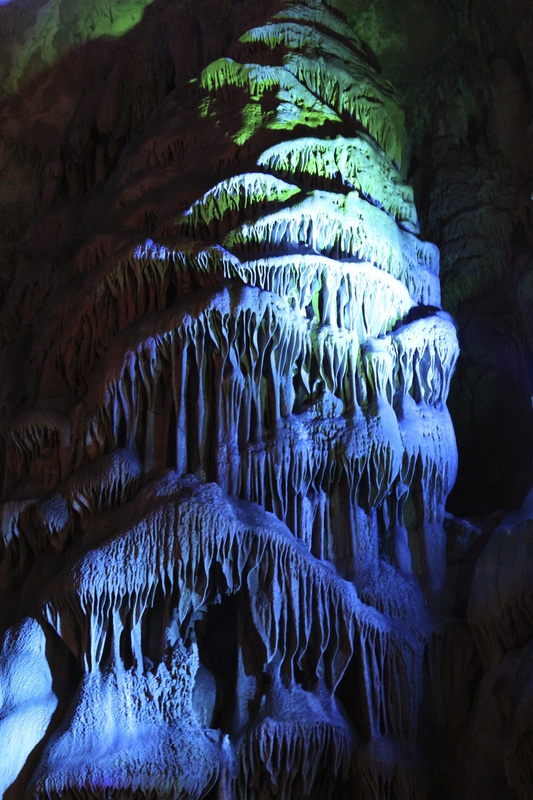 The formations were created over thousands of years by dripping water. 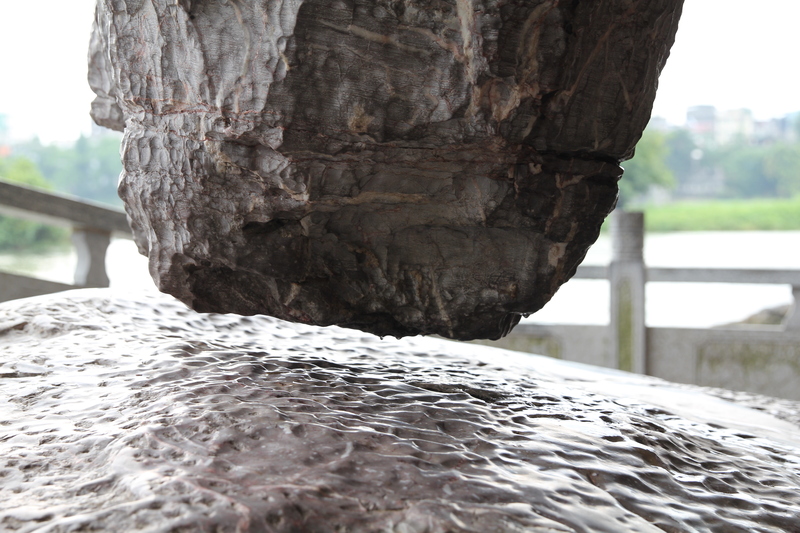 A very small amount of calcium carbonate located in the water adheres to the stone with each drop. When the drop hits the floor of the cave it also leaves a small calcium carbonate deposit that will eventually become a stalagmite. These formations sometimes meet and become a column. They grow on average of one millimeter per year. 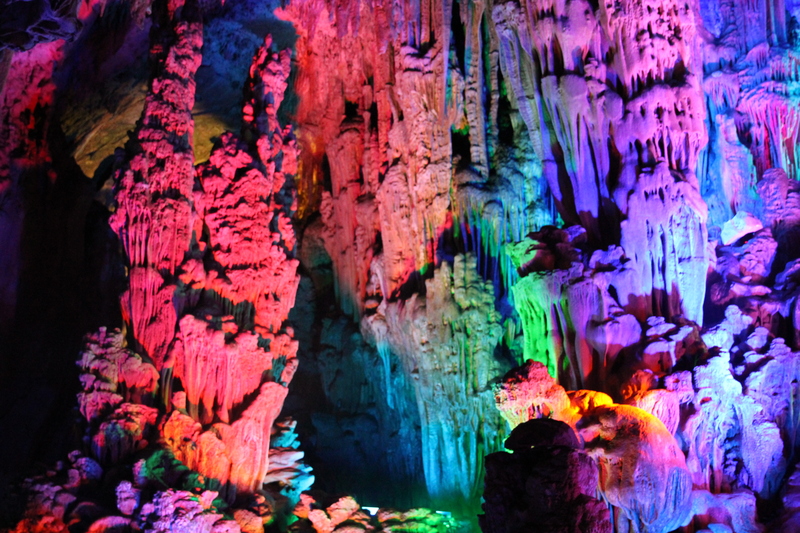 The formations can be quite astounding and the ones found in Reed Flute Cave are particularly beautiful. 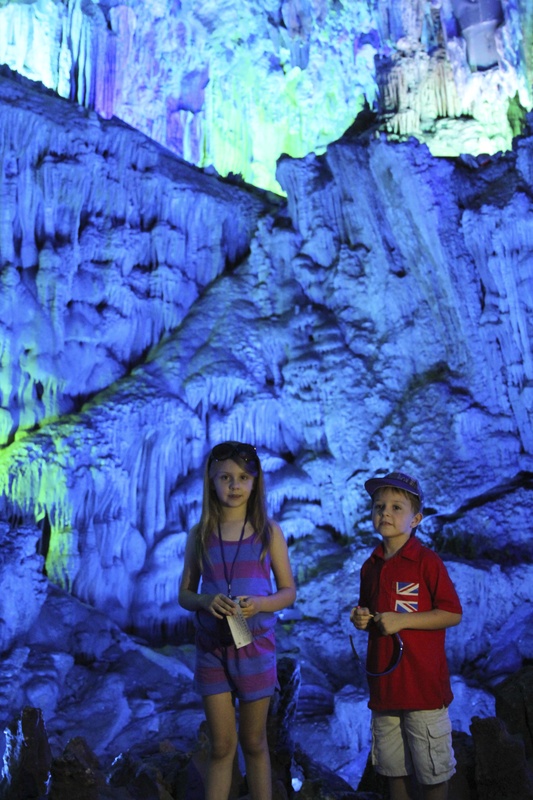 The beautiful lighting against the fabulous stalagmites and stalactites. 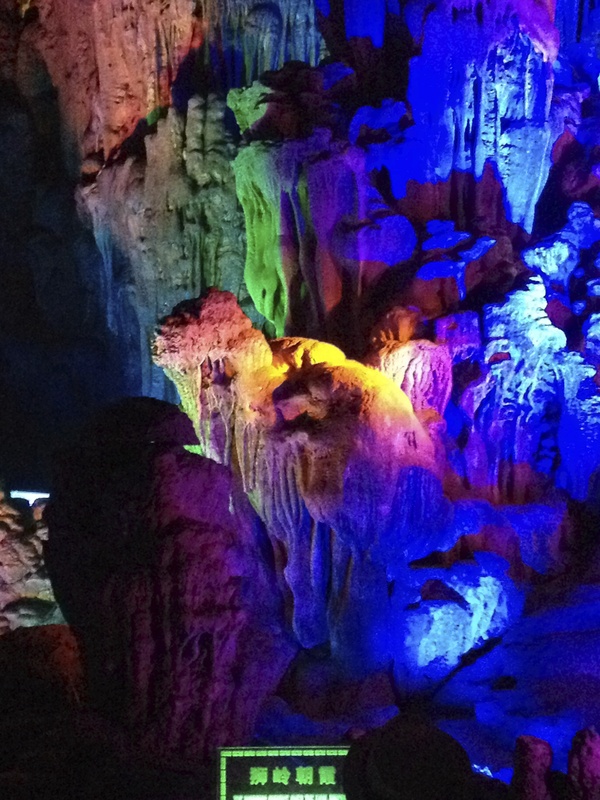 While walking through the cave, you can use your imagination to feel like you are being transported to different environments. Some sections seem like a forest of crystal trees, while others seem like underground mountain ranges and even cities. The strange formations can sometimes seem unworldly. 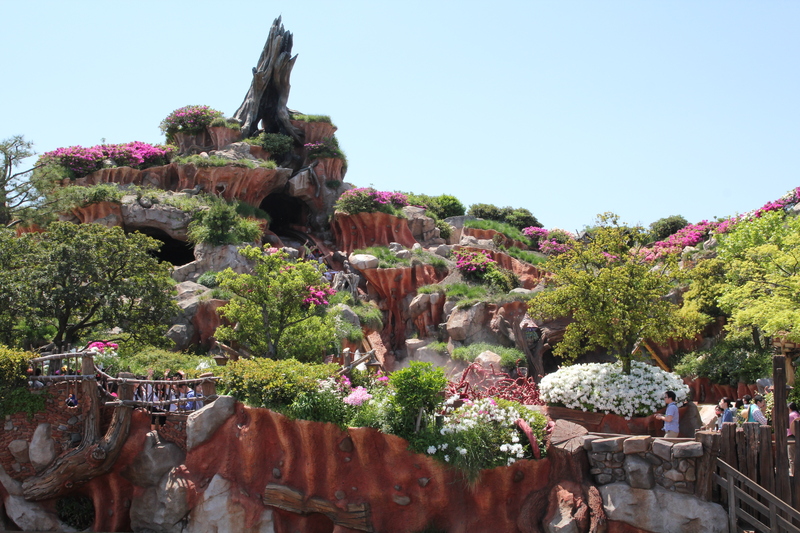 Many of the formations have taken on recognizable shapes of mythological creatures, or natural images. There is one formation that even looks like Santa Claus with his sack on his back. Due to the darkness of the cave, it is quite difficult to get a photograph that can express the same feeling as actually being there. This one looks like mosquito nets hanging down! 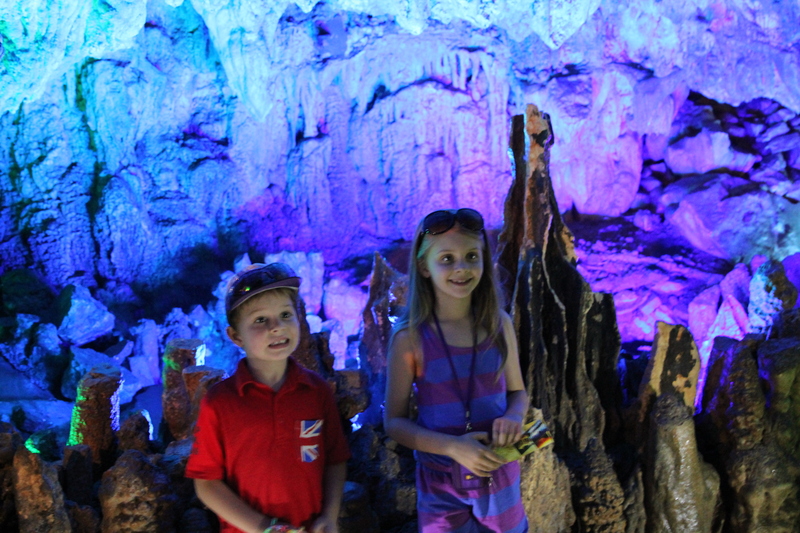 The kids loved the cave – it is huge and quite breathtaking. We spent ages looking at the different formations – everyone’s imagination interprets them in different ways. A giant ice cream sundae! The lighting really makes an impact when you are walking around. 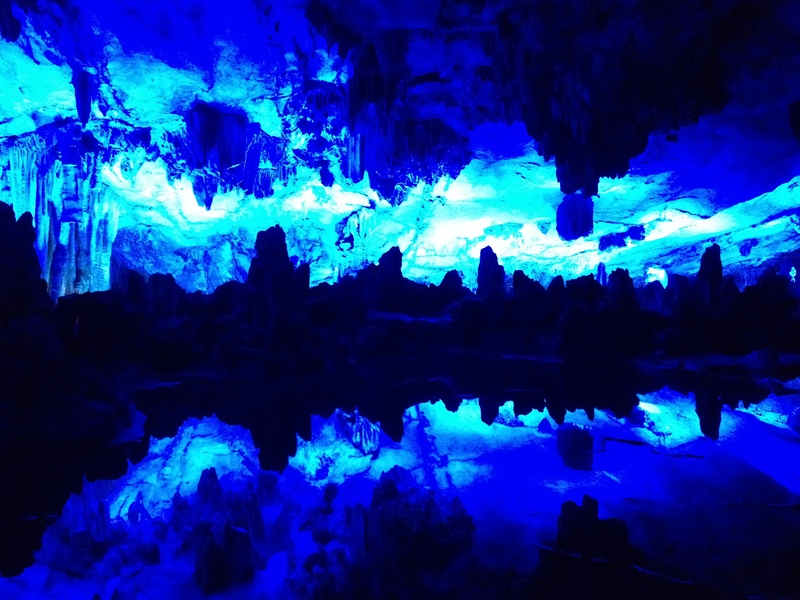 The cave is over 240 meters in length and it takes visitors approximately one hour to walk through the entire cave. The cave’s route is U-shaped and the exit and entrance are very near each other. 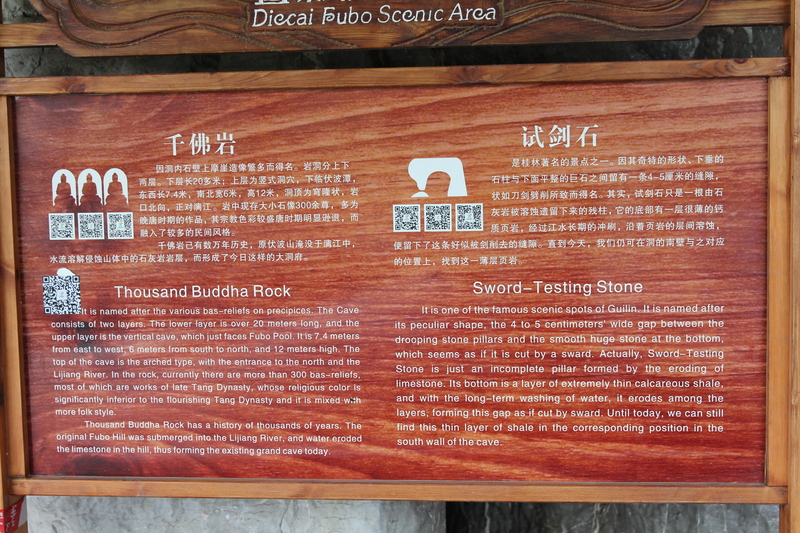 There are over 70 ancient stone inscriptions that can be found in the cave. 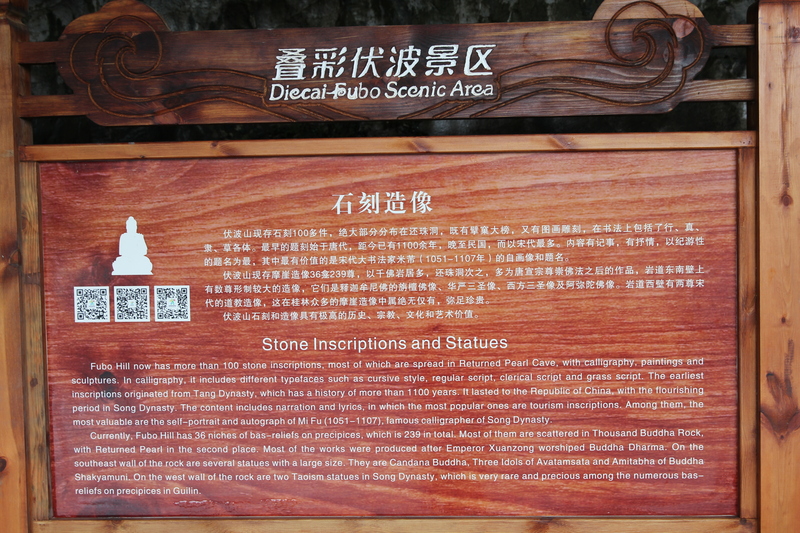 They are travelogues and poems writing by Tang Dynasty literati who visited the cave and found it so beautiful that they wanted to leave their thoughts behind for future generations of visitors. 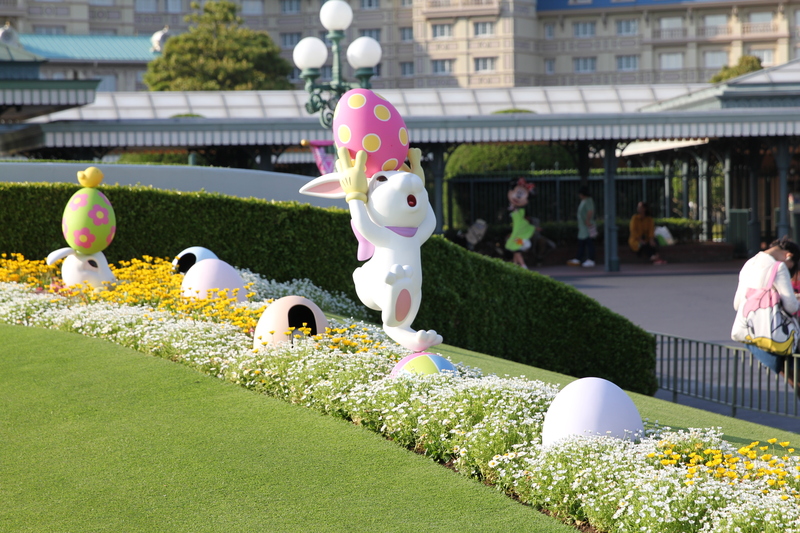 It is a magical place with so much to see. 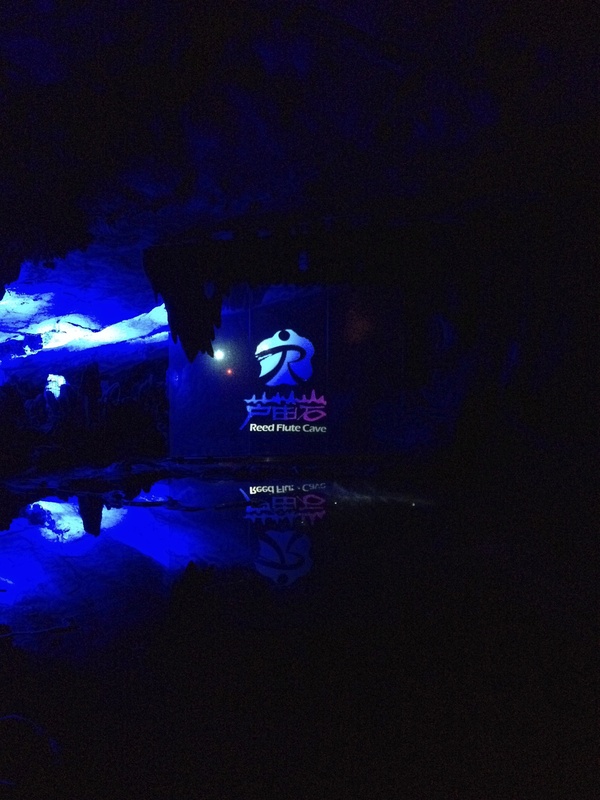 Every 20 minutes there is a video projection in the main great cavern space. 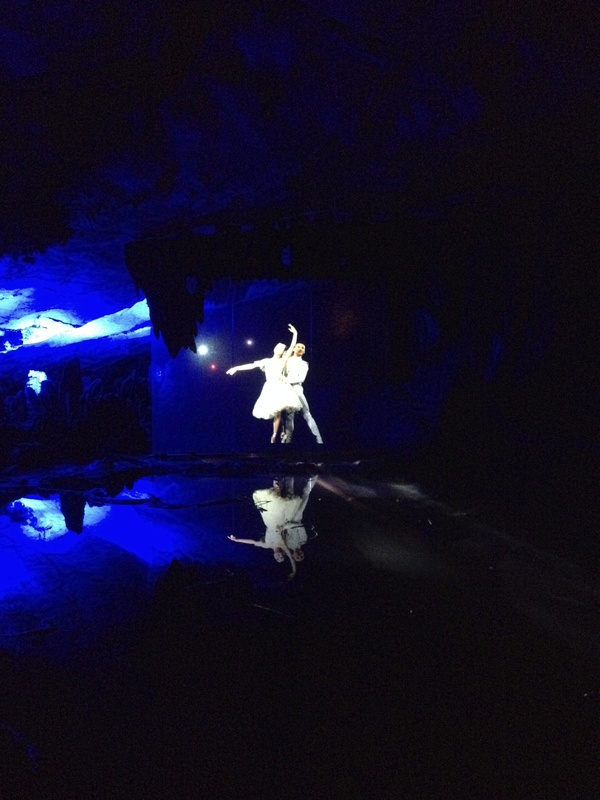 It fast forwards through millions of years of history around the Cave and finishes with a ballet projection. It is all beautifully done. 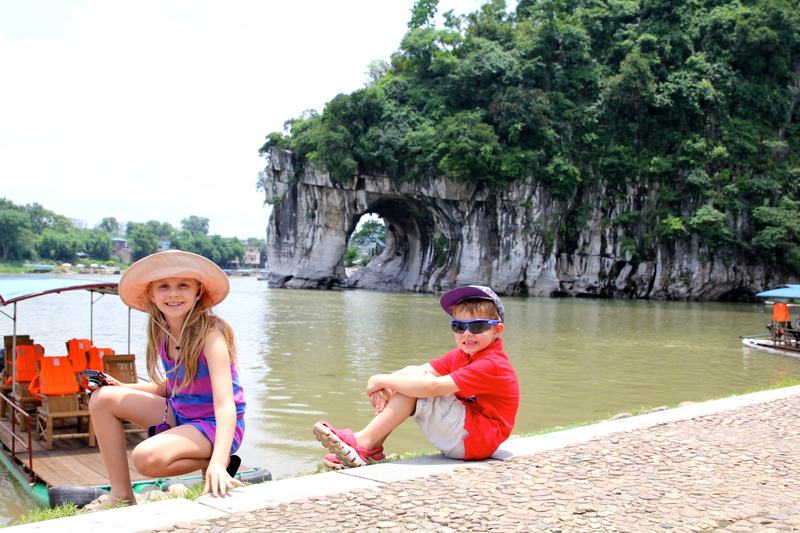 Outside the Reed Flute Cave, walking through the grounds by the river and lakes. 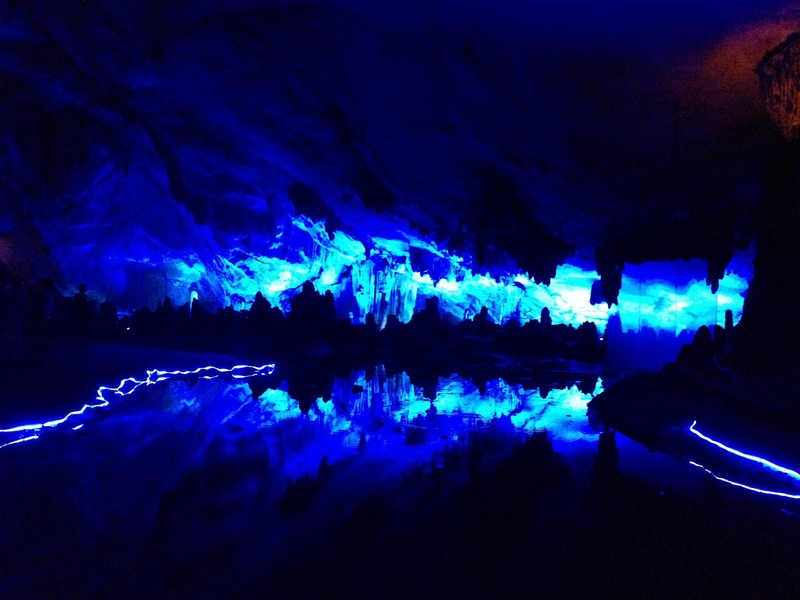 The view from the other side (outside Reed Flute Cave). After the Reed Flute Cave we went on to Elephant Trunk Hill. 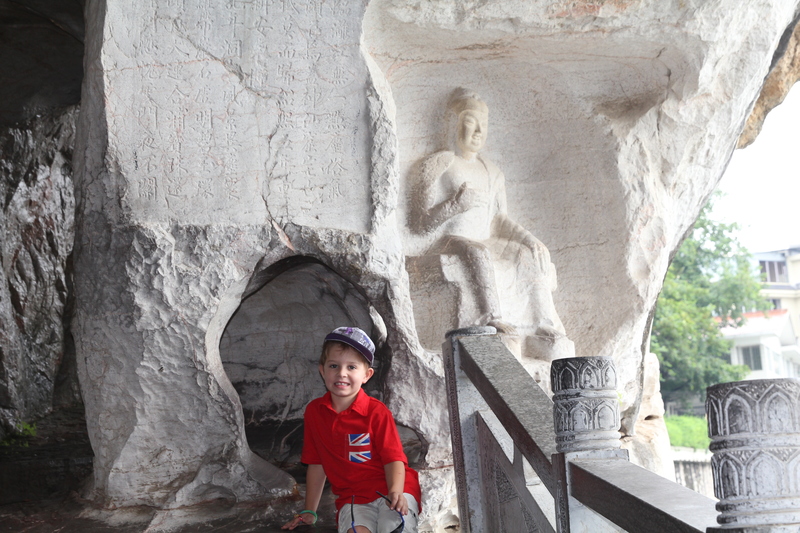 On the top of Elephant Trunk Hill sits a pagoda named Puxian Pagoda. 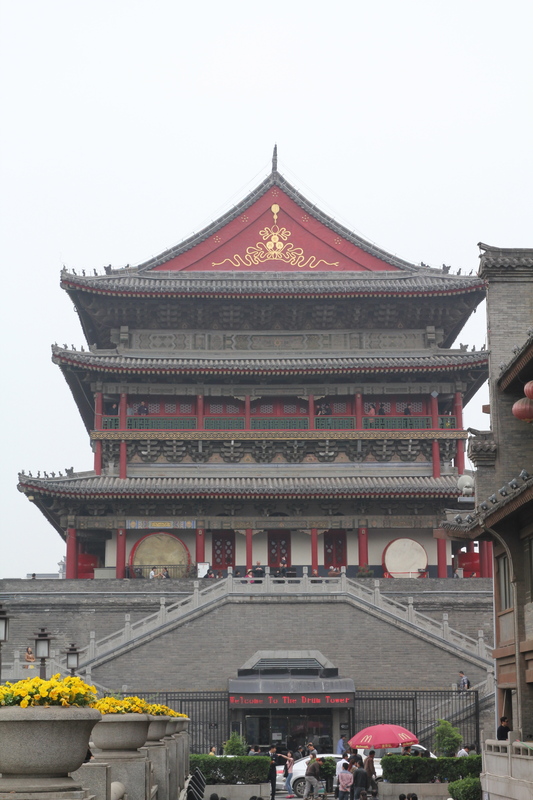 It is 14-meter-high, and was built during the Ming Dynasty (1368-1644). The pagoda looks like the hilt of a sword sticking out of the back of the elephant. There is a ancient legend that in times long ago, the Emperor of Heaven set out to conquer Earth commanding his troops from the back of the elephant. 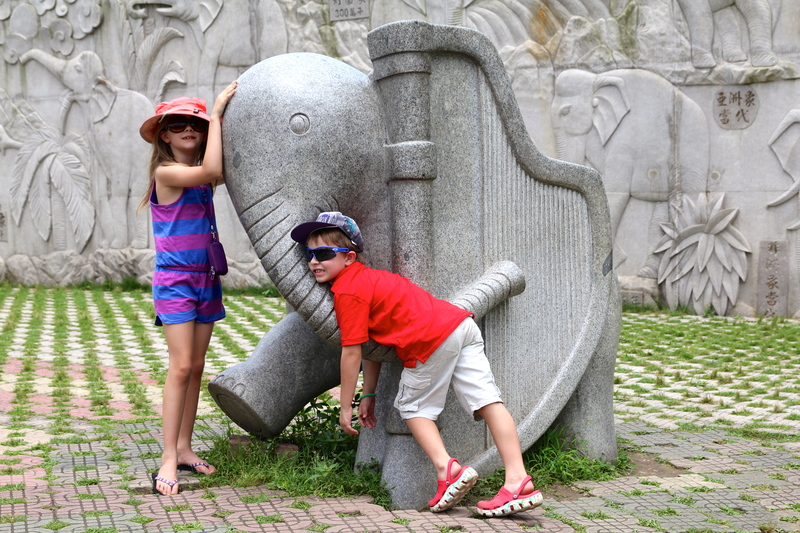 The elephant worked so hard to provide transportation for the Emperor of Heaven, that it became seriously ill. The local farmers nursed it back to health. The elephant being extremely grateful, decided to desert the emperor and stay on earth to help the farmers plow their fields during a time of famine. The Emperor of Heaven was so angry, that he thrust his sword into the elephant’s back and turned the elephant into the rocky hill. The pagoda erected on top of the hill stands for the hilt of the sword. 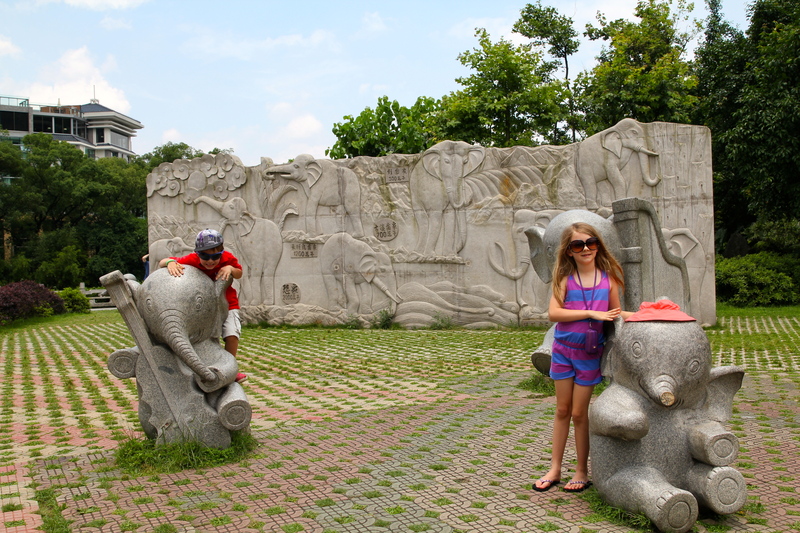 Now this kindly elephant can forever stay with the friendly people of Guilin, guarding the city and welcoming guests from all over the world to this beautiful city. Lots of elephants by Elephant Trunk Hill! The cormorants who put on quite the fishing show! Back to the hotel pool for swimming in the afternoon. It is the rainy season so we had to sit out for 20 mins but the kids were laughing about it. 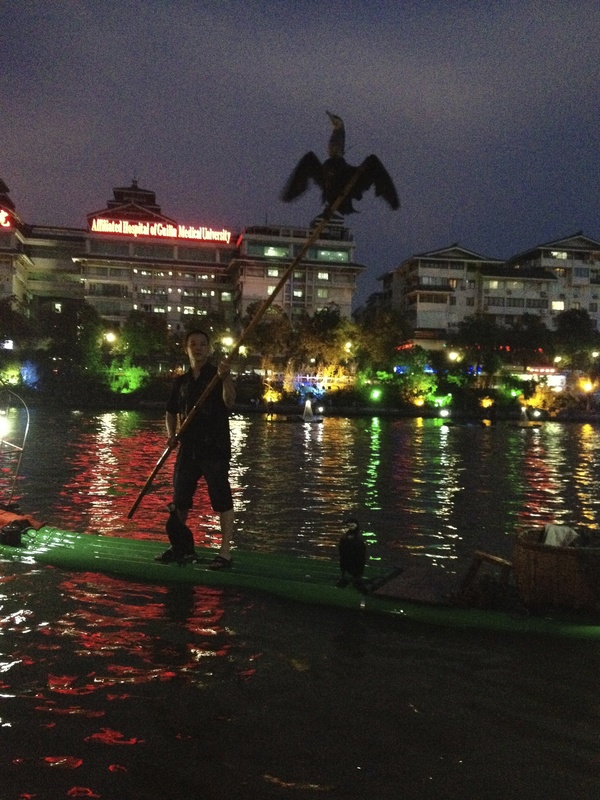 We did dinner in the hotel (club lounge) as we were in a bit of a hurry to do the night river boat tour. It was a beautiful evening to walk from our hotel to the local wharf where there were at least 8 boats waiting to take people out for an hour. Lily had met us at the hotel to walk with us. There was a motorbike show outside the front of our hotel with some Evil Knieval type stunts going on!!! This boat trip was quite the treat as all along the way there were entertainers for us: musicians, dancers, actors and actresses. All the trees were beautifully lit along the whole journey which took about 1 hour. 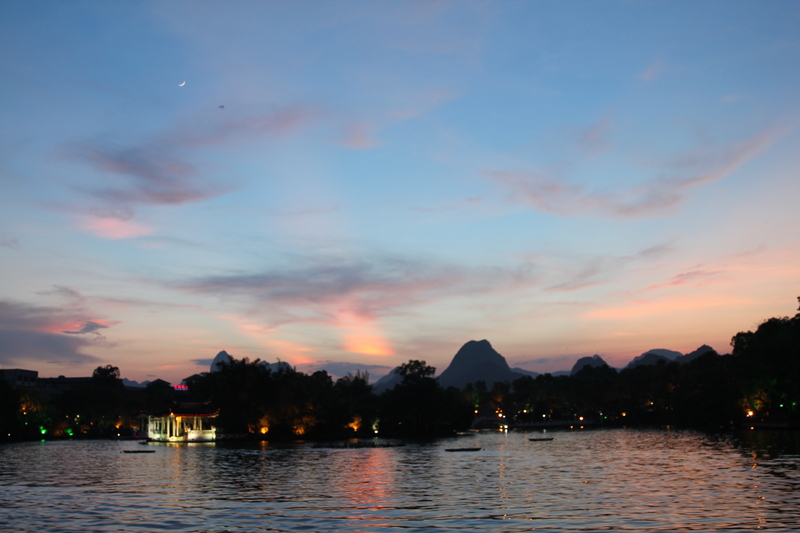 The late afternoon view of the sun and moon pagodas. 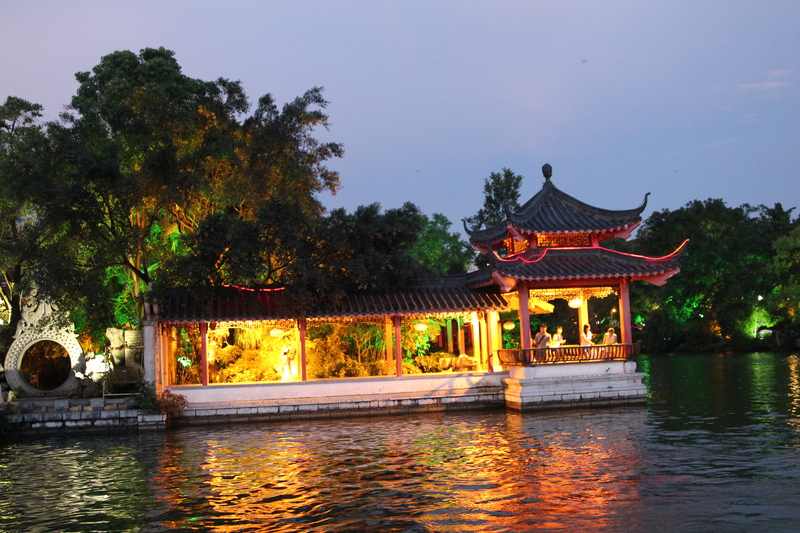 The Sun and Moon Twin Pagodas is situated in Shanhu (Shan Lake). 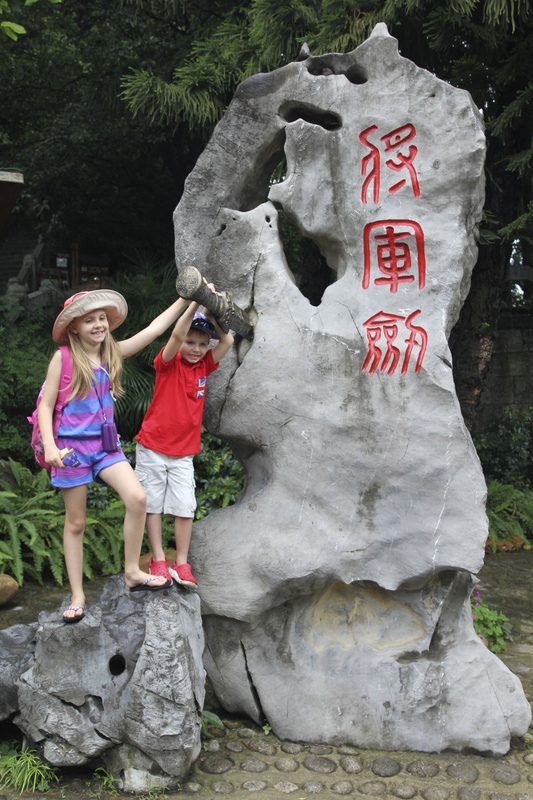 The word sun and moon in Chinese character written together mean brightness. 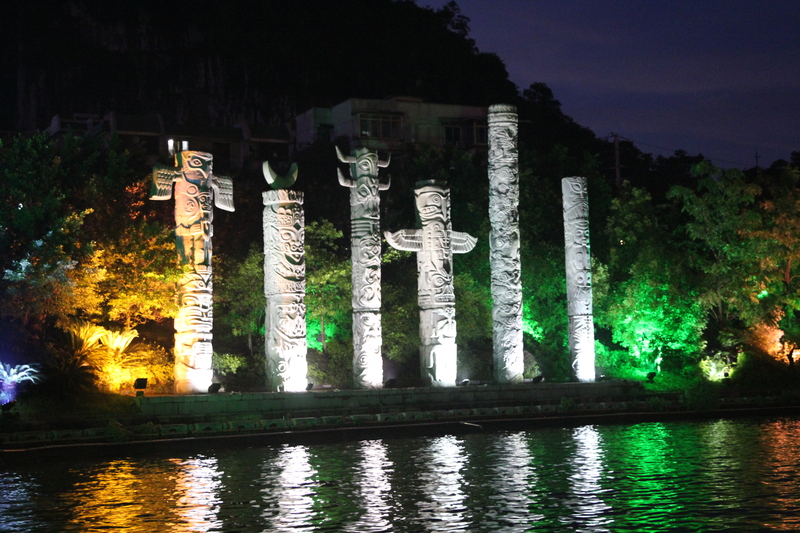 Some say it symbolises the future of Guilin is bright. 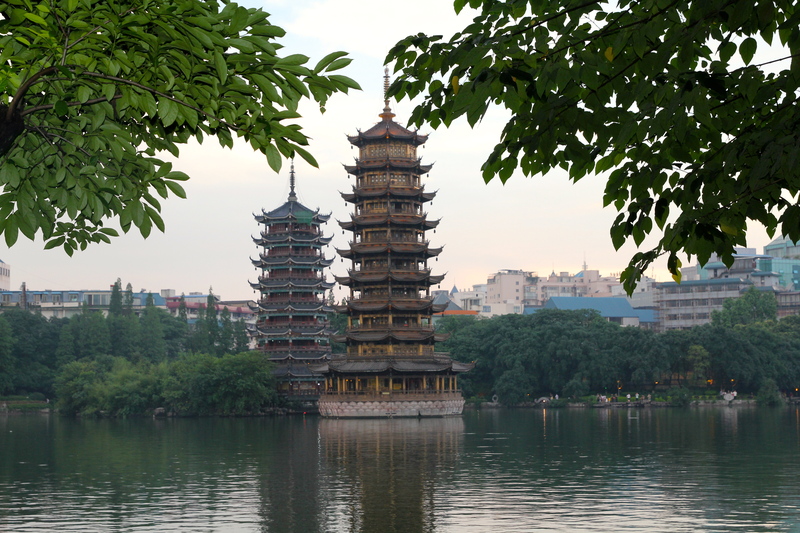 The Sun Pagoda is constructed with copper, it has 9 floors and reaches a height of 41 metres. 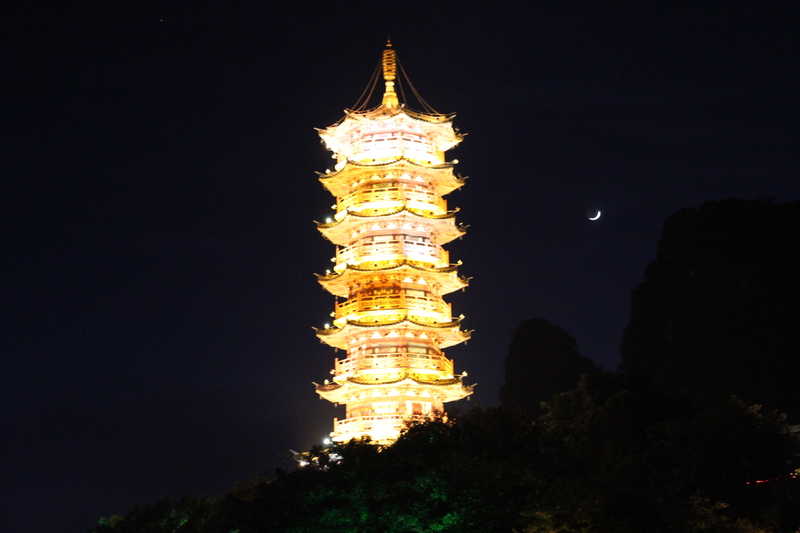 The Moon Pagoda’s is made of marble; it has 7 floors and measures 35 meters high. 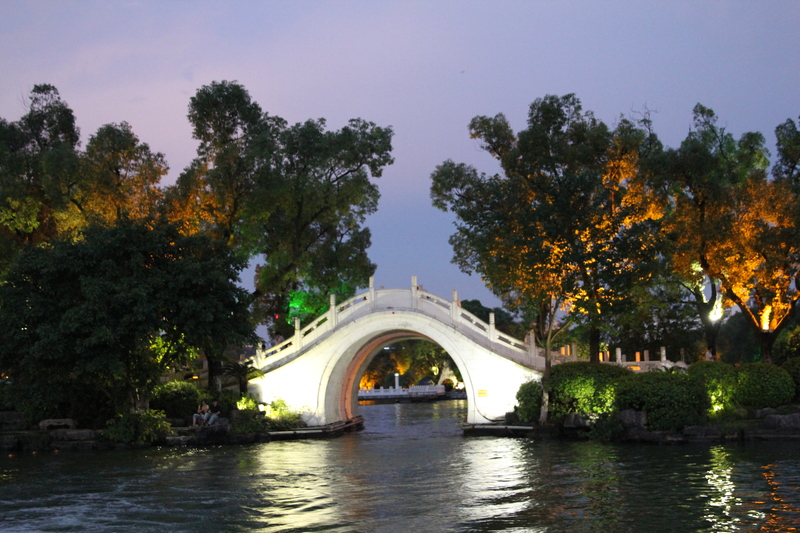 The two pagodas are connected via a tunnel at the bottom of the lake. 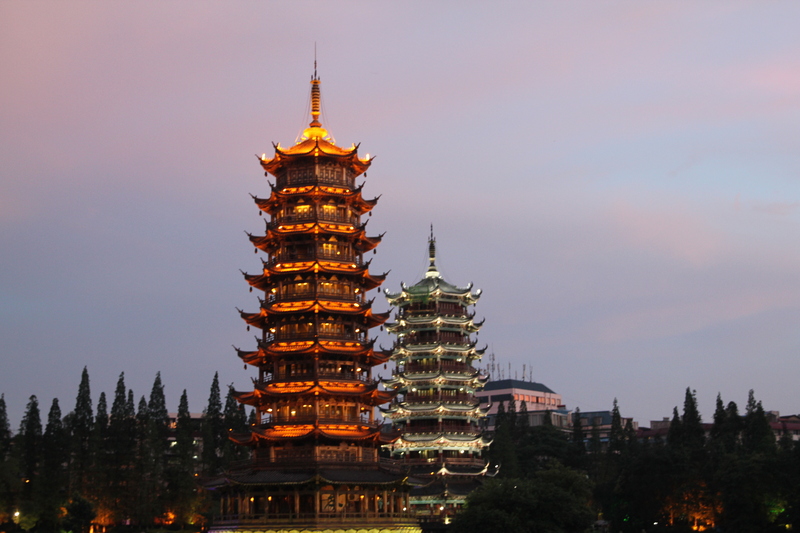 The Sun and Moon Pagoda’s just lit at the start of sunset. Our boat was just about to set off. 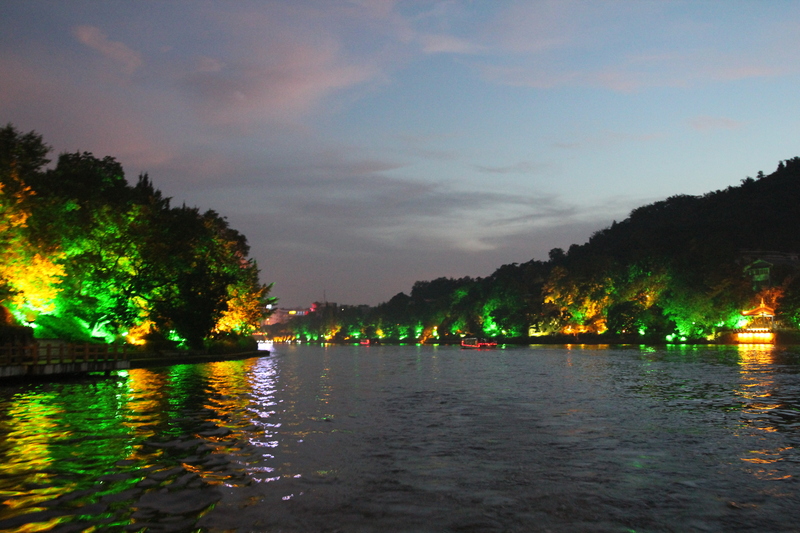 Another view from the boat. 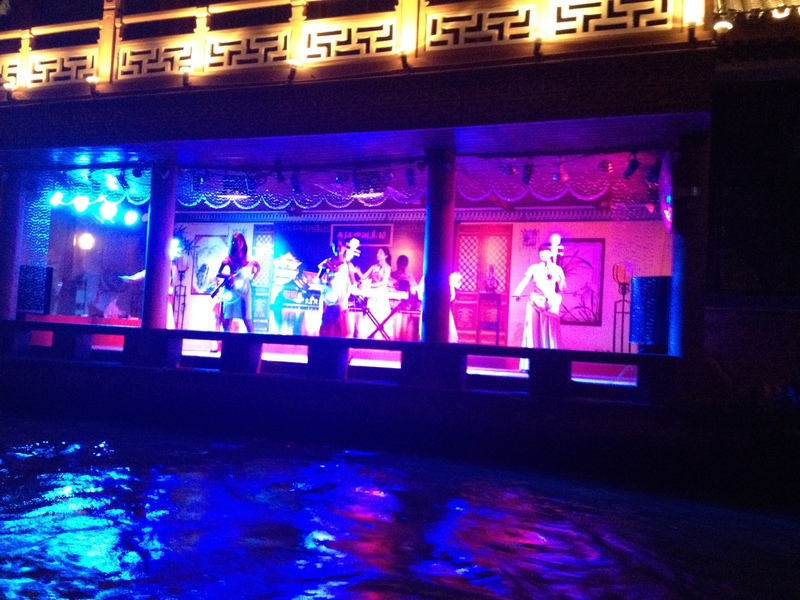 Entertainment along the river banks during our night boat ride. We passed under many bridges. 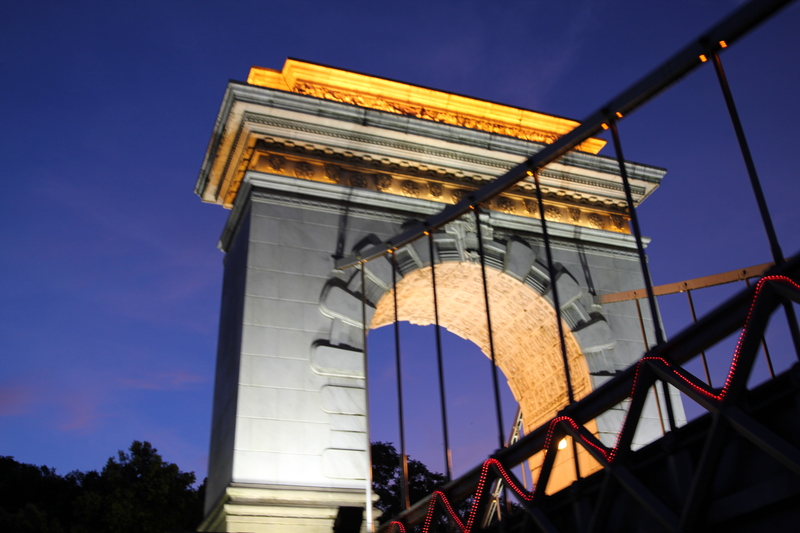 Many are modeled after famous bridges around the world! 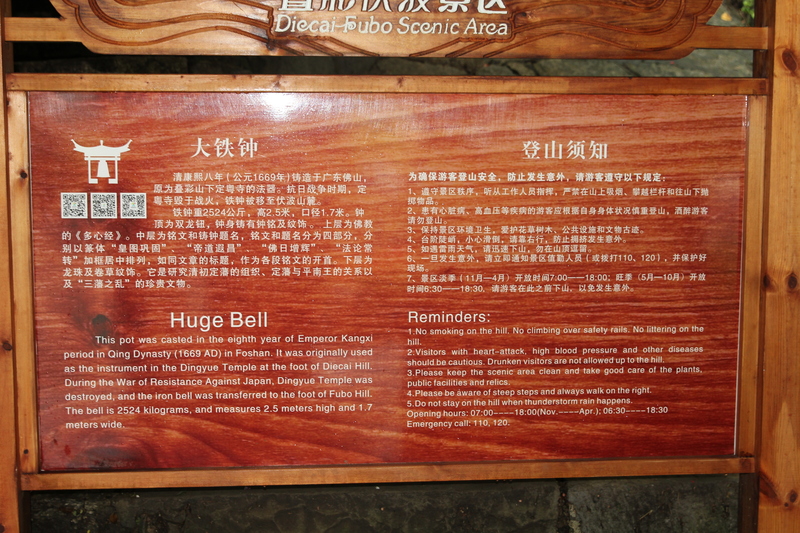 I really liked the detail of the Chinese scripture on this bridge. Look closely under the arch and you can see how much detail is there. 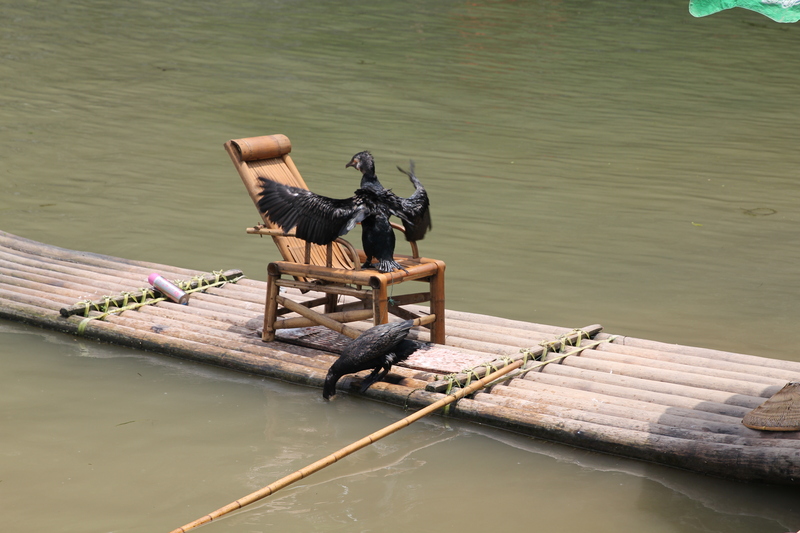 One of the attractions here is the cormorant fishing show. 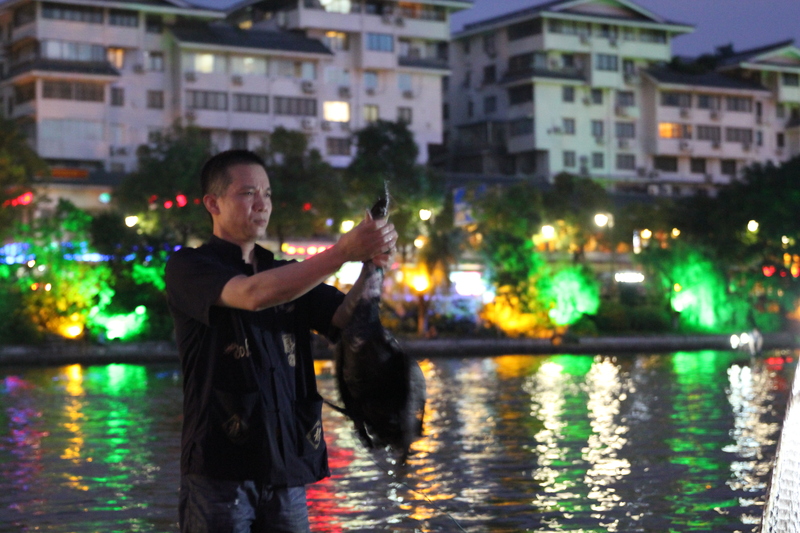 The birds dive down and catch the fish and then the fishermen massage the birds necks to get the fish out. Isabelle and Oliver did not like this as they thought the birds were getting strangled!! A cormorant about to dive down for a fish. The fisherman massaging the neck to get the fish out. Artefacts along the river banks. Managed to capture the moon in this one too!! 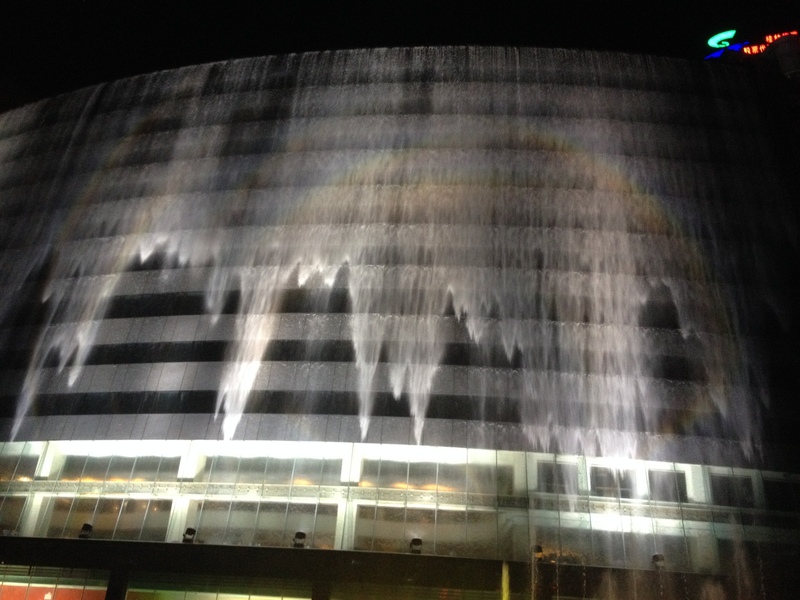 After the boat ride, it was a short walk back to the hotel but via the Waterfall hotel because at every day at 8.30pm for 10 minutes the hotel has a waterfall of water from their roof plus synchronised fountain display to music. We stayed to watch and then headed back for a good night sleep after such a busy day! The waterfall at the Waterfall Hotel. 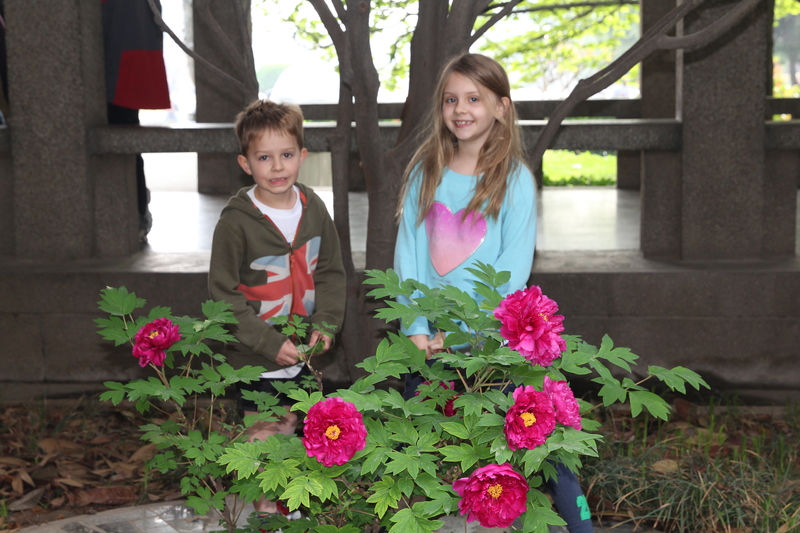 Isabelle and Oliver both had their Sports Days at BISS this week. They are in the Li House (used to be called Dragons) and the sports are organized by house. 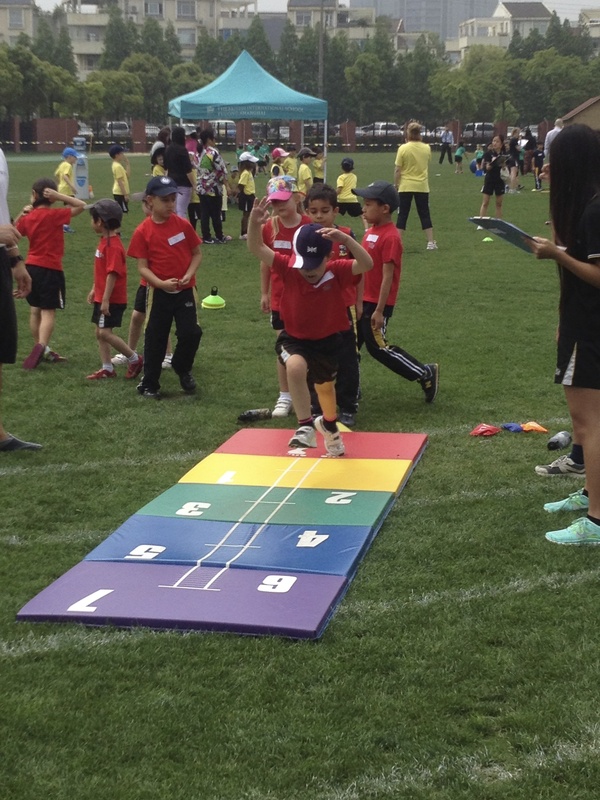 Each student is competing for house points and there are no individual winners for first place in the activities. I do like this approach at the younger age. 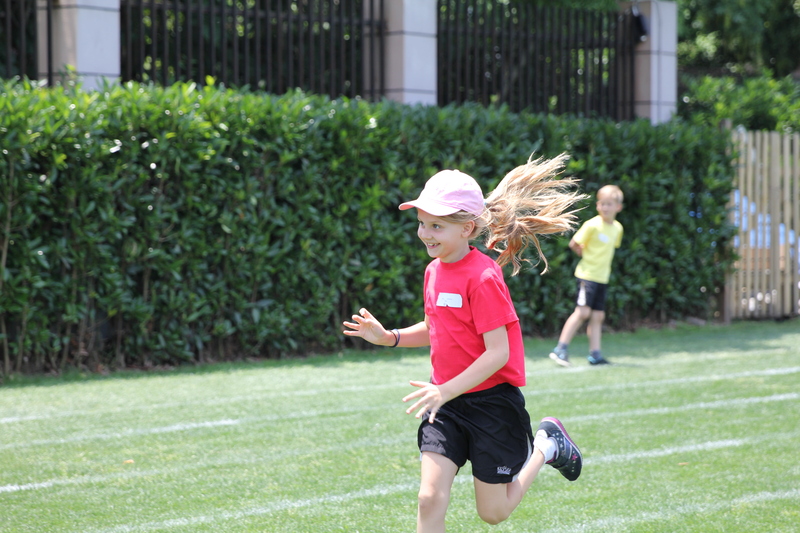 Oliver’s Sports Day was Tuesday May 20th and Isabelle’s was Thursday May 22nd. We have had quite a bit of rain this Spring/Summer, so I think that everyone was relieved that we had dry days for the competitions! The competitive areas were set up in the center of the field, with each station taking 2 or 3 minutes to compete. The emphasis is on the team to score as many points as possible so everyone is cheering each other on. The parents can walk around the outside to watch their children as they move from station to station. 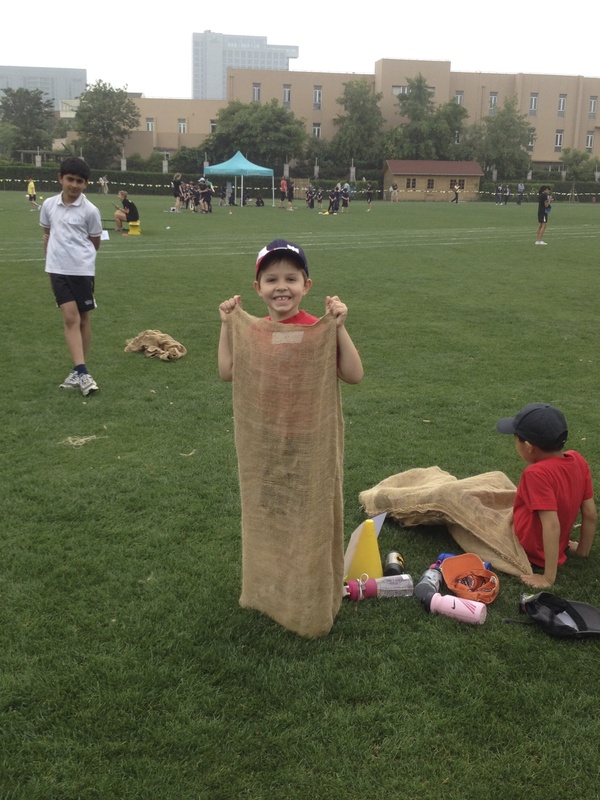 Getting ready for sack race. Jumping as high as he possibly can while getting encouraged by the coach! Oliver was pretty good at hurdles! Made it to number 5! Half time snacks for the Infants. It is a wonder they could compete after all this good (sugar loaded!!) food. For the Junior’s, they also add some individual competitions, but again, you are winning points for your house and not for a first place prize. 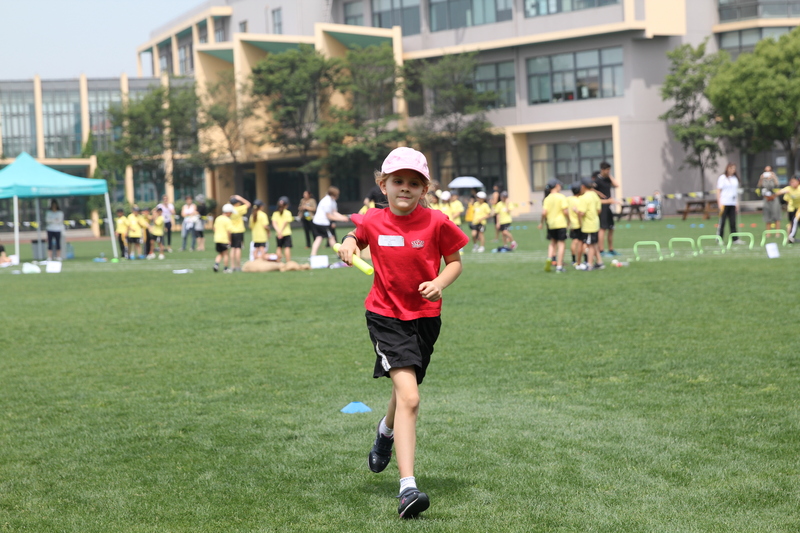 So, long jump, shot put, 100m race were all additional activities for Isabelle! 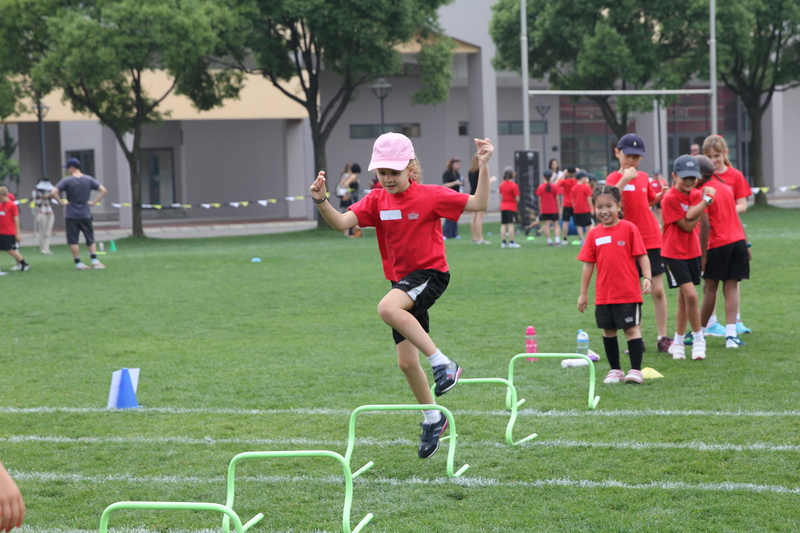 Isabelle was good at hurdles too! They achieved a record for the relay station! There was a rest station after every 4 or 5 activities. 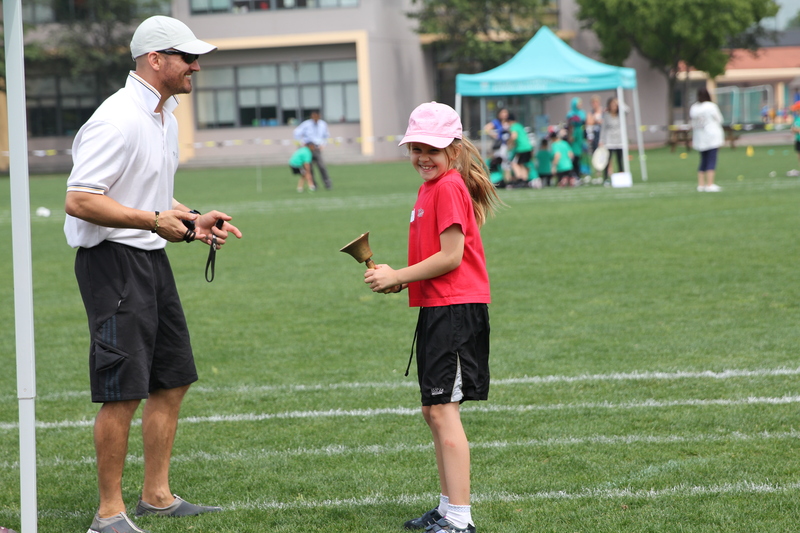 When you reached the coaches rest station, they picked 1 person to ring the bell to start and stop the 3 minute timer. Here is Isabelle ringing the bell! 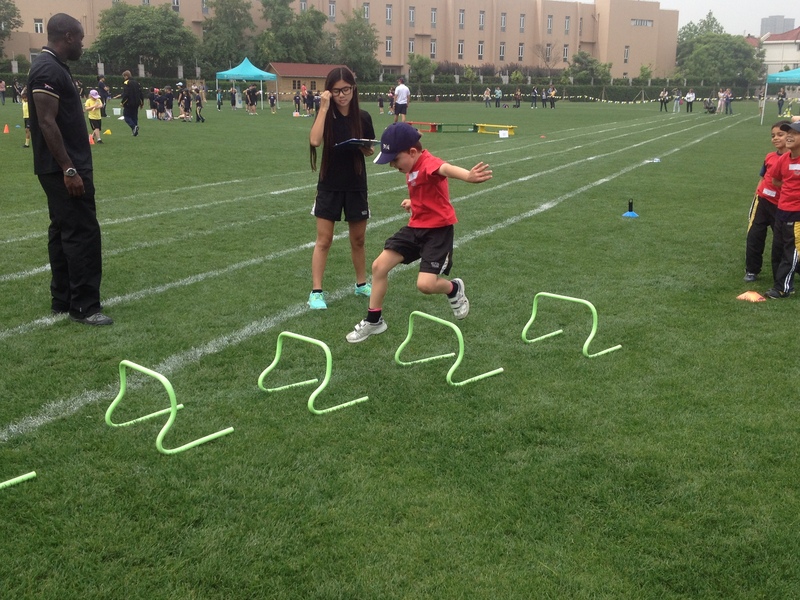 Much to Oliver’s delight, Li House won in the Infants Sports Day (Year 1 and 2). Li House came 2nd (out of 4) for Junior’s – Year’s 3, 4 and 5. 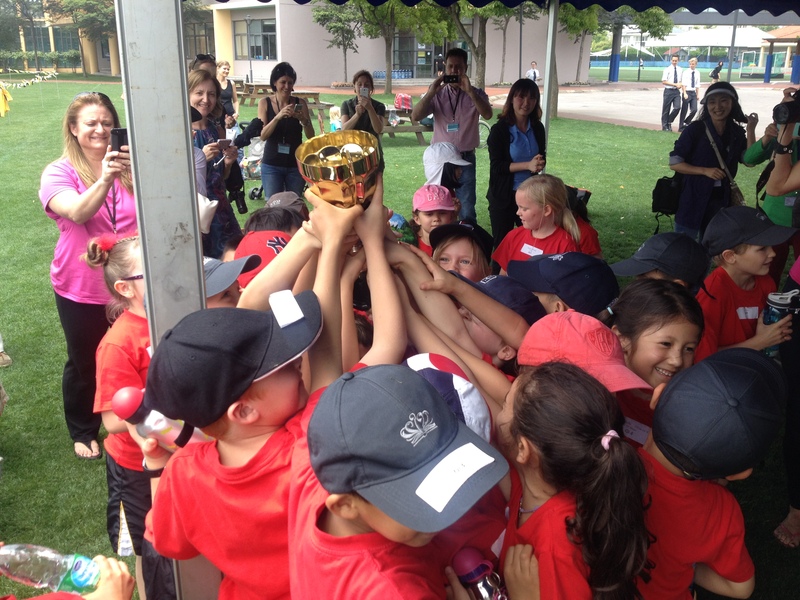 As many hands as possible trying to raise the cup for winning the Sports Day cup for their house. Li House won the day for Infants! All the kids got a chance to pose for photos with the cup. 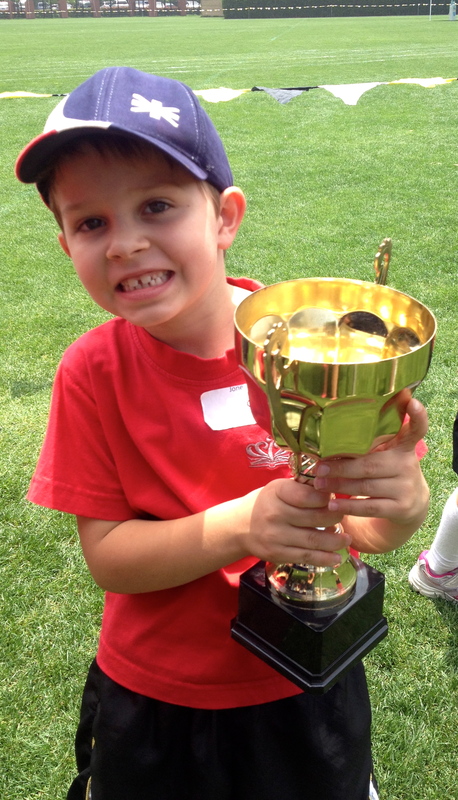 Here is Oliver – so proud that his house won! 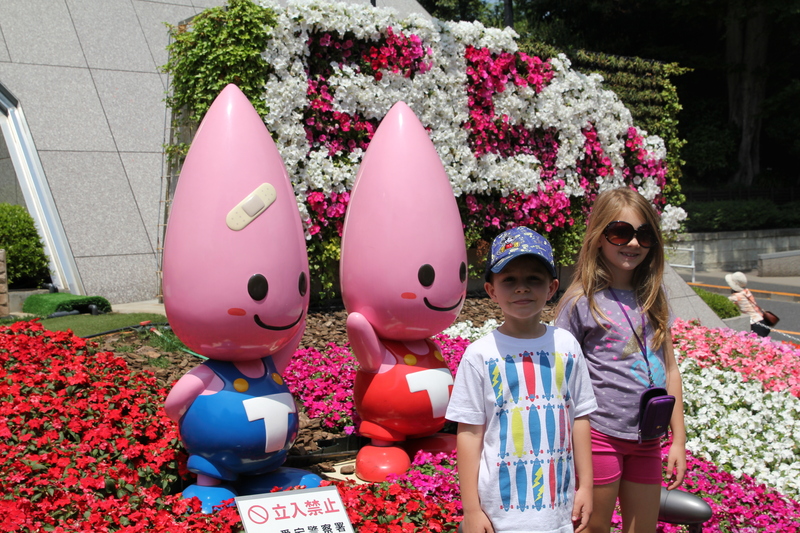 I was very proud that both of my children were obviously trying their very best at each activity. We emphasis effort, willingness and spirit. No-one can be the best at everything, but everyone can try their very best. That is what we expect from Isabelle and Oliver. And, on both of these Sports Days that is exactly what they did!! Thursday was a terrible travel day. We had got up early to get our 9.15am flight. When we got to the departure gate we saw that the flight was delayed, with no reason or estimated departure time. After waiting for 90 minutes at this gate, a gate change was announced (the opposite end of the airport!) so we hurried over with the assumption that we would be boarding. However, it was another case of “hurry up and wait” with no announcements and no information. It was incredibly frustrating to not know if we were going to be delayed another 30 minutes or 6 hours! I knew we were in for a longer wait when they started serving lunch at the boarding area…..
We eventually made it on to the plane at 1.30 and even this was drama driven. As we had had an equipment change, they were assigning new seats and hand writing on the new seat numbers. I could not read the numbers on our boarding cards, and was getting pushed from behind to move onto the bus. The gate agent shouted 32A to me and so I assumed that we would all be sitting in the same row. However, when we actually got on the plane, I discovered that Oliver’s seat assignment was 71H and Isabelle’s was 34C! I sat us all down together and then refused to move. It worked because they then had to move everyone else around us!! We then sat on the tarmac for another 90 minutes before finally taking off. 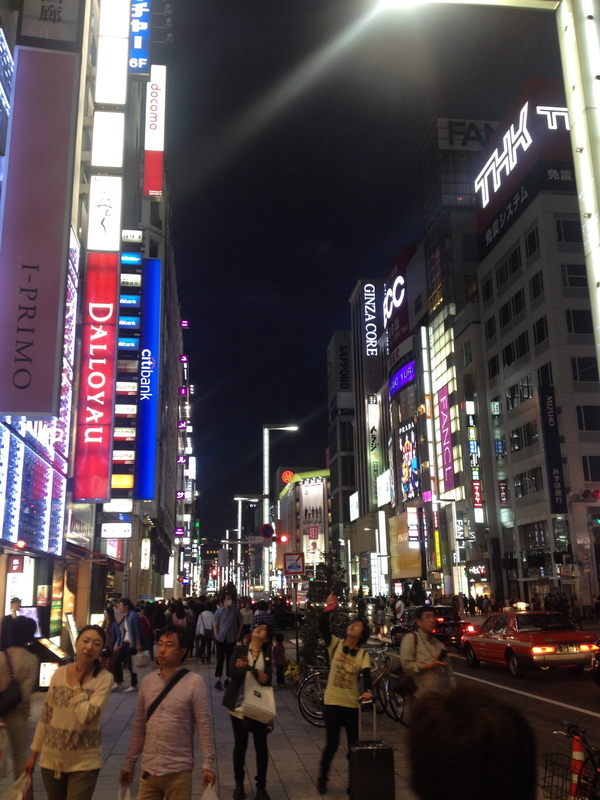 We landed in Tokyo at 6.30pm (a whole day wasted!) and I was immediately struck by the air – I could actually see clear blue sky. We found the Narita Express train station easily and then boarded very clean and comfortable train for the hour ride to Tokyo down town. 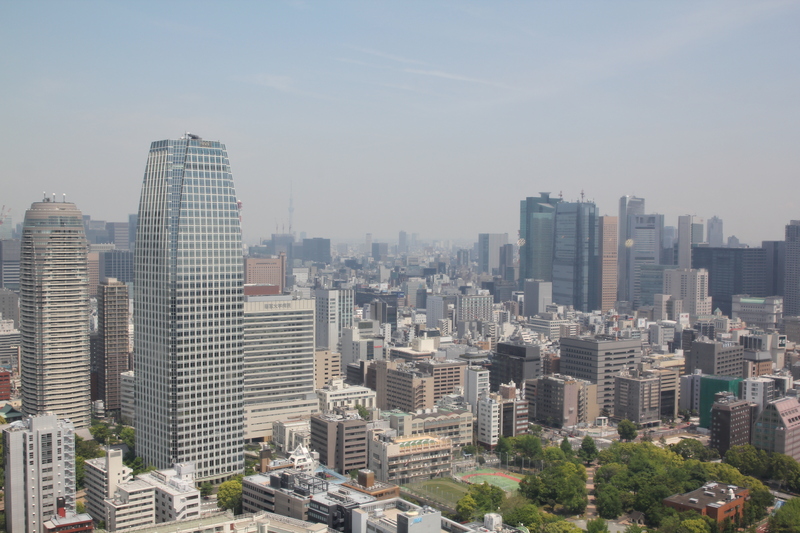 When we arrived at Tokyo Station, it was a little confusing as the station is HUGE and there are many different lines and many different exits. I had stopped to check my phone for the details on which exit to head for when a local asked if I needed help. When I told her which exit I was looking for, she said, “follow me and I will take you there”. 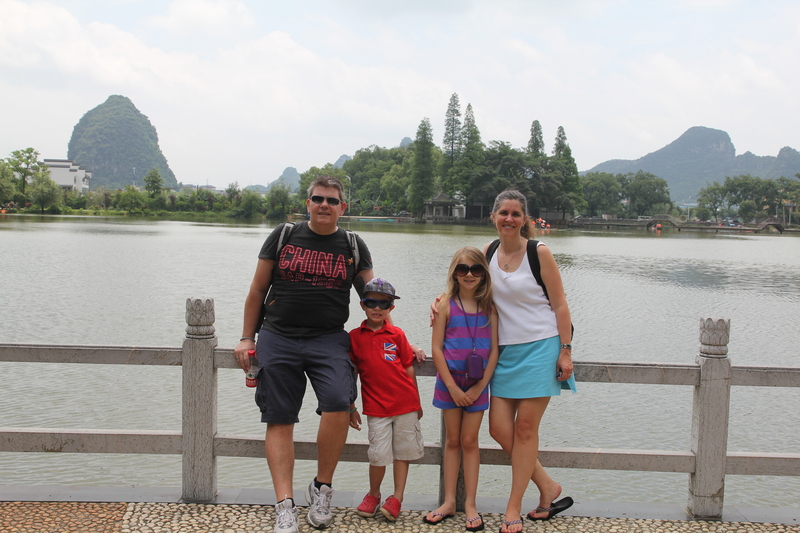 I was amazed – this was so helpful and not what I was used after 2 years in China! Our friends Earoel and Graham met us at the exit to walk us to the hotel we were all staying at (they had already been in Tokyo for 4 days). The Marriott Courtyard at Tokyo Station is in a great central location and proved to be a great base for the 4 days that we spent in Tokyo. We quickly checked in, dumped our bags and then immediately headed out for dinner. 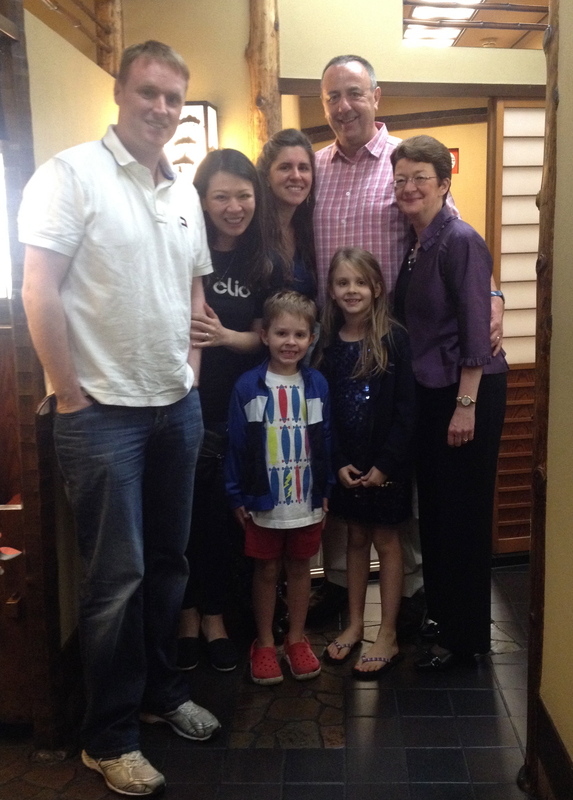 We walked a couple of blocks to a restaurant called Charcoal which was a Japanese BBQ. The tables had small grills in them where you cook your own food. We ordered a selection of meats and seafood and then had fun cooking it all. The kids enjoyed this and managed to act as Chef’s for us all! We were joined by a couple of colleagues from the Japanese office of my company which proved a good chance to learn a little more about Japanese customs as well as learn the words for; please, thank you and hello. 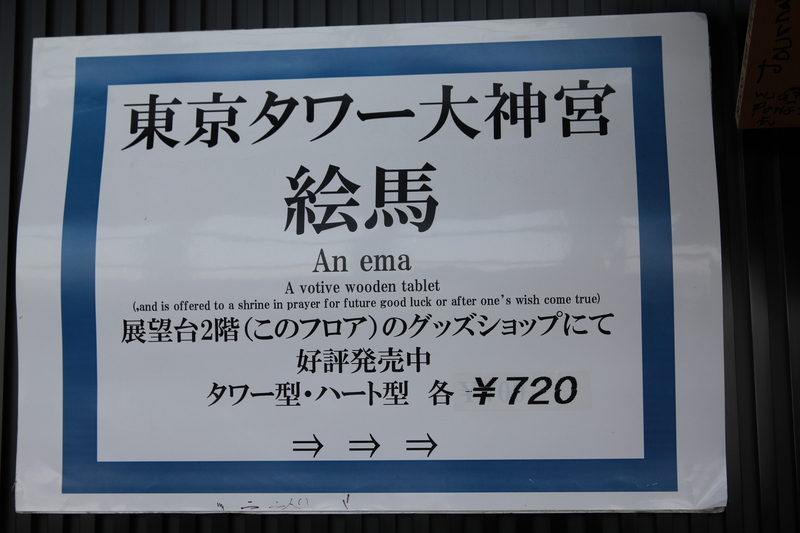 It is always good to know those words in any language!! 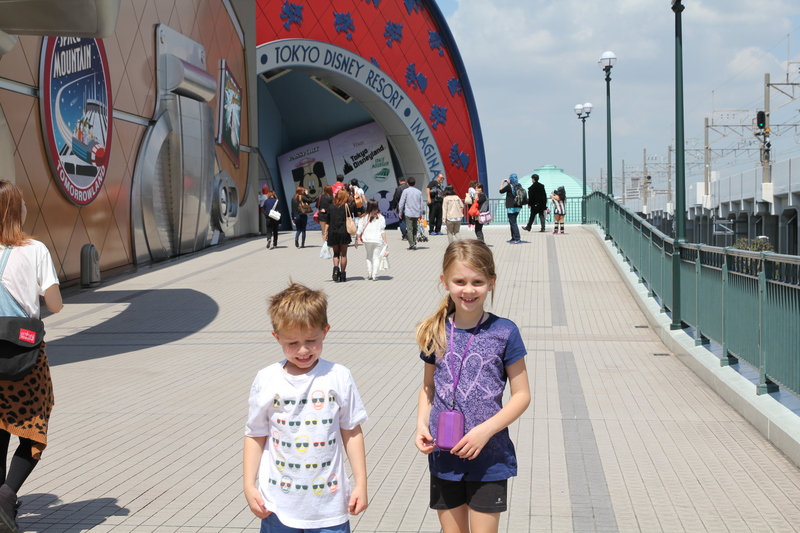 We rushed through breakfast so we could get on the train to Disney (15 minutes away from Tokyo Station). 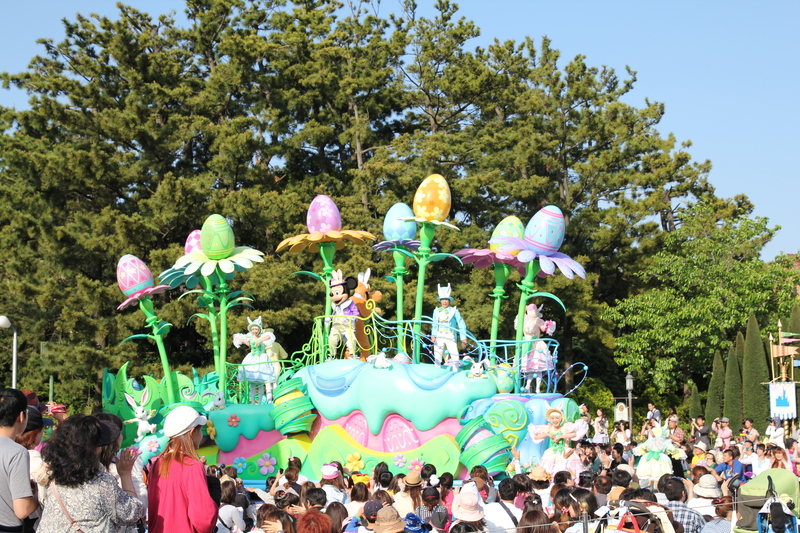 We arrived about an hour after opening time and it was already packed!! The day had dawned with clear blue skies and the sun was already beating down. 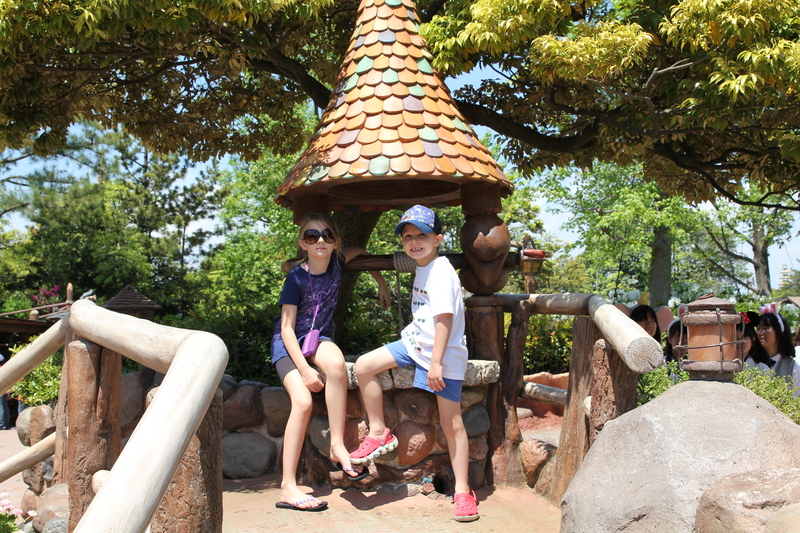 Although I had thought to bring sunscreen and had covered us all, the kids did not have sunglasses so our first stop was to the Disney store to buy sunglasses for Isabelle and a baseball cap for Oliver. 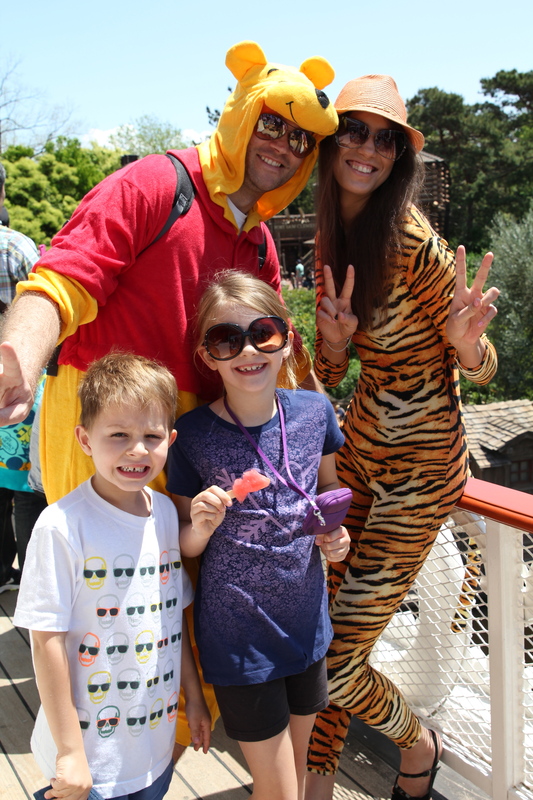 These were obviously hits with the kids as they then wore them for the entire trip! 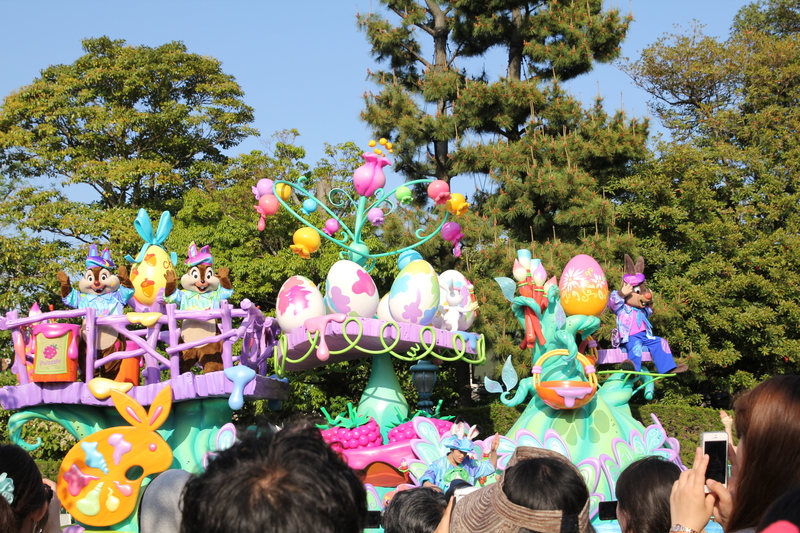 We then saw our first show – the Disney orchestra playing some well known songs from the movies. 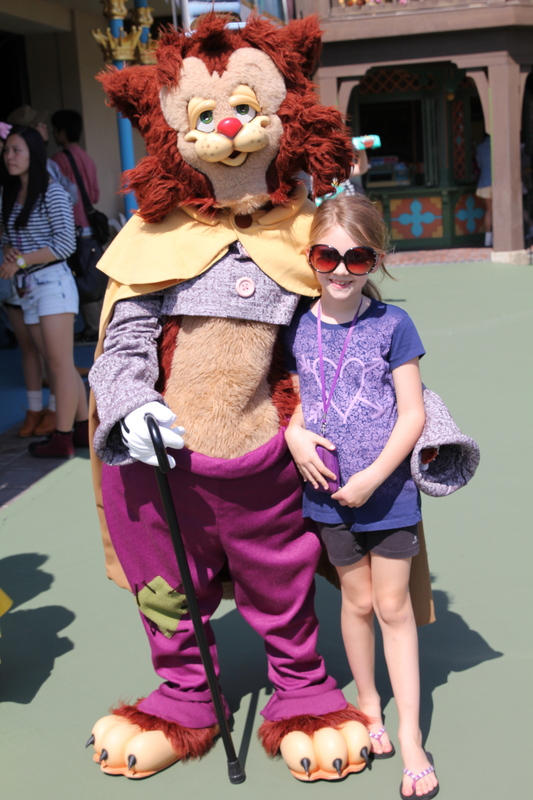 Woo hoo – Disney, here we come! 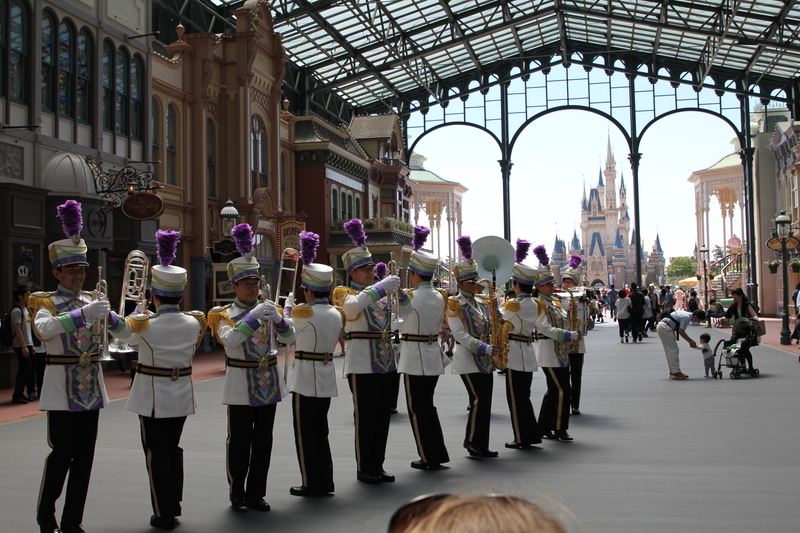 Japanese Orchestra playing well known Disney tunes by the entrance. 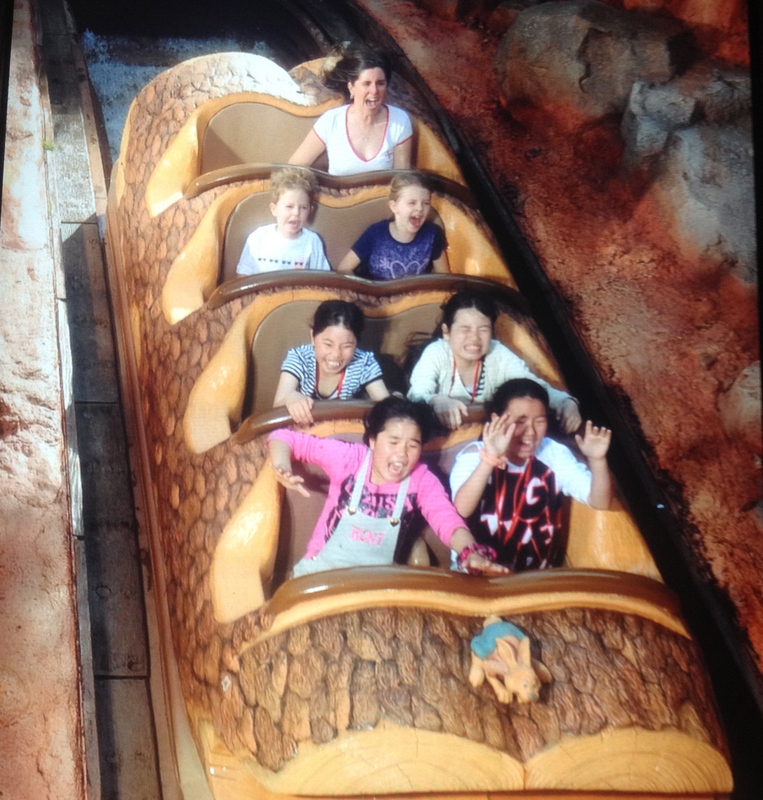 Splash Mountain is behind the kids. 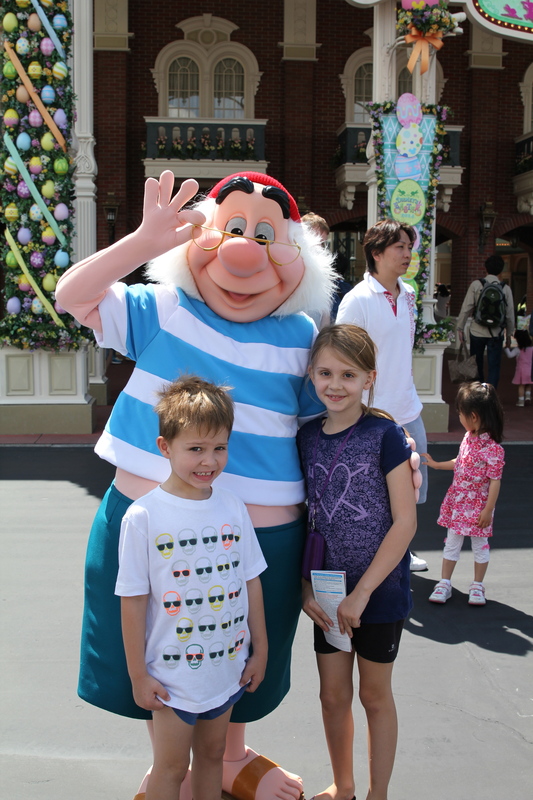 Getting a hug from Smee! 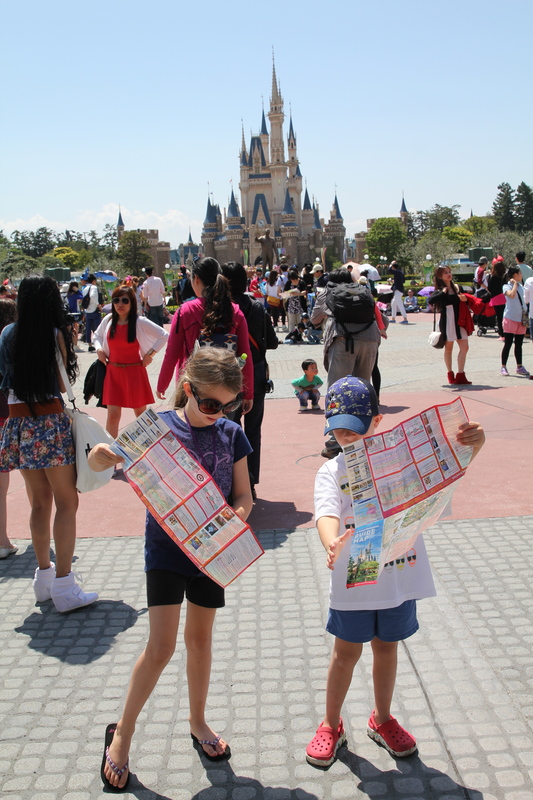 Graham had not been to Disney before and wanted to “experience the experience”. 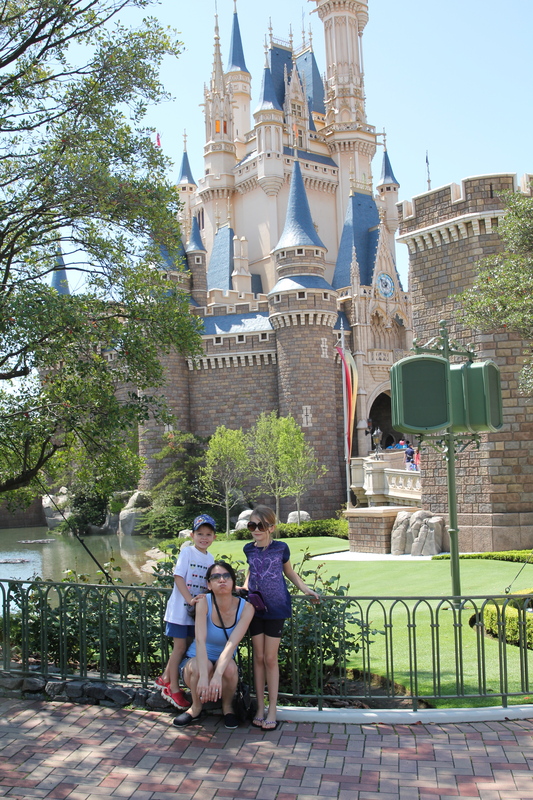 Isabelle and Oliver had been to Disney in Florida (September 2011) and their memories were of 10 minutes of queuing (timed it perfectly for FL!!) 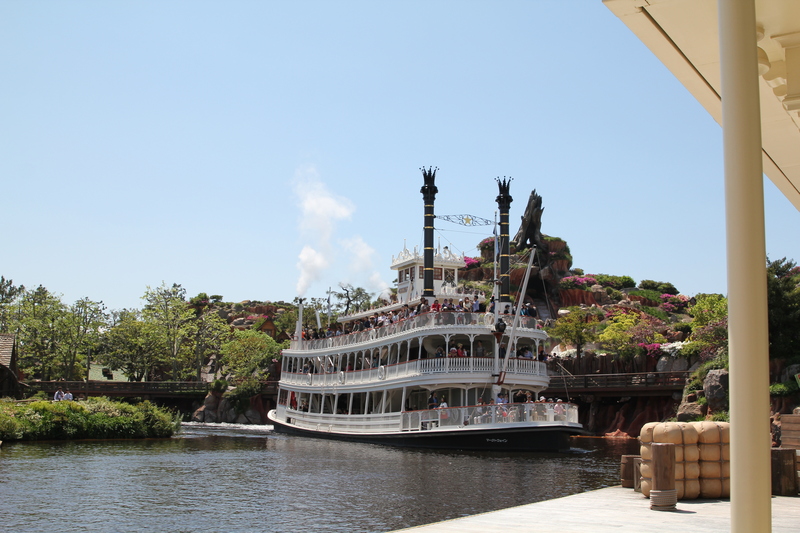 even for the very popular rides back then. We could not believe our luck at how many rides we got to go on. 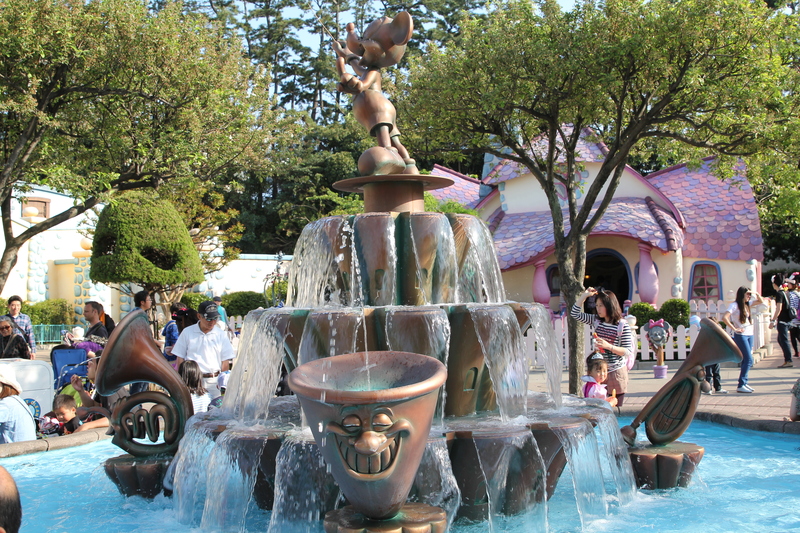 Tokyo was another story – the wait times were already at 120+ minutes and once we had done a fast pass for Thunder Mountain we were then told that we could not apply for another fast pass until 1.30pm. 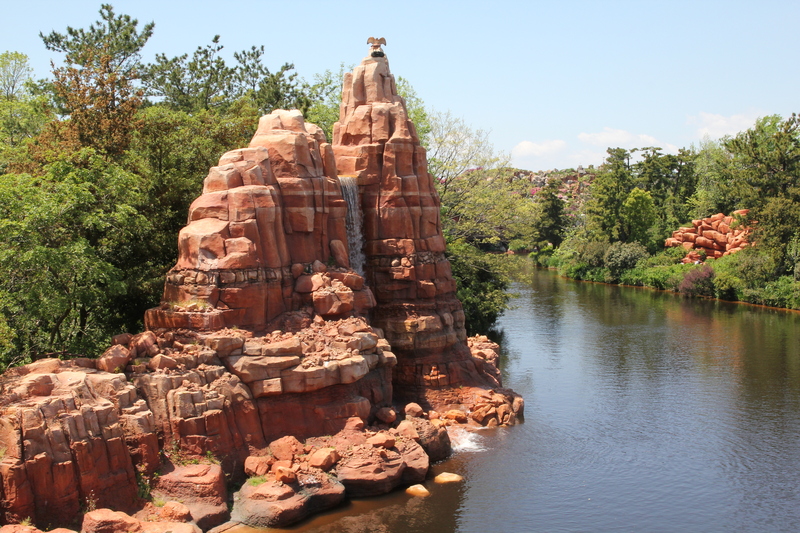 Both kids wanted to go on Splash Mountain, so we headed over there to find that the wait time was 140 minutes – cue Mummy as Fast Pass! 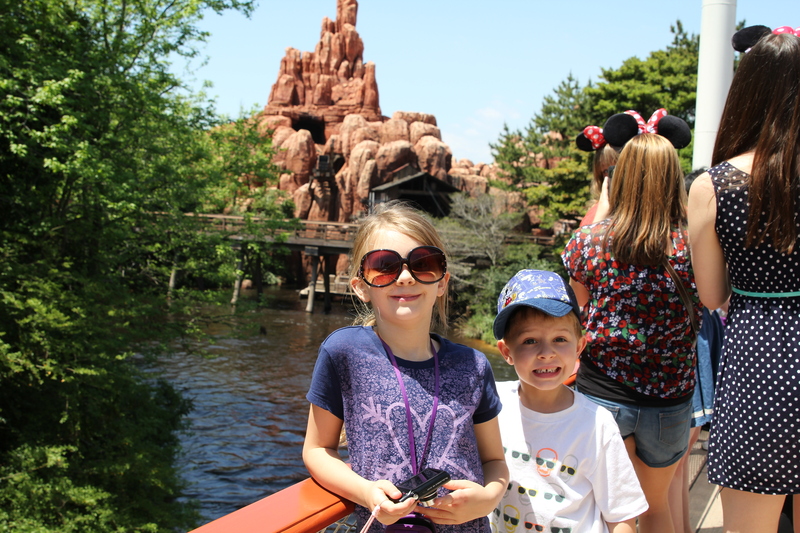 Earoel and Graham were happy to take the kids on some other rides while I waited in line at Splash Mountain. This was an incredibly boring 90 minutes for me!!! However, knowing that they kids got to go on the Cars ride and the Carousel so it kept them happy, made me happy. Splash Mountain did not disappoint and we all got wet! After this it was time for lunch. Kids had picked a burger place in Toon Town and so we walked over to that area of the park only to be told that it was shut! So, back to Tomorrowland for Burgers there! While we were eating, we noticed that the queue time for the Rocket Ship ride was only 25 minutes, so we jumped in line for that. 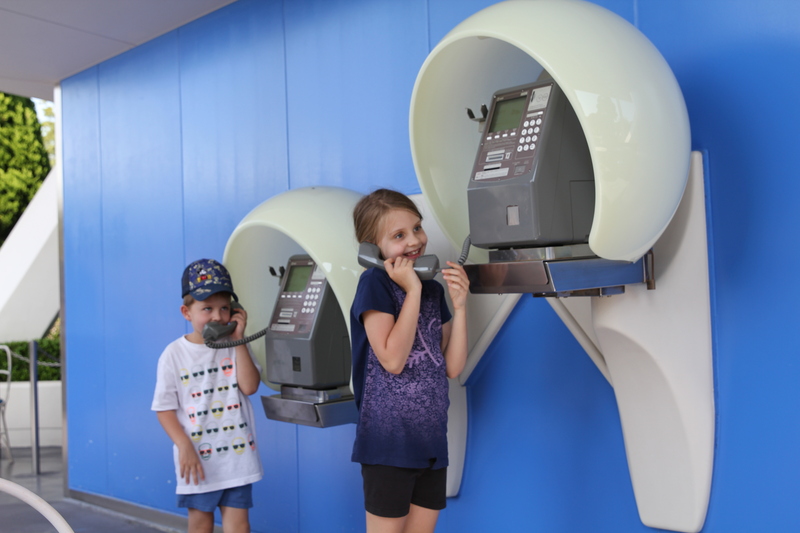 Kids trying “old fashioned” telephones! Jumping in for a ride! 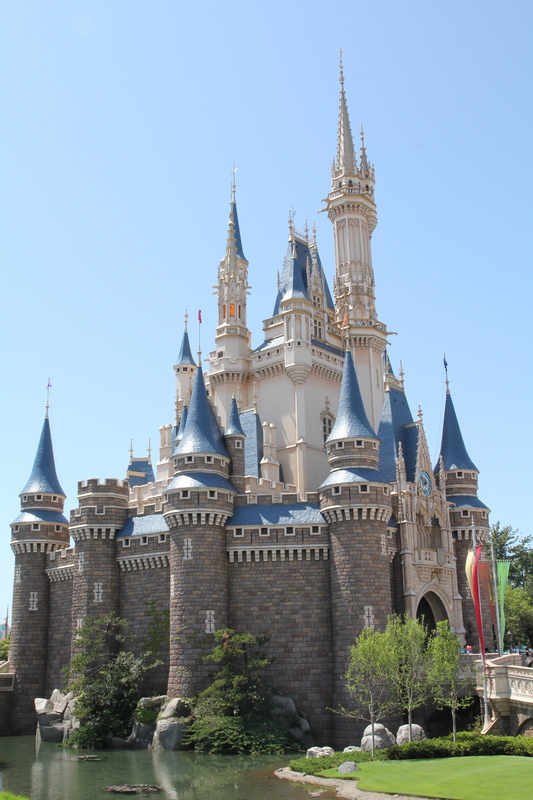 I was a little bit disappointed to see that all the Disney Princess characters were Westerners, but when I did a little research after, I learned that the Asian culture actually want to have photos taken with the Disney characters as they look in the movies and not the Asian version. We went back to Toontown for a couple more rides and then, as it was now getting later in the day, decided to head back to the hotel before dinner. It was a quick change time at the hotel before going to Andy’s Seafood restaurant for dinner. An old colleague from my days working in America is COO of the Japanese office and he had arranged this dinner at his favourite place in Tokyo. It did not disappoint! It was a large, lively table. We started the meal with crab and we were served the biggest legs and claws I had ever seen – yummy delicious. The ladies at the table were making local cocktails (???) with freshly squeezed grapefruit (aka – do it yourself at the table!). Isabelle had an alcohol free version and loved it. Oliver made fast friends with another colleague over his camera and was busy taking lots of photos of us all. 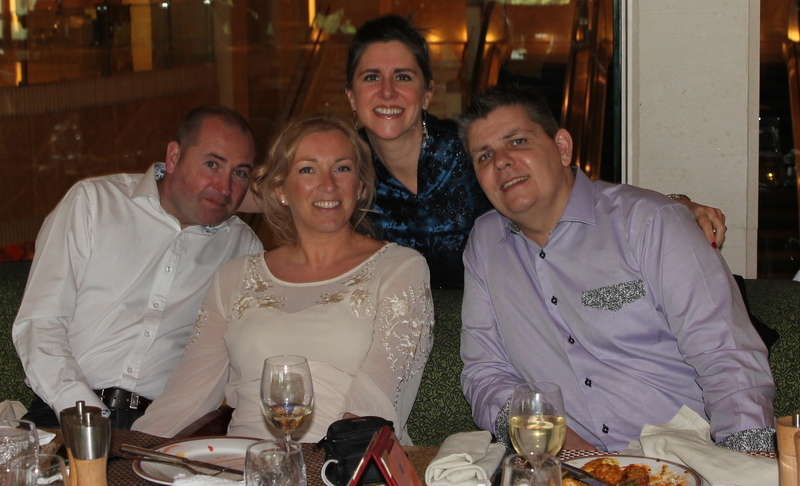 Andy’s was a fabulous meal – great company, great food and great drinks. It was lovely to catch up with Tim (from my Atlanta days). Wish I had more time to discover Japan through his eyes!! This was a late night for the kids as we didn’t leave the restaurant until 9.30 (tried to make myself feel better by telling myself that it was only 8.30pm Shanghai time!!) However, they had been so well behaved and so engaged that it did not seem to matter! We all crashed fairly quickly after getting back to the hotel room! 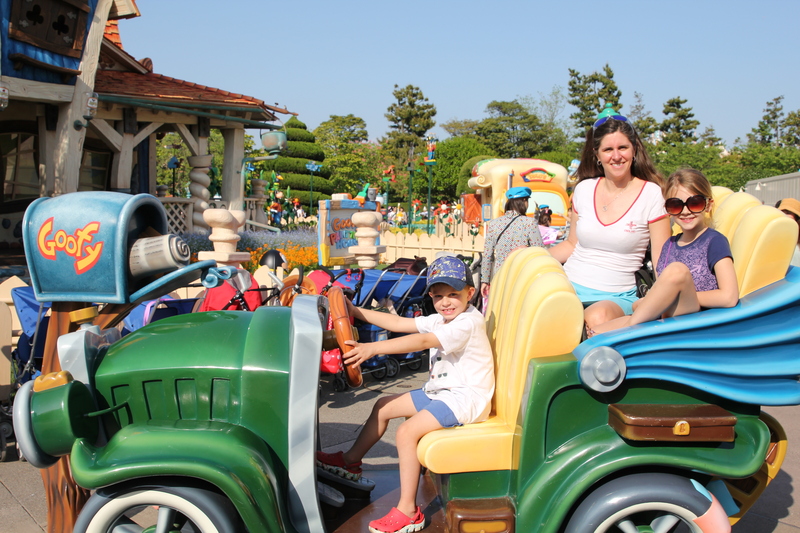 It is definitely a fact that a whole day at Disney followed by a dinner out is guaranteed for immediate sleep…..
We did not set the alarm for Saturday morning as we had a fluid agenda. Just as well, as no-one woke up until 9.00!! 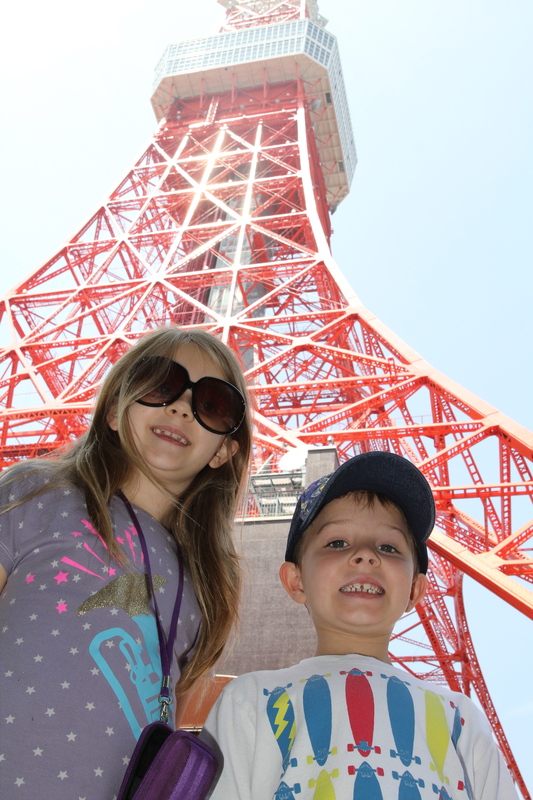 We headed down for breakfast and decided on our itinerary for the day – off to Tokyo Tower, followed by Hibiya Park. 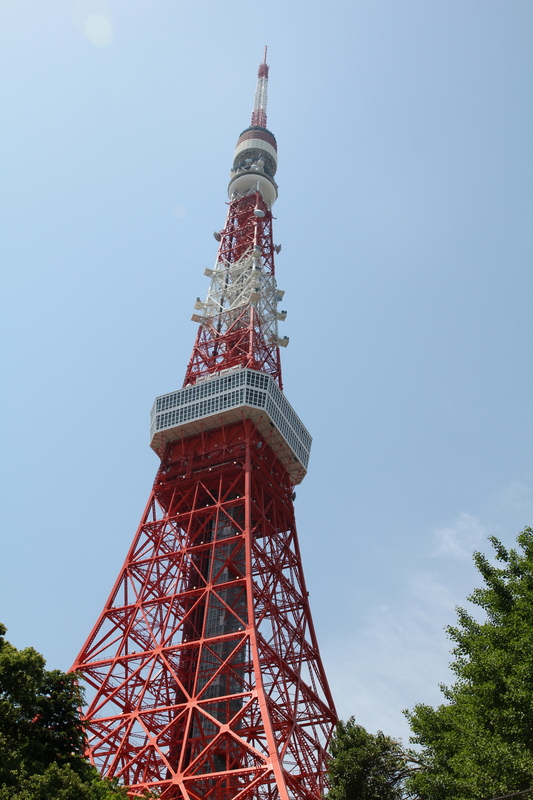 Tokyo Tower used to be the tallest tower in Tokyo (until the completion of the Skytower in 2013). 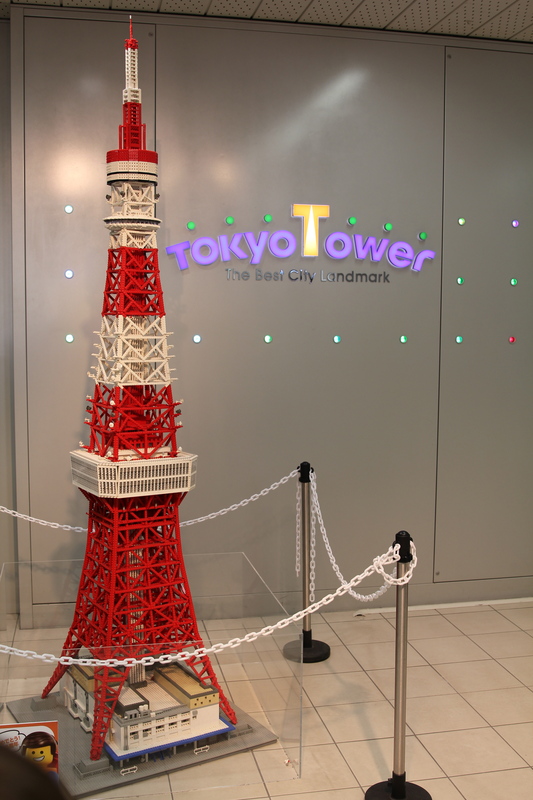 At the bottom of the Tokyo Tower. with some friends! Inside and waiting to ride up to the top! 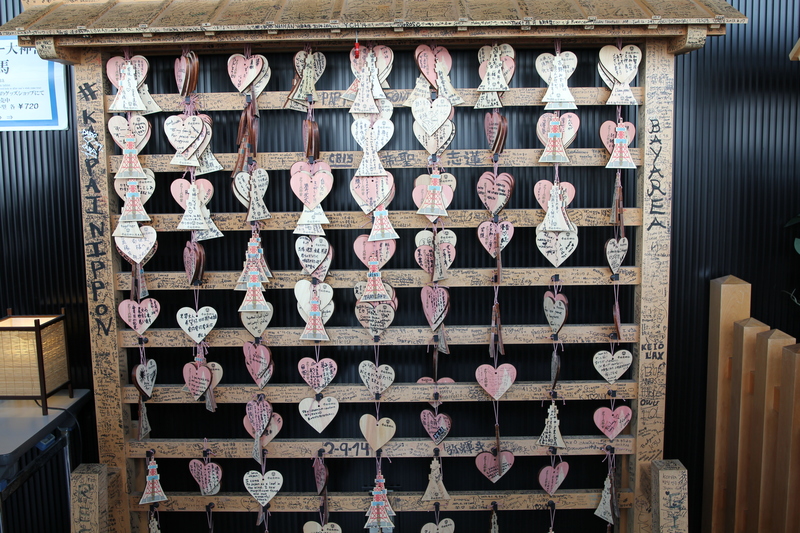 While we were waiting for the upper level elevators, we saw this board where people could post good luck messages. More views across the City. 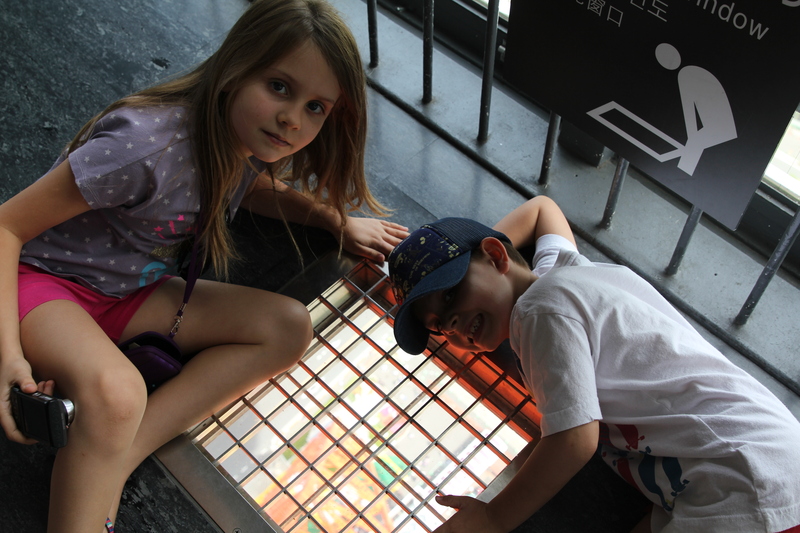 There were glass floors at certain areas. Bit scary to stand on and look down! A view through the glass to the ground! The afternoon was a lovely walk around Hibiya Park. 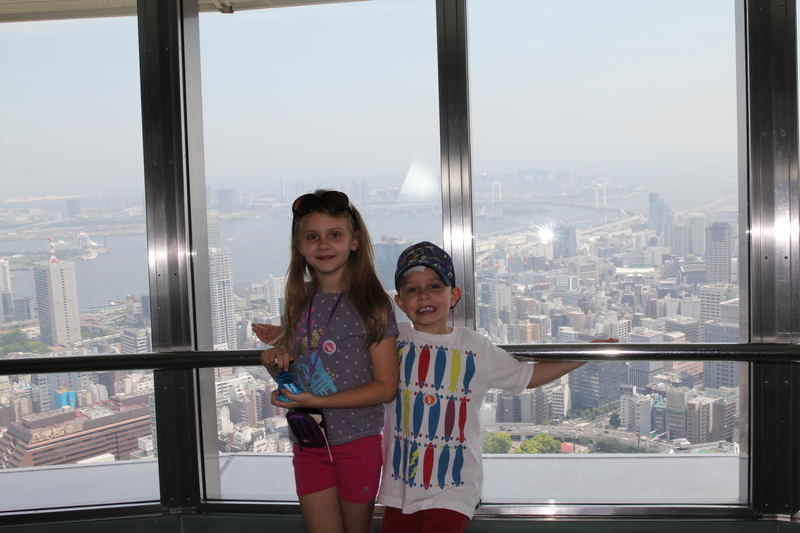 I was amazed that in a city of 34 million people, we bumped into the only people that I know in Tokyo – sometimes it is a small world!! 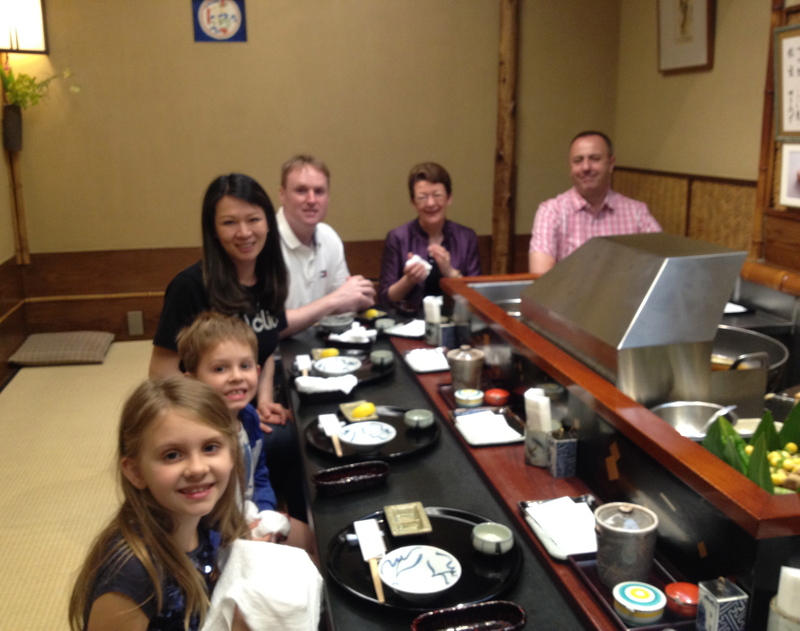 We went to a Tempura restaurant in the evening and had a fantastic meal. We had walked down the busy main street (equivalent to Times Square) and saw the bright lights that light up the City at night. 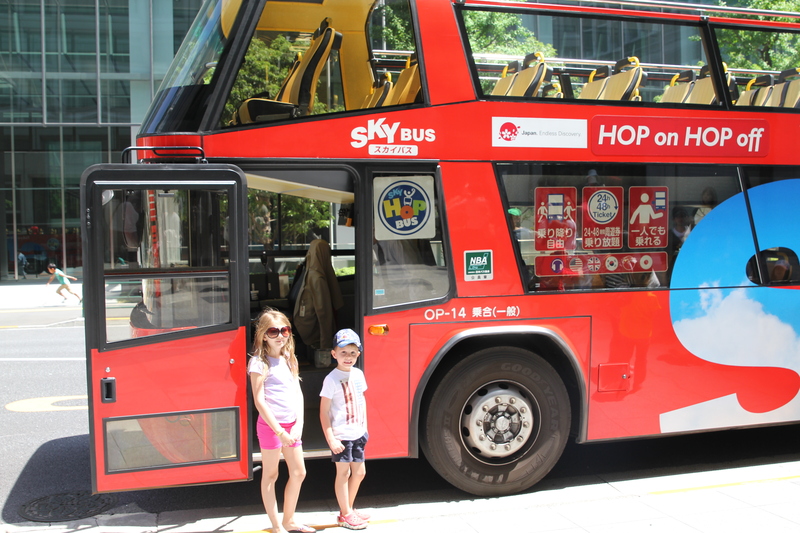 On Sunday we decided to do a Red Bus City Tour in the morning, prior to our trip back to the airport in the afternoon. The weather was clear blue skies and very sunny, but it was a bit breezy on the open top and we were all a little chilly when the bus picked up speed. 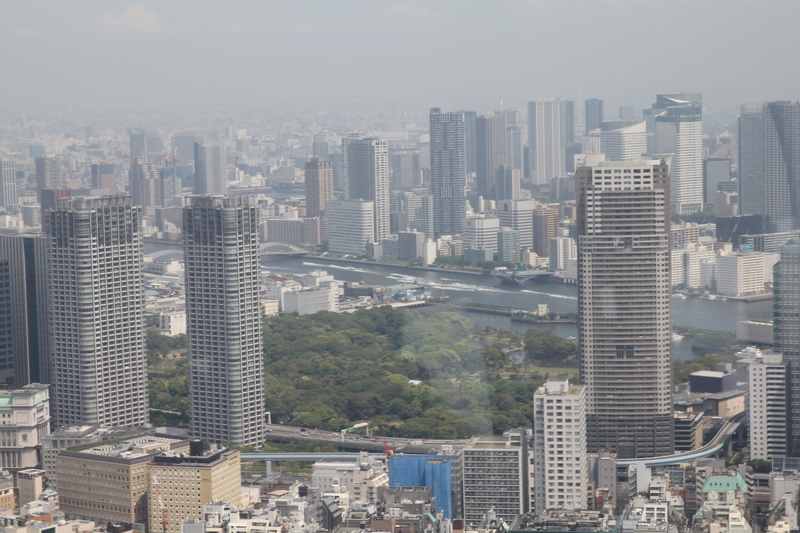 This was great way to see much of Tokyo and listen to the commentator tell us about the history, culture and interesting facts. On top of the bus. 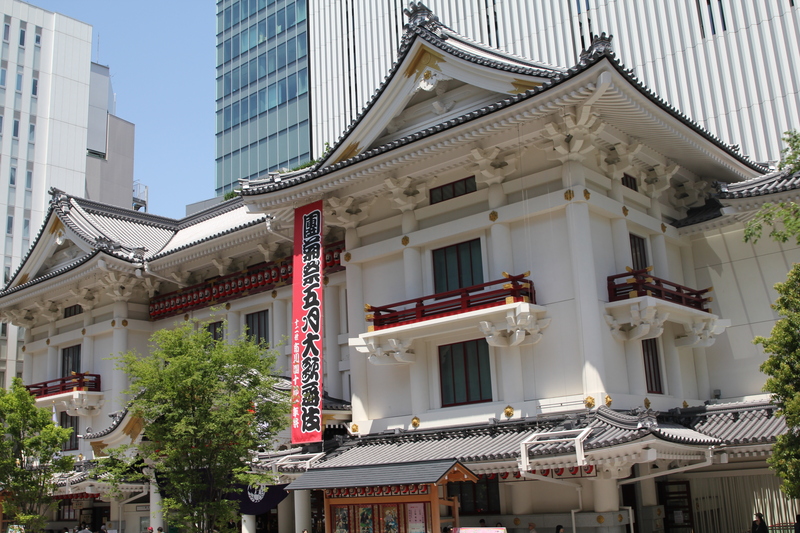 This was the original Japanese Opera Theatre. 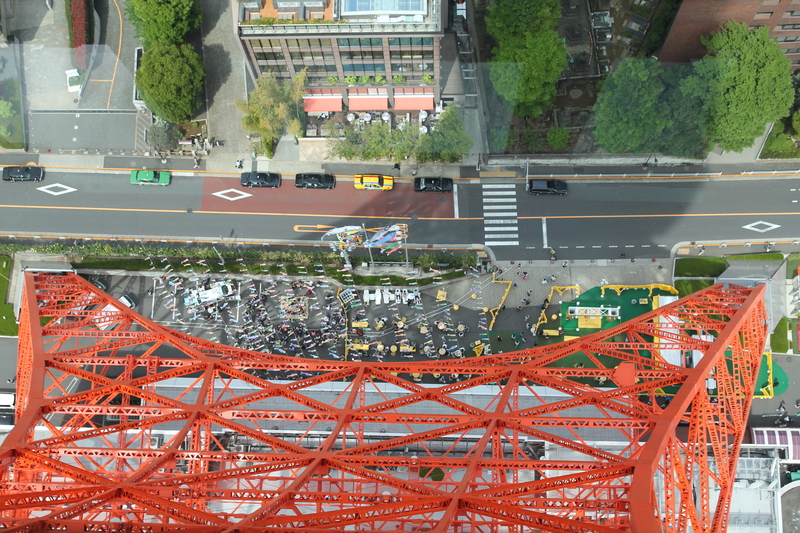 I also got a great view of the Tokyo Tower where we had been the day before! 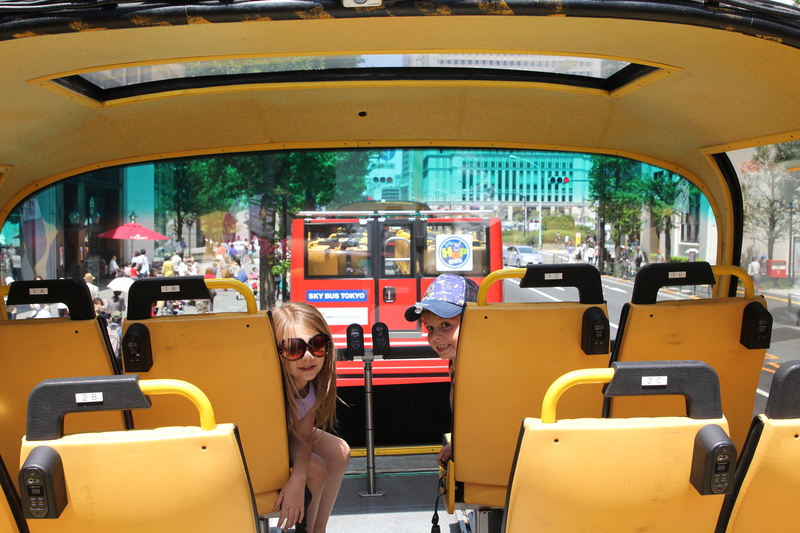 After the city tour, we enjoyed a lazy lunch and then headed back to the Metro to get the train back to the airport. Again, I must comment on the kindness of Japanese strangers. I was completely lost once we had our tickets (the Tokyo Station is HUGE! ), but not only did someone stop to see if we were ok, but they also walked us to our platform (which was out of their way as they were on their way out!!) No delays for the return journey. 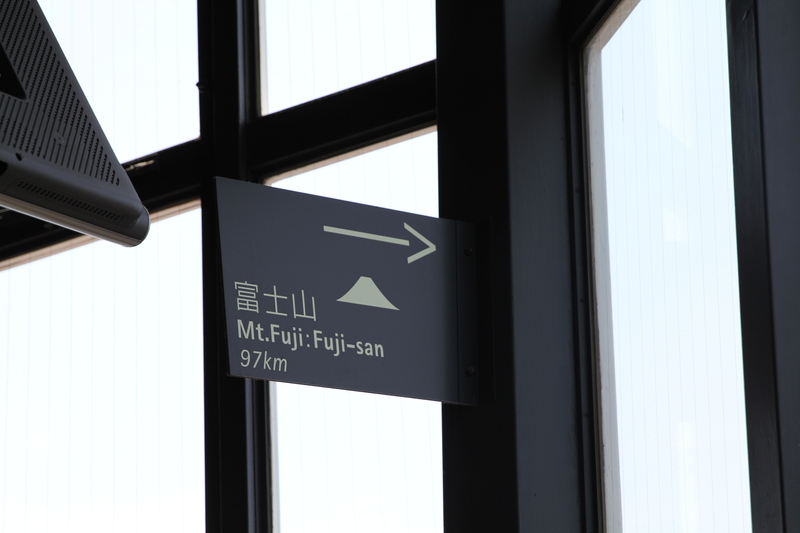 We flew Japan Airlines for the first time. 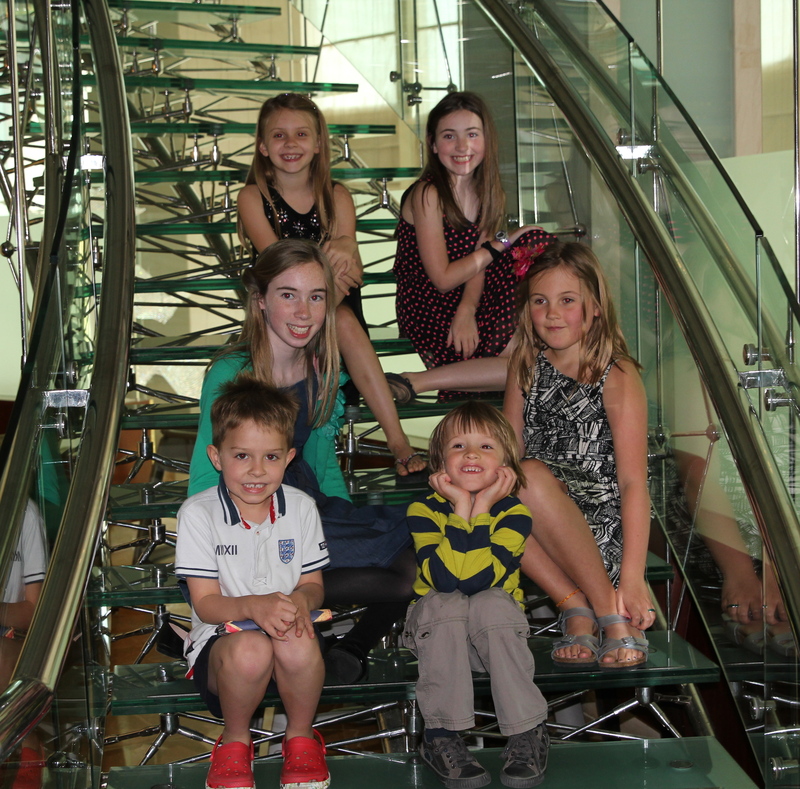 This was a good experience – excellent plane food and the kids got to watch the new Lego Movie! Visitors (at long last!!) 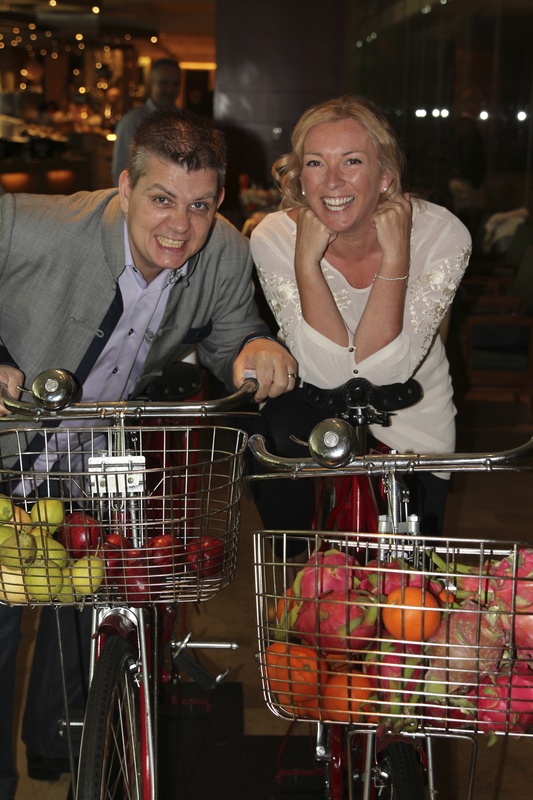 and a sad Farewell…. 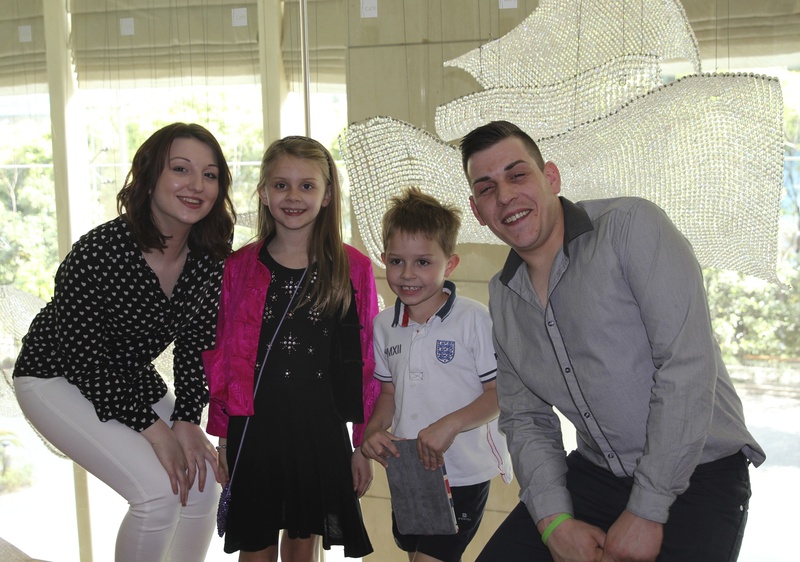 Our children were so excited about their Auntie Kim and cousins, Harley and Ashley, arriving for a visit with us in Shanghai. 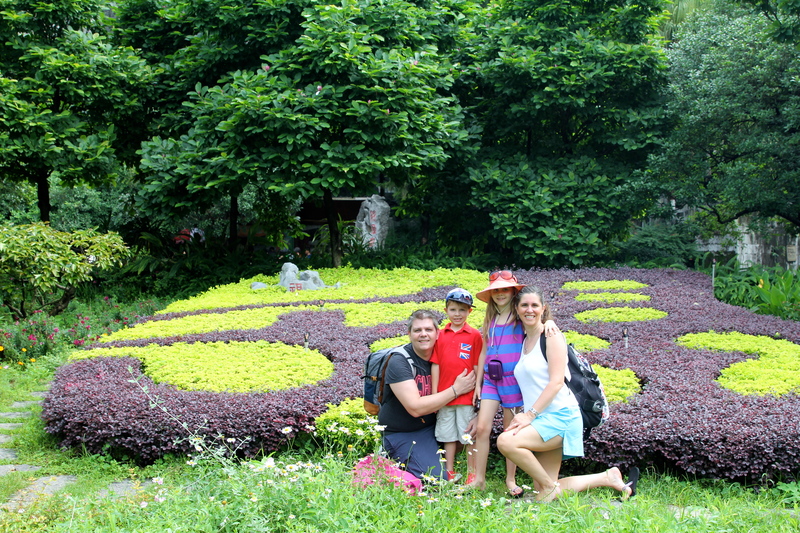 We had planned a whirlwind weekend site seeing in Beijing and Xi’an, plus lots of activities in Shanghai. Ashley and Harley were mostly interested in shopping at all the fake markets! 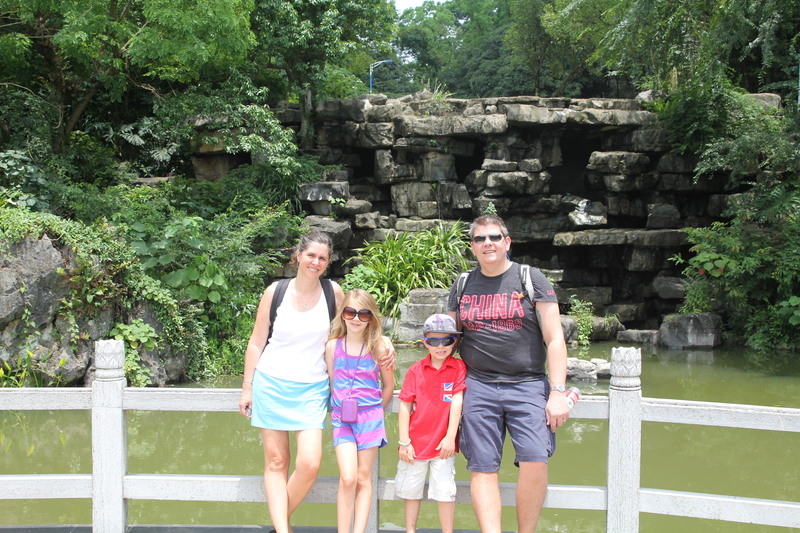 They arrived on Saturday April 5th and after a brief nap at home, we were straight into Shanghai life. Isabelle and Oliver were eager to play with Harley and Ashley! 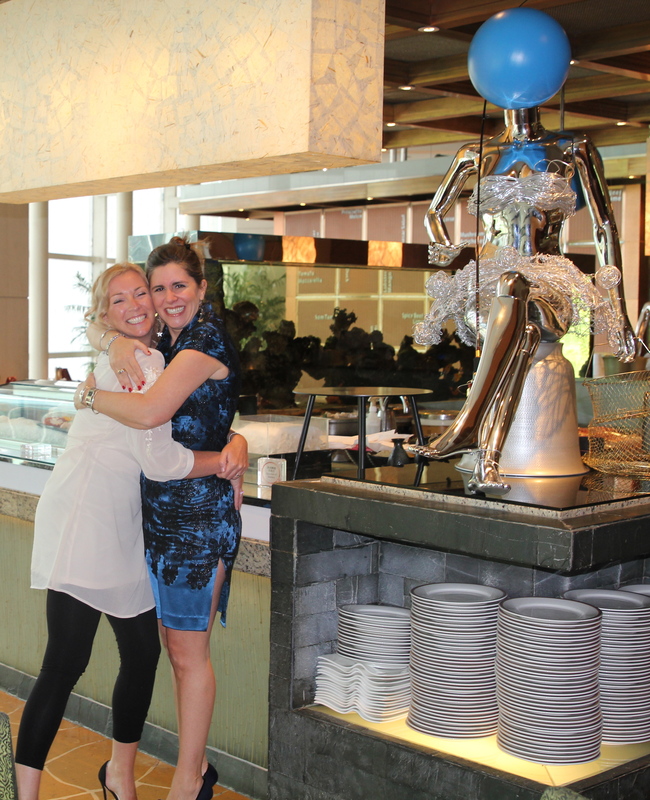 Sunday April 6th was Jo, Scott, Georgia and Saskia’s last day in Shanghai and we had booked brunch at the Shangri-La to say goodbye. 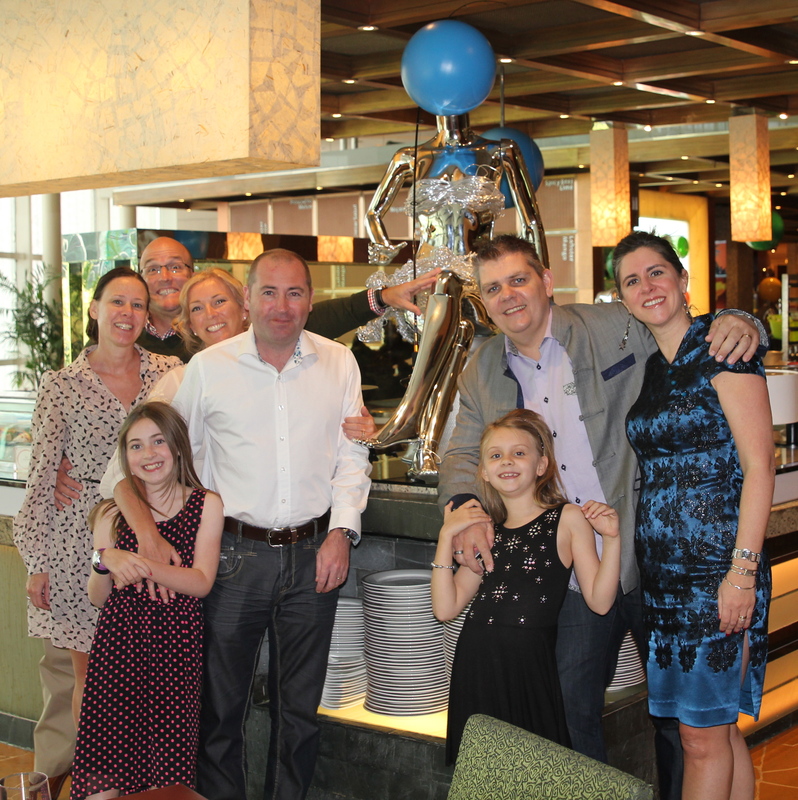 This was a great opportunity to introduce our family to the Ex-pat Sunday Brunch experience and the Shangri-La is a fantastic experience for this! 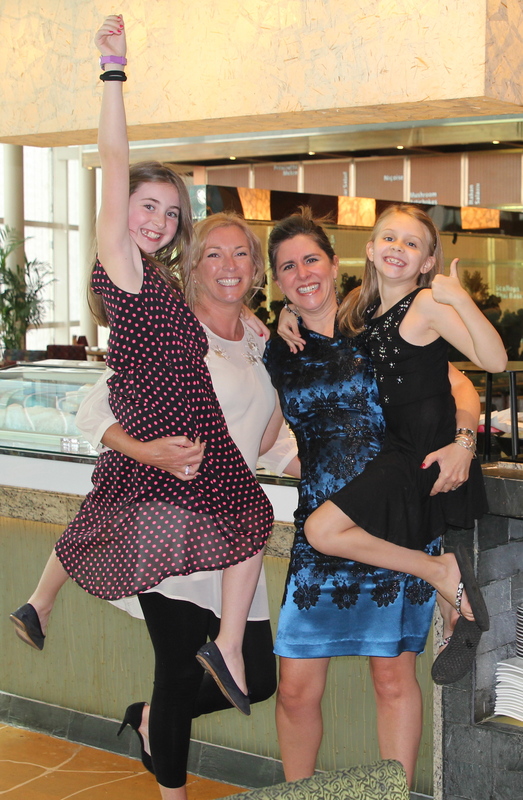 Kim, Ashley and Harley really enjoyed the lazy lunch, endless food and booze! 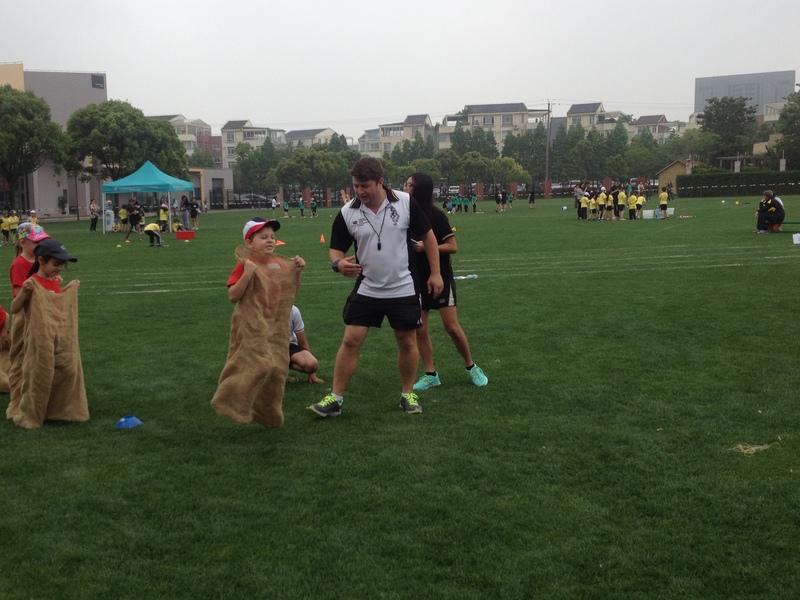 The kids had loads of fun playing with their fiends for the last time in Shanghai…. All of us by the Seafood station. Saskia with Mum and Isabelle with Mum. 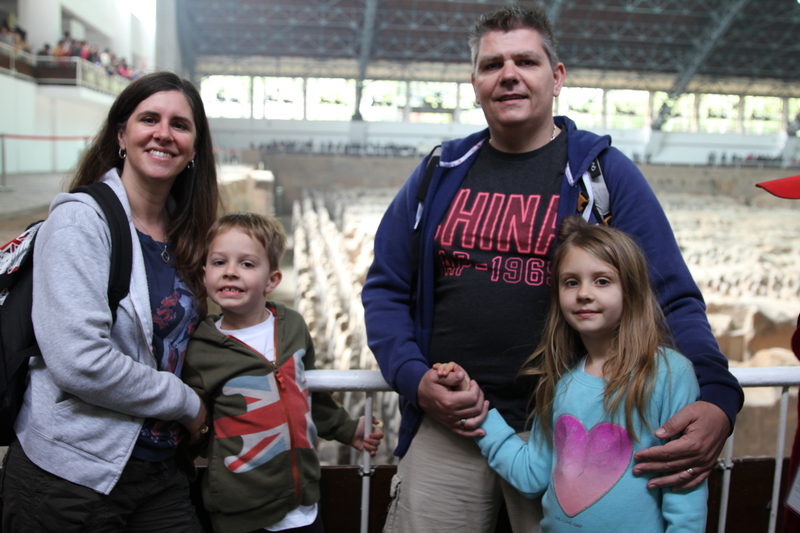 Scott, Jo, Sara & Owen – we had a lot of fun together in Shanghai. Cousins! Harley and Isabelle, Oliver and Ashley. After several hours of eating and socializing we decided to carry on the party at the Camel pub. This has been a regular Tuesday night venue as they have a Quiz Night there every week and we have often met up to test our general knowledge and have some fun during the week! The kids at the Camel pub – they all played pool here! 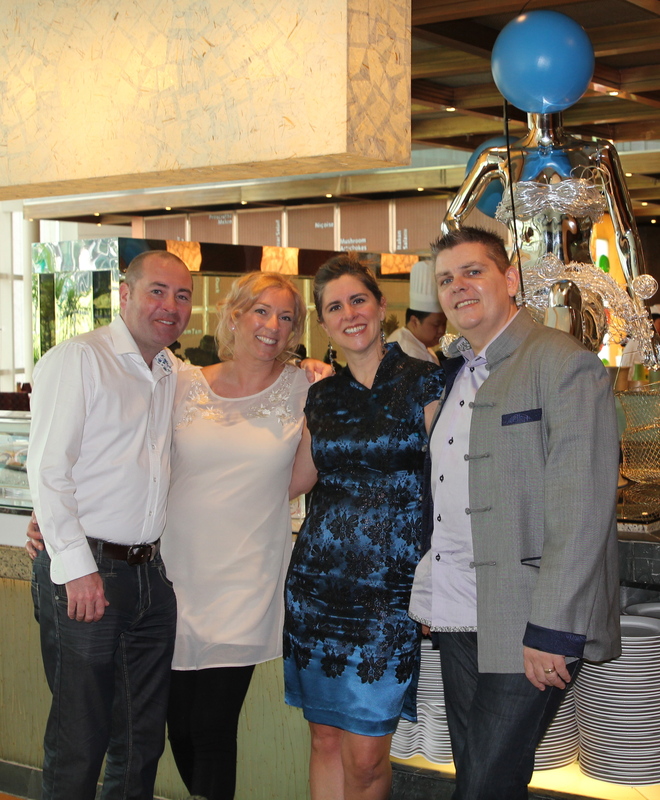 A final farewell – I expect there were some sore heads the next day!! 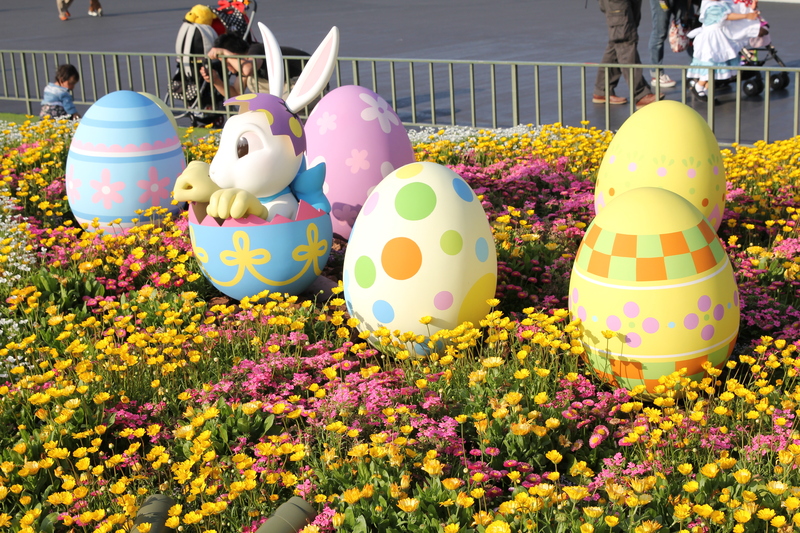 The next day, Monday, was a holiday for me (Tomb Sweeping Festival) even though the kids were back to school. So, after taking the kids to the bus in the morning, the rest of us set out to visit some Fake Markets and shop, shop, shop! 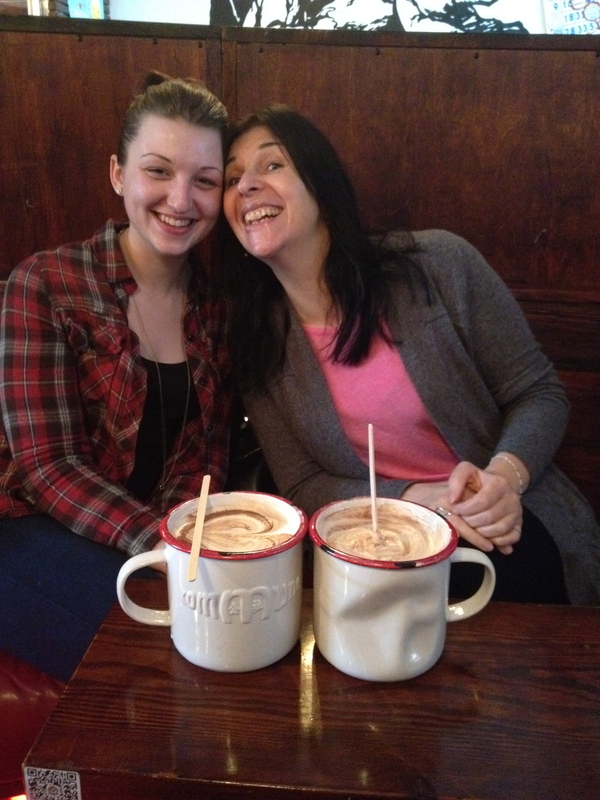 After coffee and shopping it was off to find Minging Mary’s. 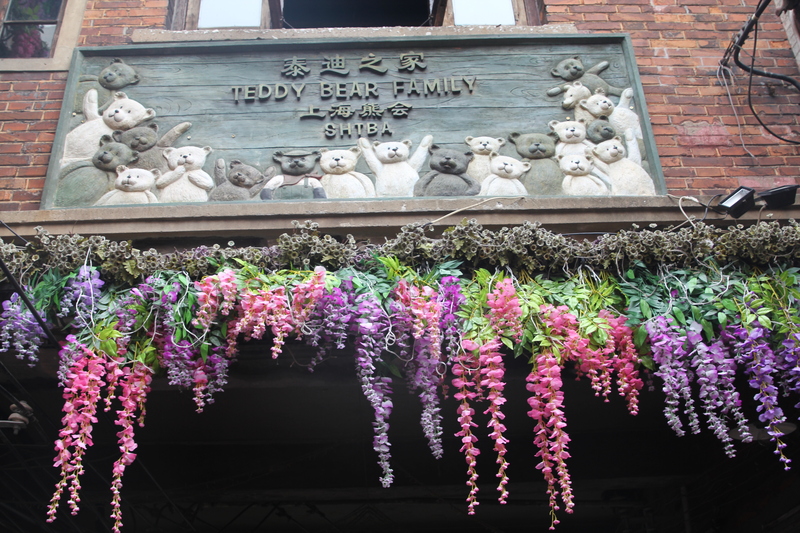 This place is a legend in Shanghai. It is a fake outlet in the basement of an apartment building. You have to know where it is and be taken by someone who is known (the first time). I had heard about this fantastic place (extremely high quality fake’s) but never visited before. Luckily for us, Owen had been before and knew where to take us! I did not know what to expect when we walked down some dingy stairs into a dark corridor in the basement. But, moments later, a man appeared and unlocked 2 doors into huge rooms of merchandise. Ashley and Harley thought they were in Heaven!! I must admit, I could not believe what I was seeing. After a little bit of bargaining, we left (full bags!) and went on the Fake Market at the Science and Tech Museum (the AP Plaza). Kim, Ashley and Harley decided to skip lunch so they could maximize shopping time! Good job we had eaten some snacks at Kommune to keep us going. Once at the Fake Market – Owen showed Ashley and Harley how the bargaining was done and worked hard to get some good deals for both of them. Ashley restocked his wardrobe in 1 day!! 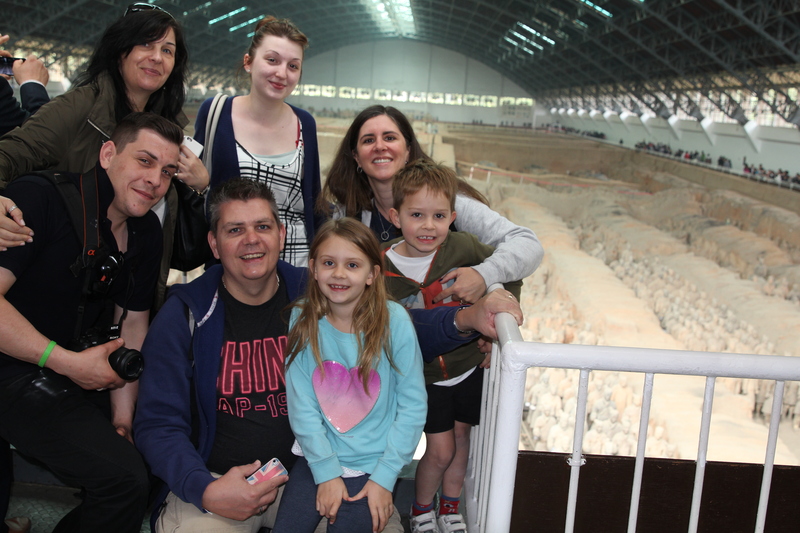 I had a few days of work to do before we were heading off to Beijing and Xi’an at the weekend (separate posts). But, on Thursday before our train, we went to Kerry Parkside for a few hours of pampering at Dragonfly. 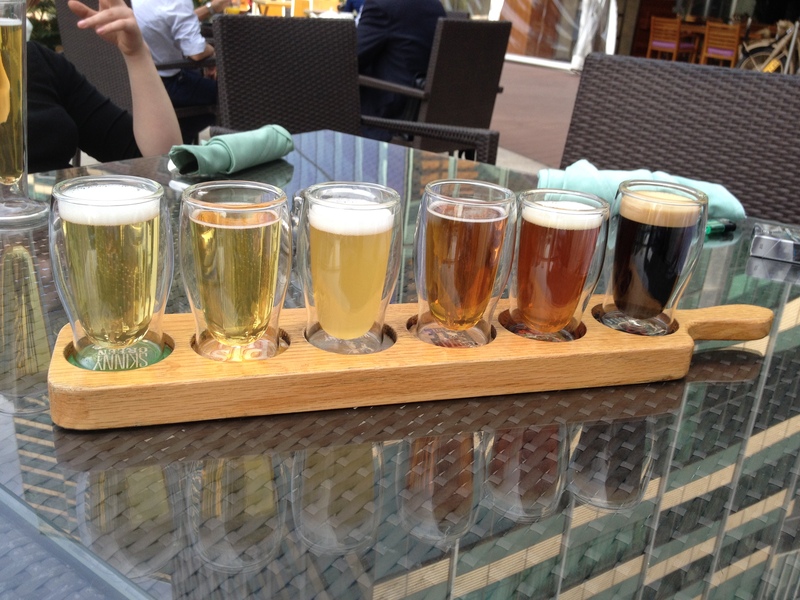 We had a leisurely adult lunch at The Brew and then all had massages, manicures and pedicures. Aaah – relaxation! 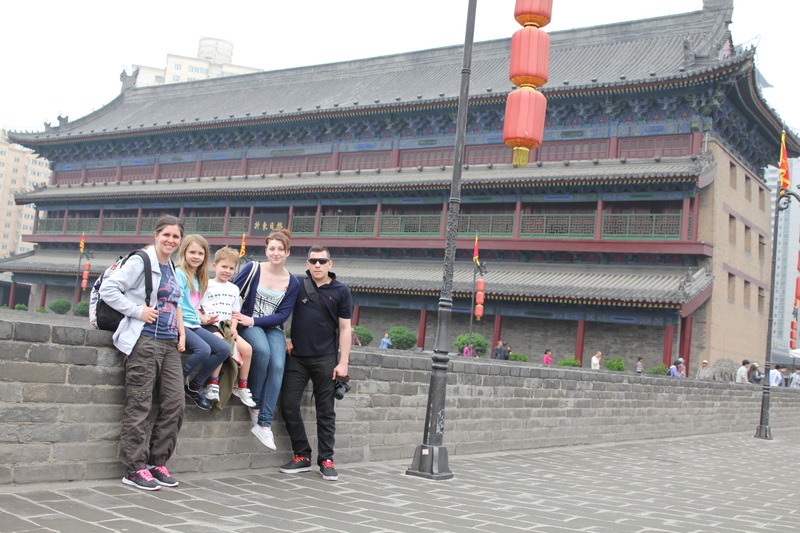 We got off the sleeper train from Beijing at 8:00am ready for another action packed day and were met by our guide, Lily. She immediately asked if we wanted to freshen up before starting our day, but we knew that it was going to be a packed agenda and wanted to get going. 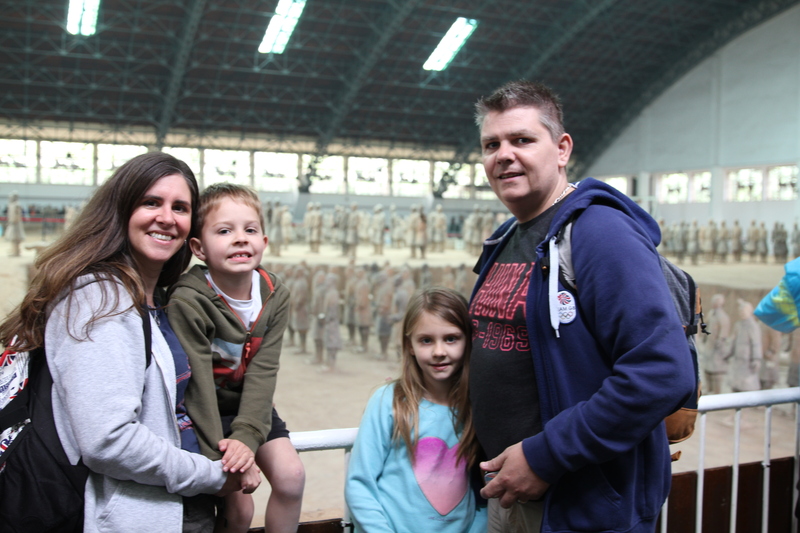 It was a 45 minute journey in a very comfortable vehicle to the Terracotta Army site and we were well stocked with plenty of water to keep us hydrated. 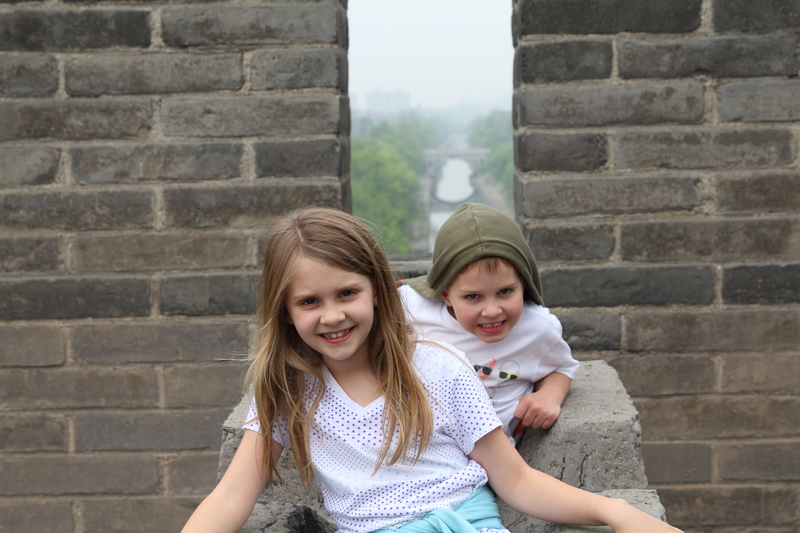 Lily was extremely knowledgeable about Xi’an, China history in general and especially about the Warriors. As we were pulling into the Museum, she was telling us the story about how they were discovered (by a farmer called Mr Yang in 1974) and said that he was often at the shop to meet people and answer questions and have photos taken. It was our lucky day as he was just walking into the shop at the same time as us so we all had our photo with him and he signed our book! 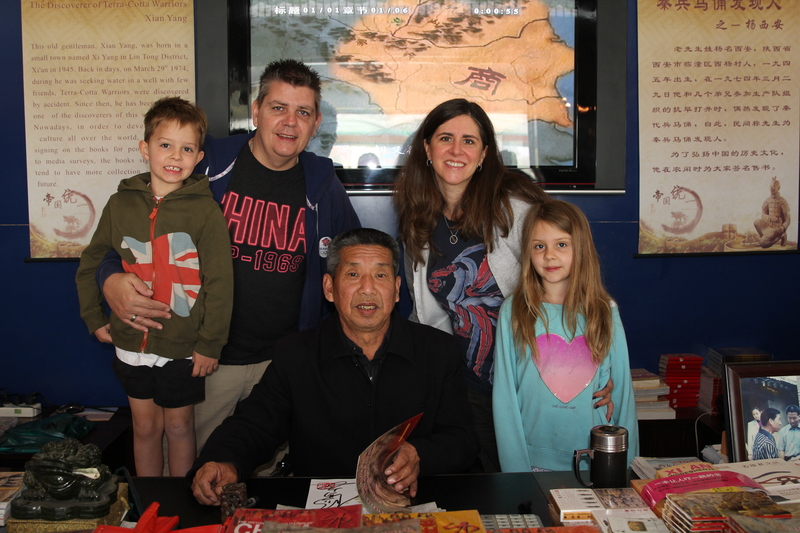 All of us meeting Mr Yang who discovered the Warriors. We got his autograph too! What an honour. Lily told us a funny story about Mr Yang meeting President Clinton. He was being taught some basic English to say and was told to say “how are you?”, with which Clinton would respond “fine, thank you, and you?” and then Mr Yang should say “me too”. However, when he met the President he actually said “who are you?” Clinton then said “I am the husband of Hilary Clinton” and Mr Yang responded “me too”. Definitely lost in translation!! 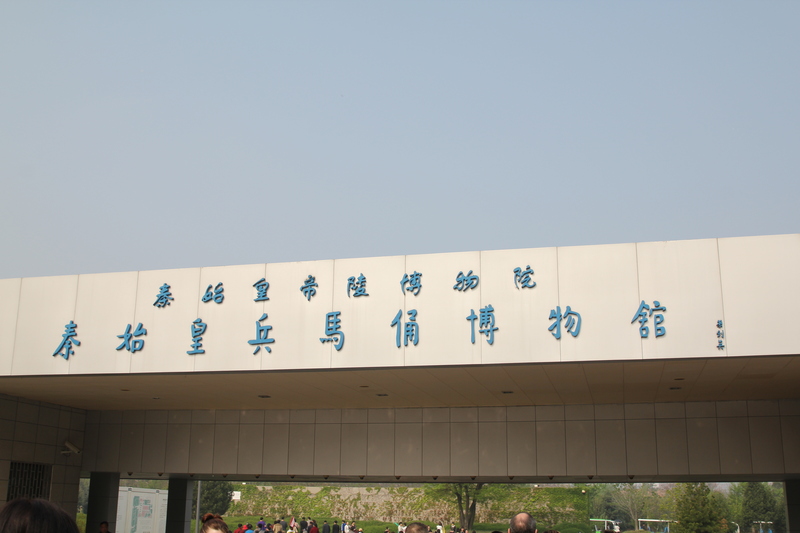 The entrance to the Terracotta Warrior Museum. There are beautiful gardens all round the pits. Experiencing the very moving Warriors was all the more special as Lily was telling us stories about each section and how they are working on uncovering more, the preservation techniques and the history associated with them. 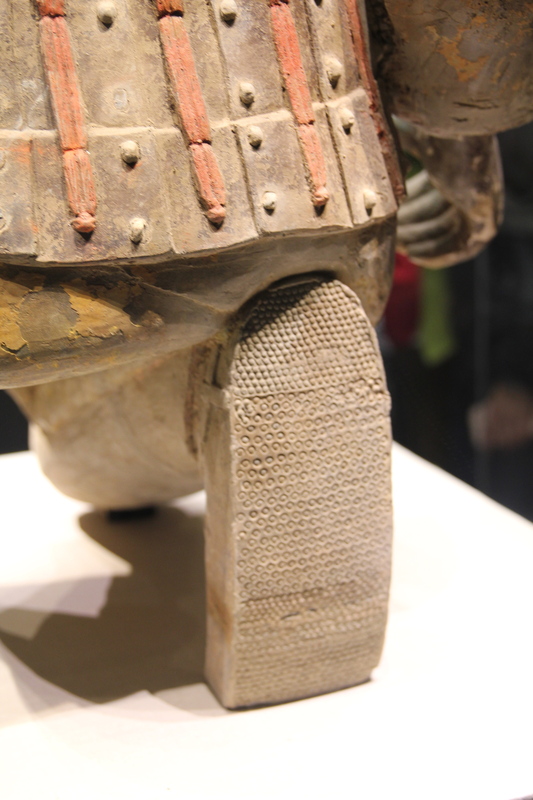 The detail on each Warrior is outstanding and hard to believe that they are over 2200 years old. 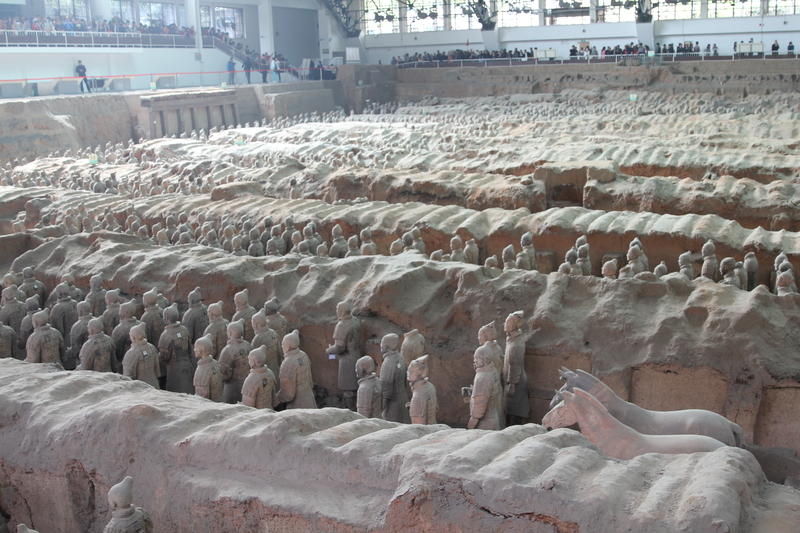 The first Emperor of China, Qin Shi Huang, wanted to be protected in his afterlife and therefore had his army recreated in Terracotta to be buried with him. 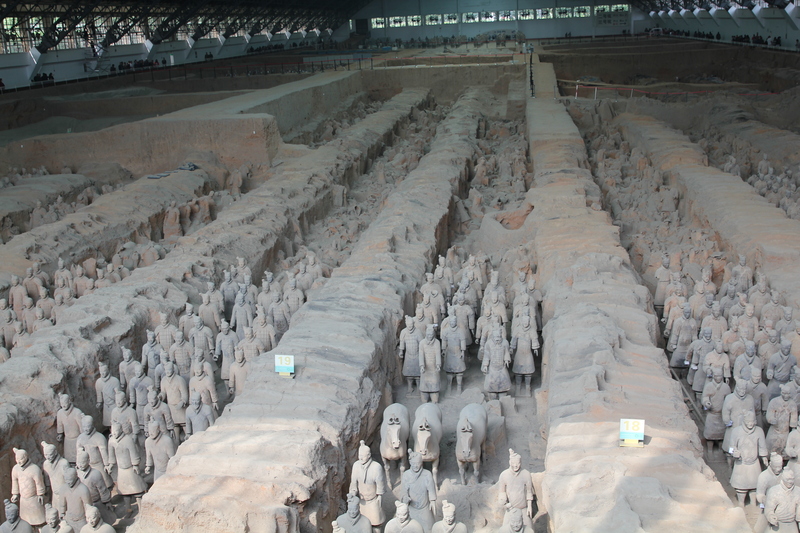 To date, over 8,000 soldiers, 130 chariots with 520 horses and 150 cavalry horses have been discovered in 3 main pits. The figures vary in height according to their roles and the tallest are the Generals. 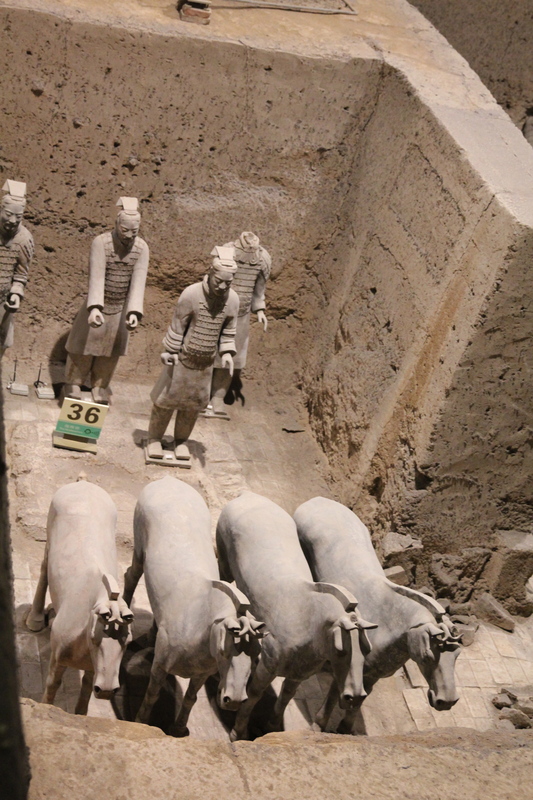 Other terracotta non-military figures were also found in other pits and they include officials, acrobats, strongmen, and musicians. In addition to the warriors, an entire necropolis built for the emperor also has been found surrounding the first emperor’s tomb mound which is located at the foot of Mount Li and built in a pyramid shape. It was designed to be a scaled down version of his imperial palace and includes offices, halls, stables and other buildings. This is all surrounded by rammed earth walls with different gateway entrances. 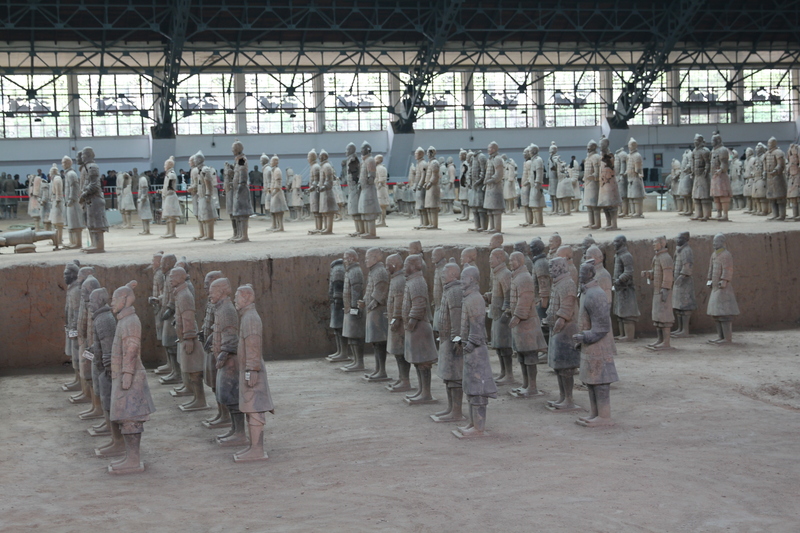 The terracotta army figures were manufactured in workshops by government laborers and local craftsmen using materials originated on Mount Li, and some historical documents estimate as many as 700,000 people working on these. Heads, arms, legs, and torsos were all created separately and then assembled – an early production assembly line! 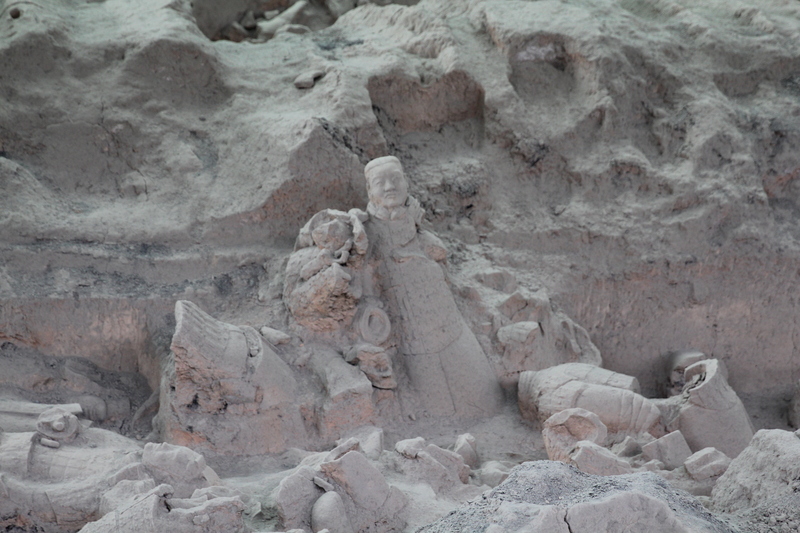 Historians believe that there were 8 basic face moulds which were then made unique with additions of clay and sculpting. Each worker signed the piece that they worked on. 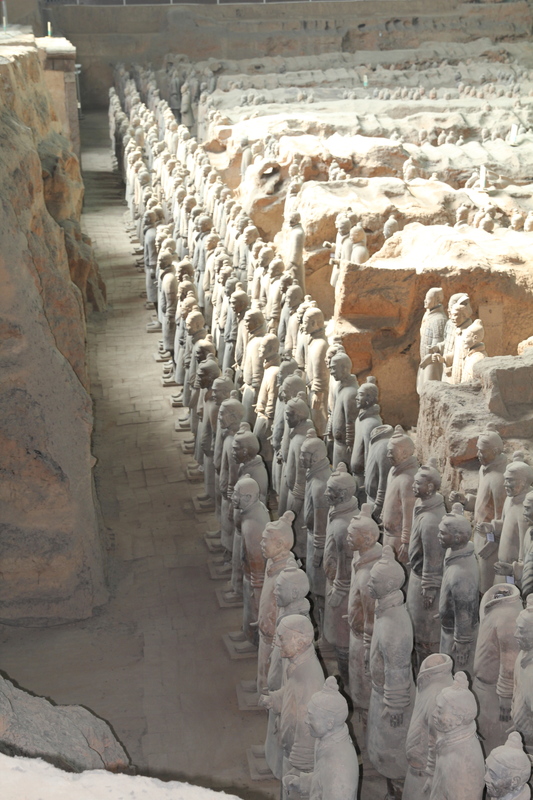 Once complete, they were placed in military formation around the tomb. They vary in height, uniform, and hairstyle in accordance with rank and most of them originally held real weapons such as spears, swords, or crossbows. 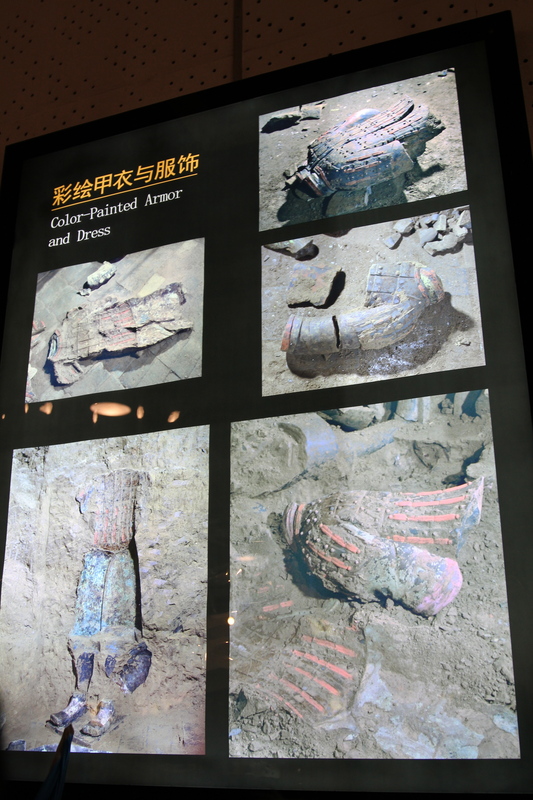 Evidence shows that they were also painted with bright paint – pink, red, blue, green, white, black and brown. 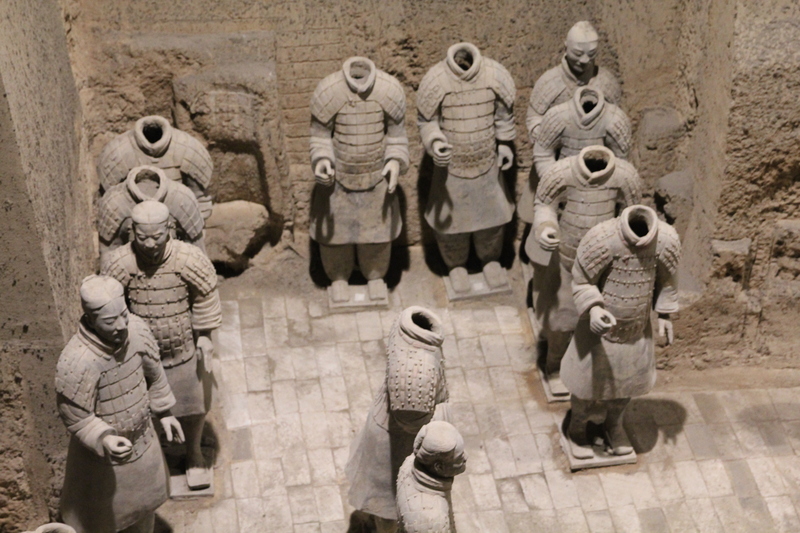 Unfortunately, once the terracotta warriors are uncovered the vivid paint curls and flakes off or fades rapidly – within 15 minutes of exposure. 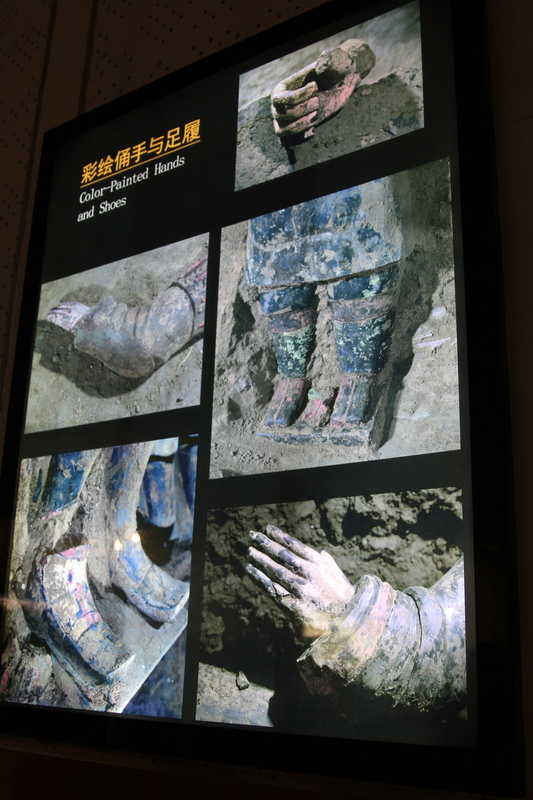 Lily told us that they know there are many more figures to excavate, but are waiting for the right technology to do that AND preserve the colour. And, they haven’t even started on the actual tomb of the Emperor yet! Pit 1 is HUGE. Approximately 6,000 Warriors in this building. Tight squeeze to get all of us plus some Warriors in 1 photo! Although I had seen pictures of the Warriors, it does not prepare you for the scale and magnitude. Broken Warriors waiting to be fixed. The slow and delicate process of excavation…. 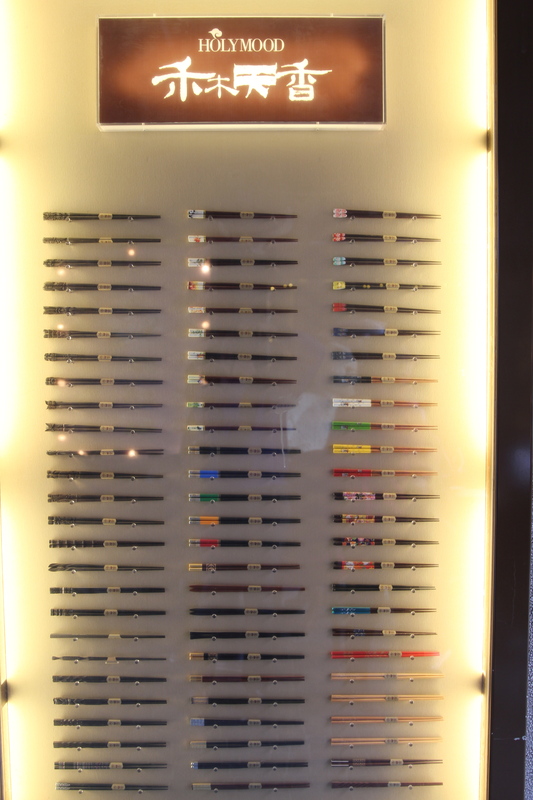 Some of the original vivid pigments and colours. We all got to pose with some very good replicas!! To keep Isabelle and Oliver occupied while us adults were in awe of what we were seeing, Lily kept them fed with Oreo Cookies and other treats! 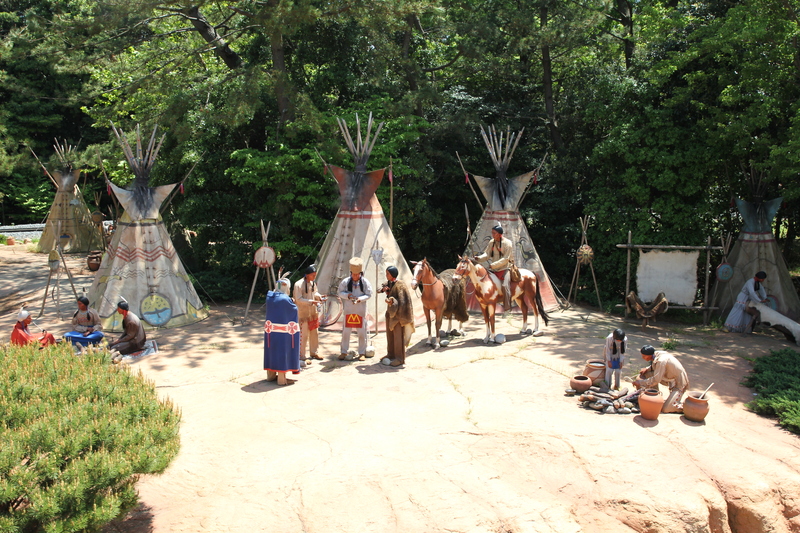 After seeing the pits, we moved into the museum area. 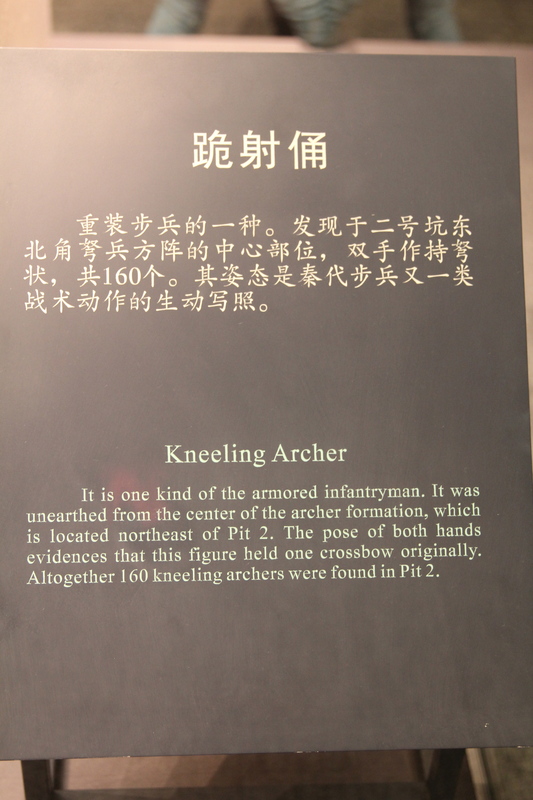 The kneeling archer. Even the soles of his shoes are incredibly detailed. 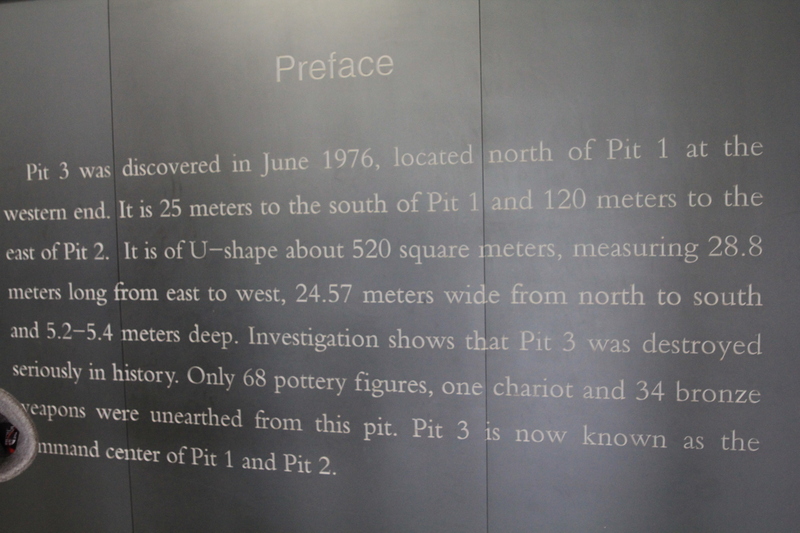 Each exhibit had information next to it. 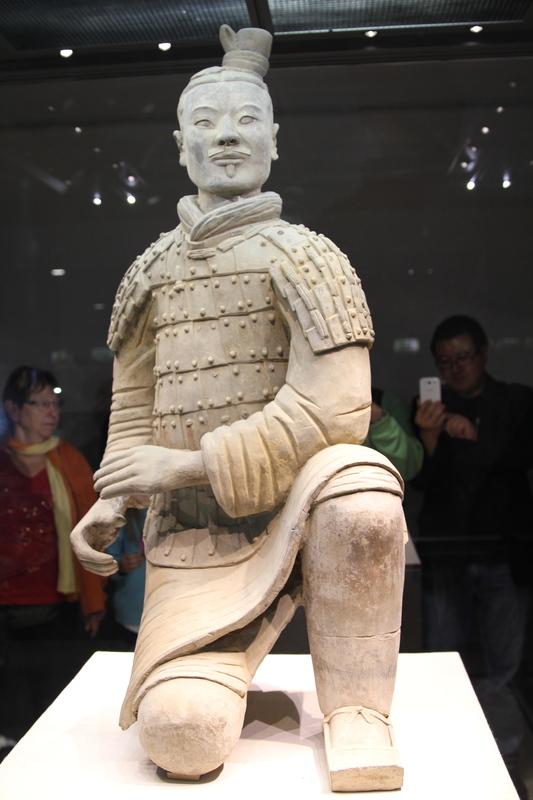 The back of the kneeling archer. Some of the colour has been preserved and you can also see the detail on the shoes. 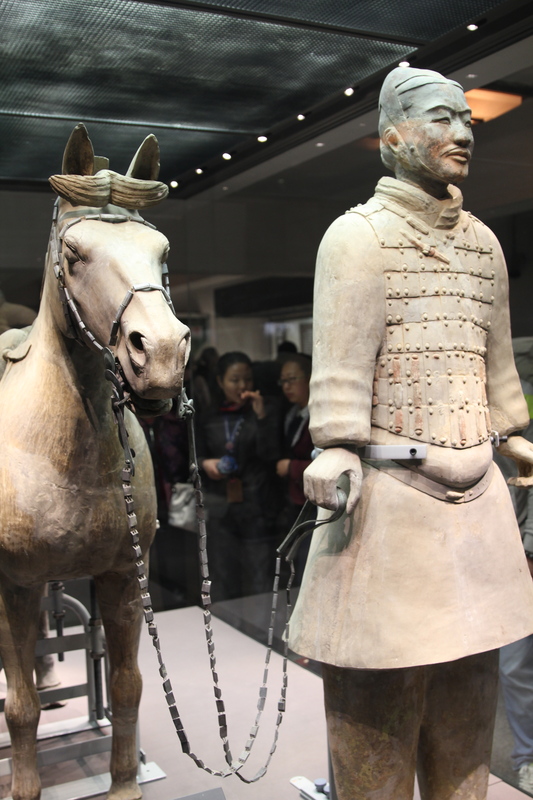 A Cavalryman with his horse. 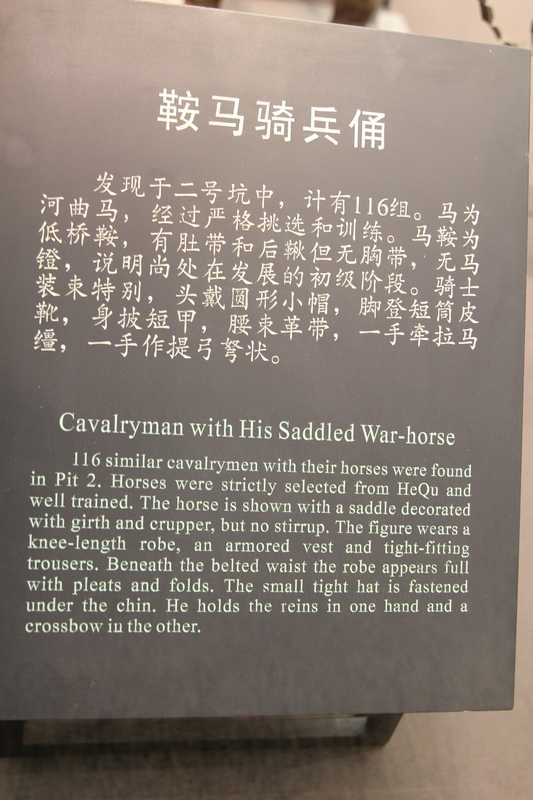 Information about the Cavalryman and Horse. 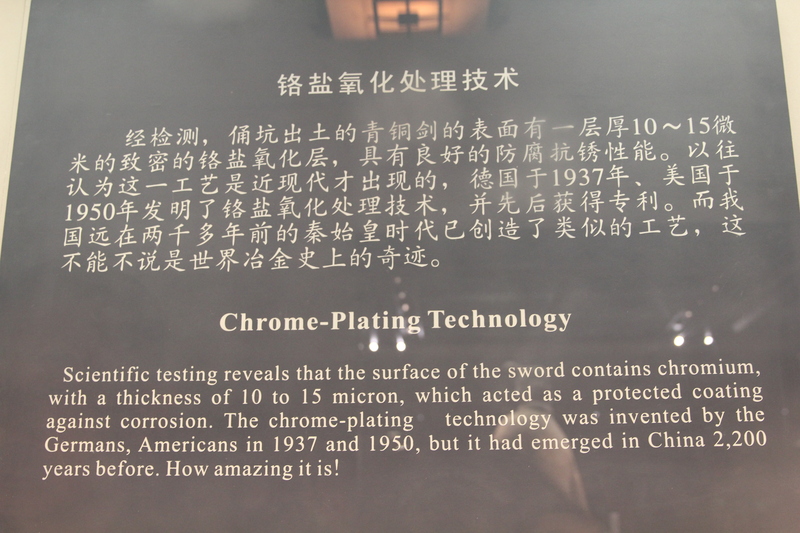 A Chrome plated weapon. 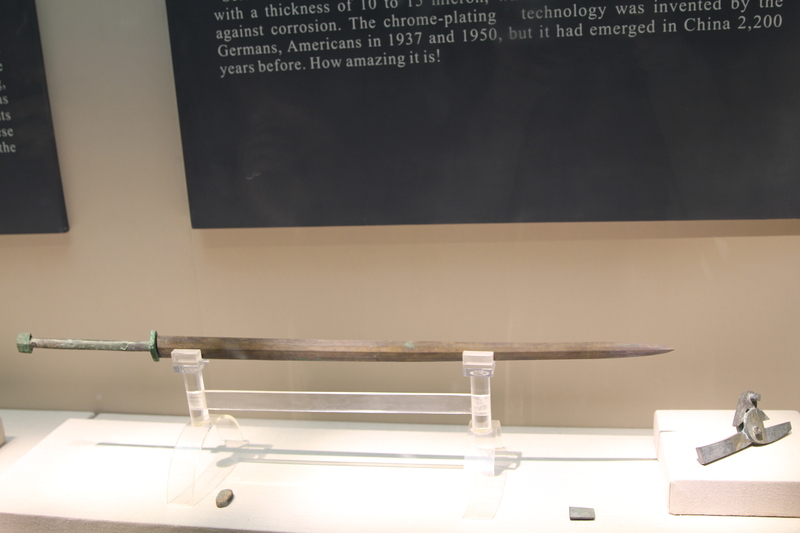 This technology was not “re-invented” until the 20th century!! Technology from 2200 years ago!! 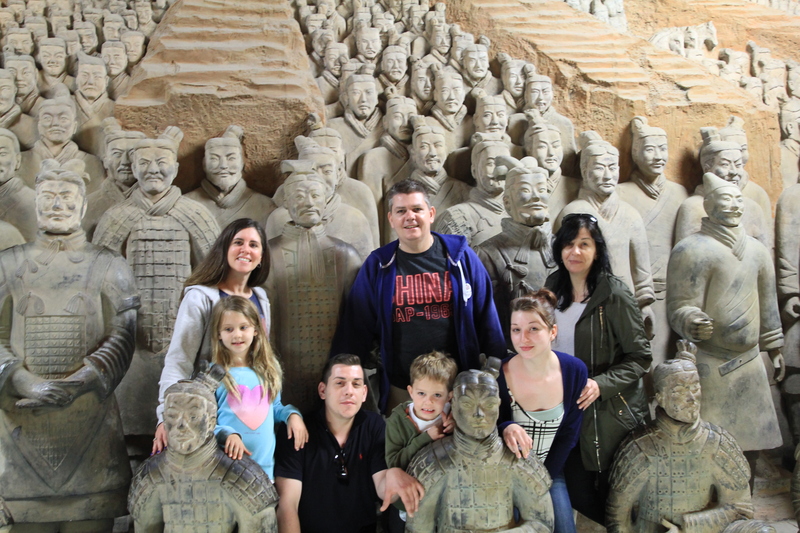 Leaving the Terracotta Warrior Museum and on to Xi’an. After spending several hours at the Museum, we left to have a delicious lunch at a local restaurant. Lily was very conscious of Oliver’s nut allergy when ordering all the dishes and was very insistent with the restaurant staff that everything should be nut free. The meal was fantastic (she had asked what food we preferred, but of course we all said local!!) More history and local knowledge was shared with us over this meal. After lunch we went to visit the City wall and the Muslim shopping area. 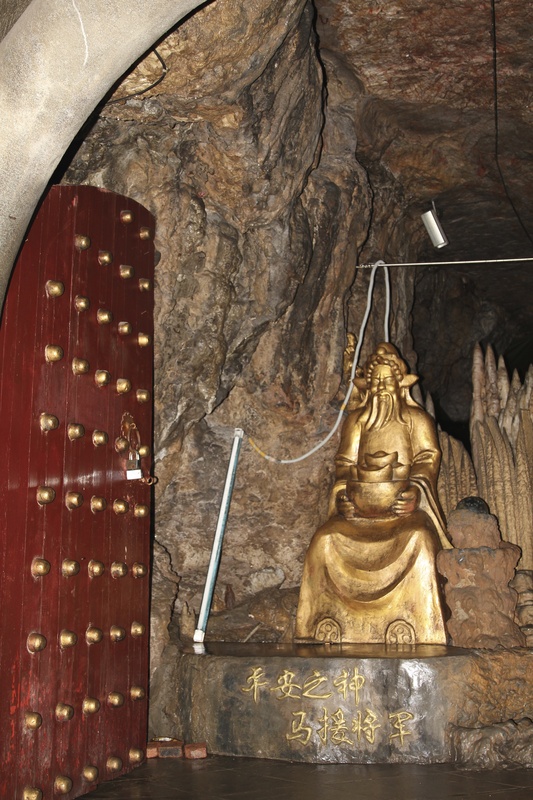 When Zhu Yuanzhang, the first Emperor of the Ming Dynasty (1368-1644), captured Huizhou, a hermit named Zhu Sheng admonished him that he should ‘built high walls, store abundant food supplies and take time to be an Emperor,’ so that he could fortify the city and unify the other states. 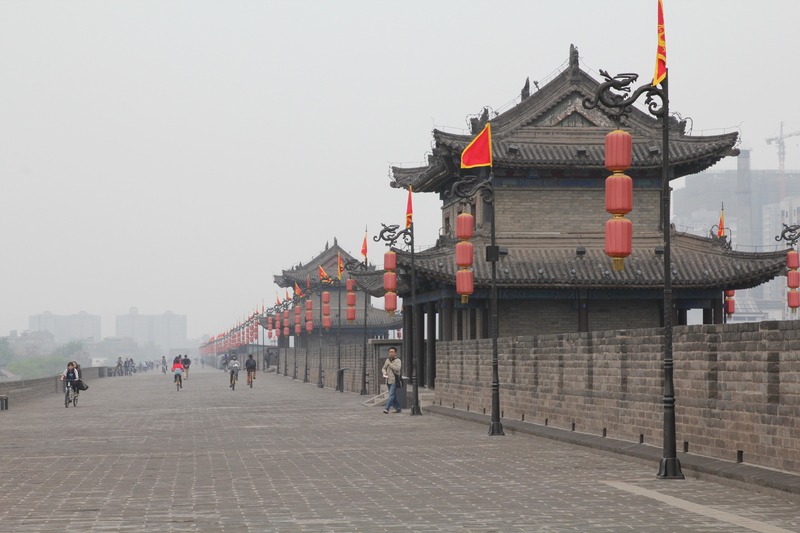 After the establishment of the Ming dynasty, Zhu Yuanzhang followed his advice and began to enlarge the wall built initially during the old Tang Dynasty (618 – 907), creating the modern Xian City Wall. It’s the most complete city wall that has survived in China, as well being one of the largest ancient military defensive systems in the world. Source: TravelChinaGuide. 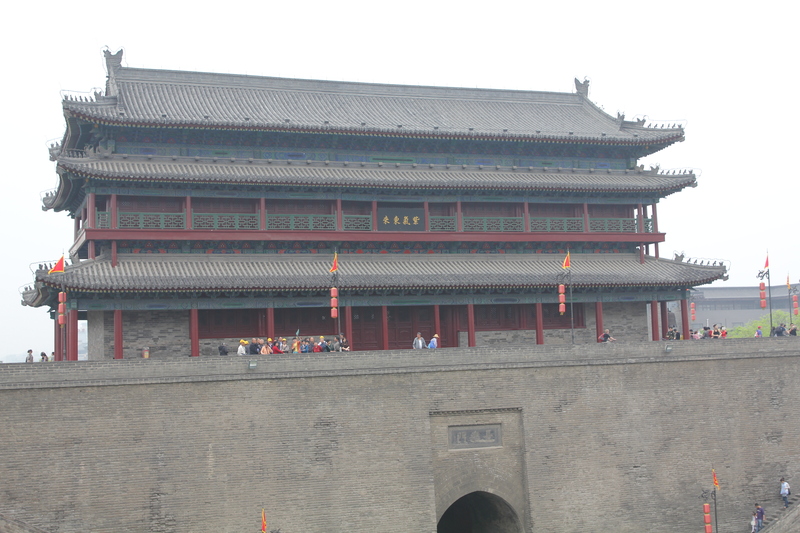 The wall is almost 14km long, with a deep moat surrounding it. Every 120 meters there is a rampant, 98 in total, that houses a sentry building. The only way for an enemy to enter the city was by attacking the gates in the wall, so the ancient Chinese built complex structures within the wall! 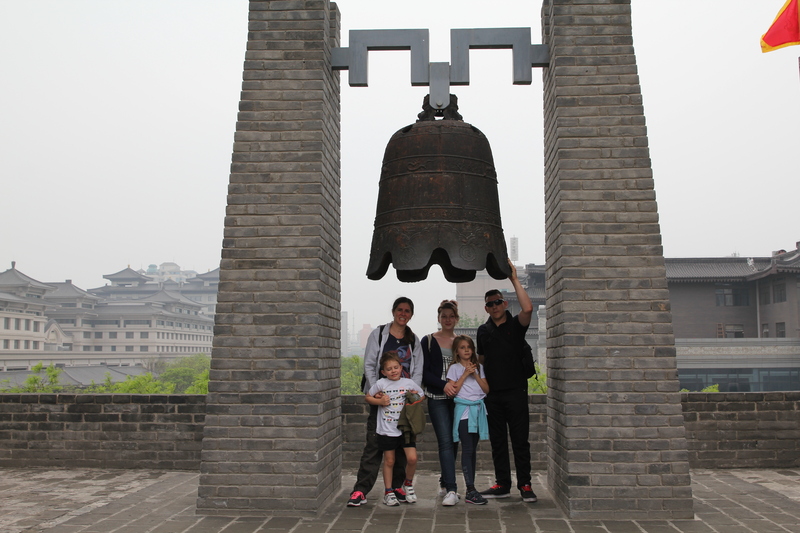 The City Wall in Xi’an includes four gates and they are; Changle (meaning eternal joy) in the east, Anding (harmony peace) in the west, Yongning (eternal peace) in the south and Anyuan (forever harmony) in the north. 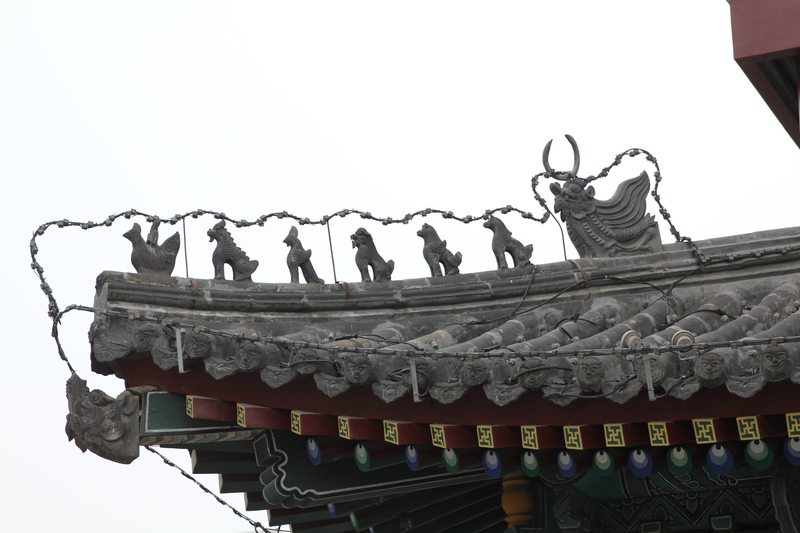 The south gate, Yongning, is the most beautifully decorated one. 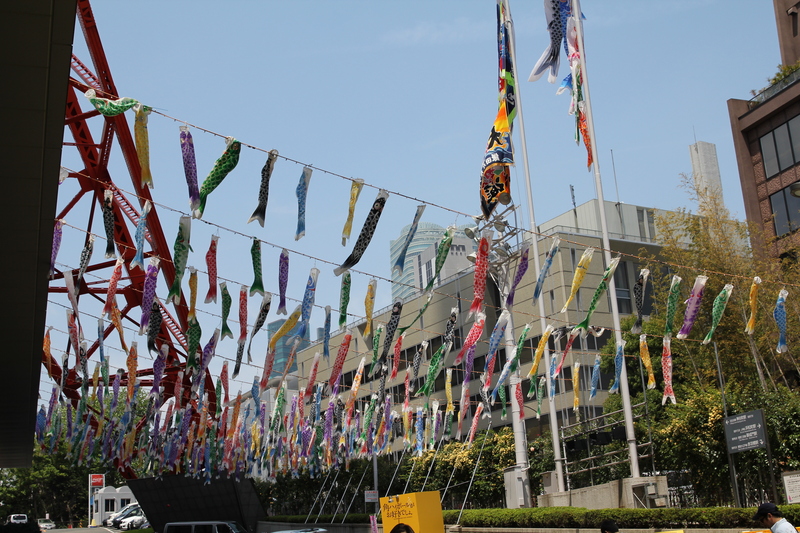 It is very near to the Bell Tower at the center of the city. Watch towers are located on each of the four corners of the wall. The one at the southwestern corner is round, but the other three are square-shaped. Isabelle & Oliver on the top of the City Wall, and looking through to the City. More intricate and fascinating architecture on a Watch Tower. This was an important building, and you can tell because of the animals on the roof edges. Hanging out over the City Gates. Looking across the gate to administrative buildings on the other side. The view across the City (and moat below) was very good. Wish it had been a clearer day!! 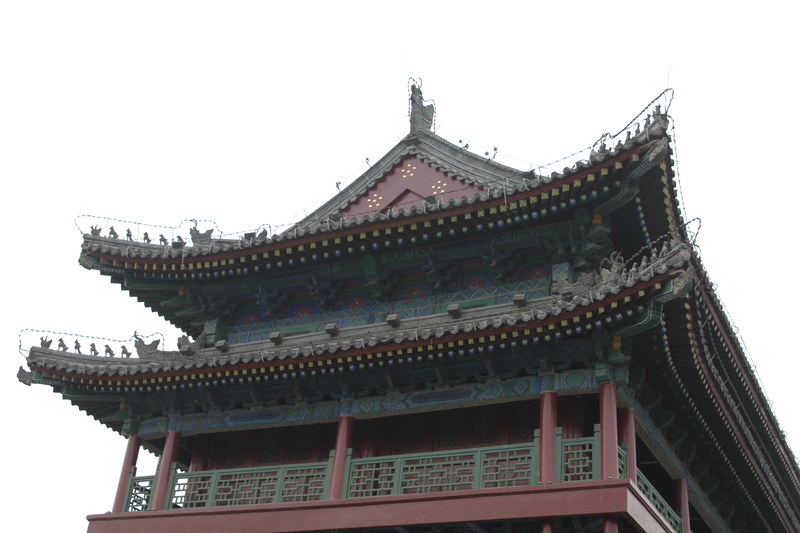 The Drum Tower got its name from the huge drum located within the building. 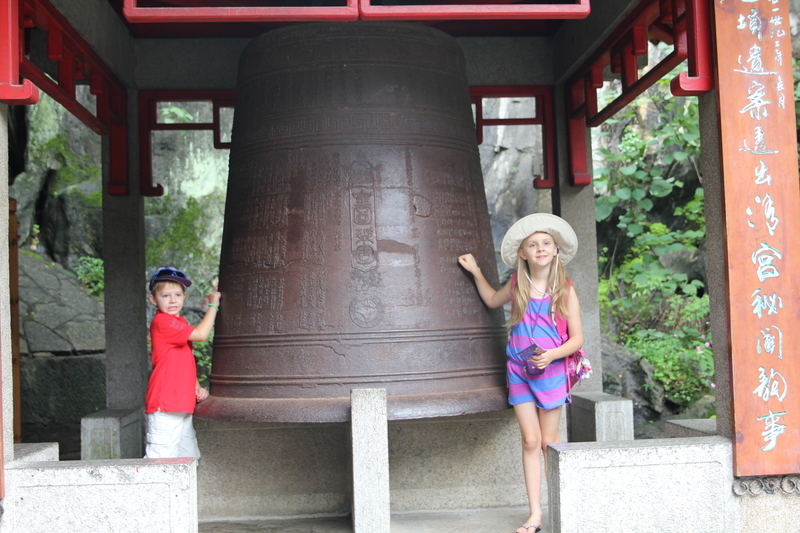 At the beginning of each day, at dawn, a bell was struck – in the Bell Tower. 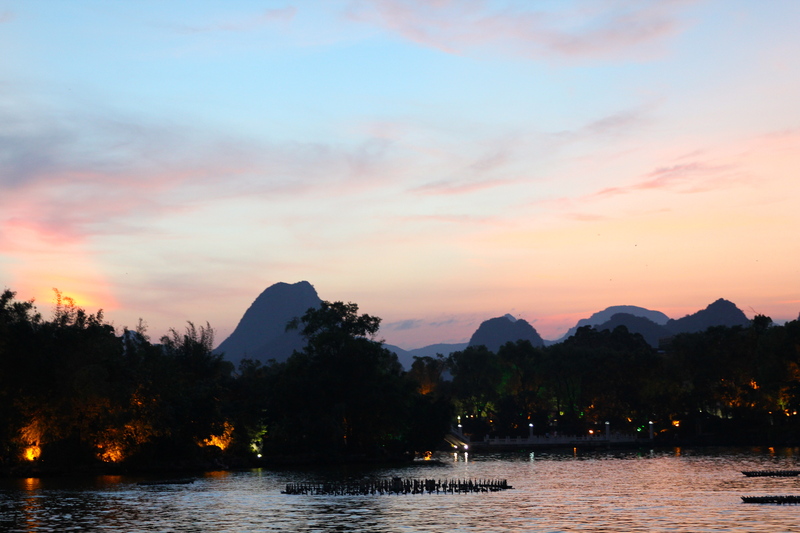 At the end of each day, the drum was beat at sunset to indicate the end of the day – in the Drum Tower. 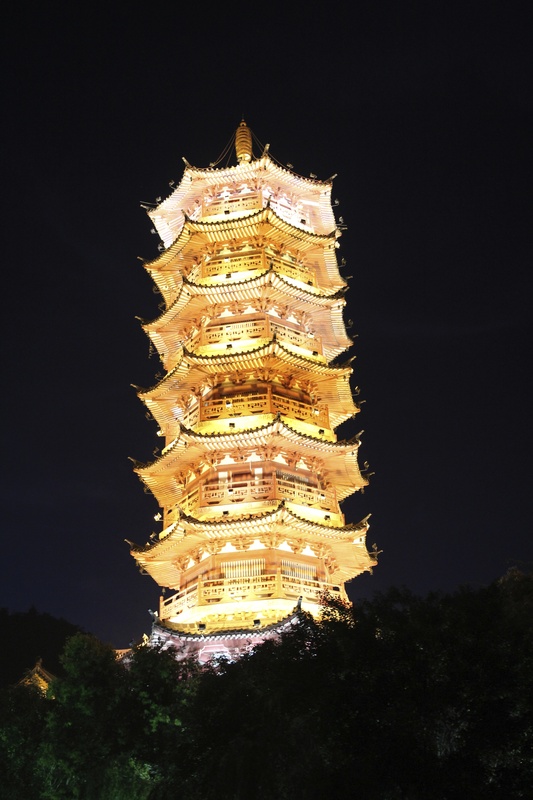 On the first floor of this tower is a hall that houses many large drums, decorated with intrinsic and beautiful Chinese writing, which symbolizes good fortune. 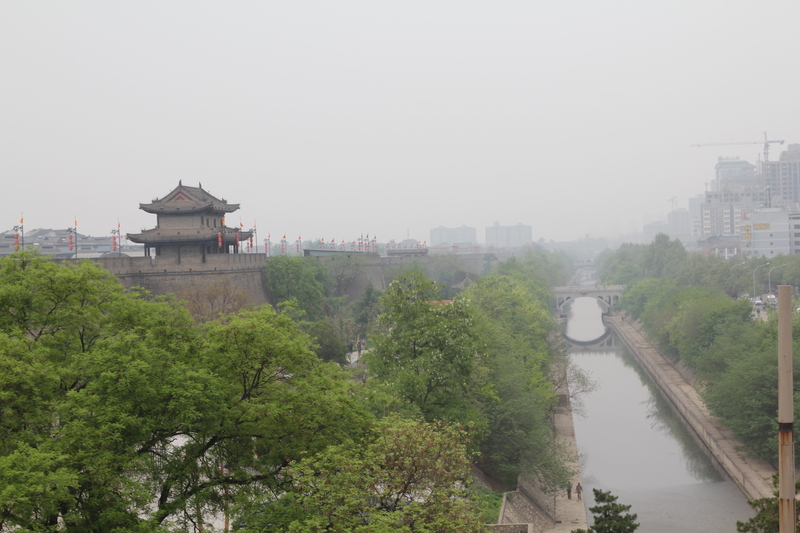 Many of the tour guides offer bicycle riding along the top of the City Wall. I think this is an excellent way to see it all! After we had visited the City Wall, Lily took us to Muslim Quarter, which includes Muslim Street. 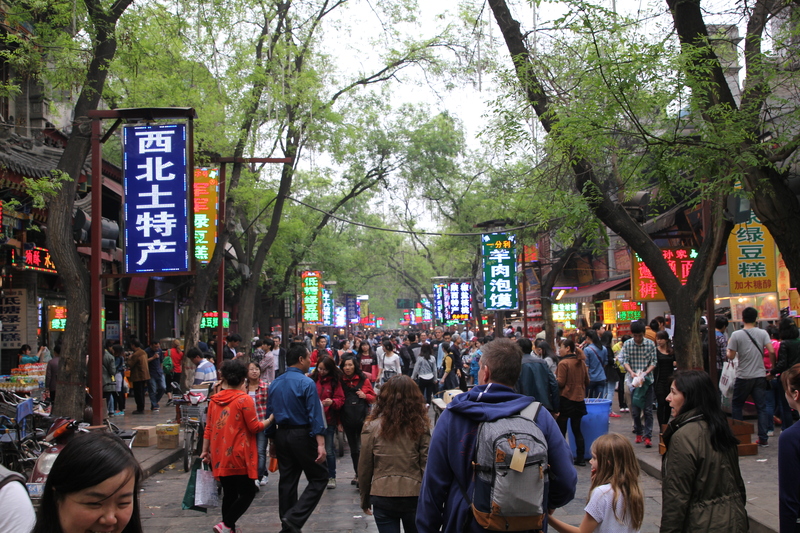 The street is about 500 meters in length from south to north and you reach it under the archway under the Drum Tower. This street is paved with dark colored stone with lots of green trees lining the street. 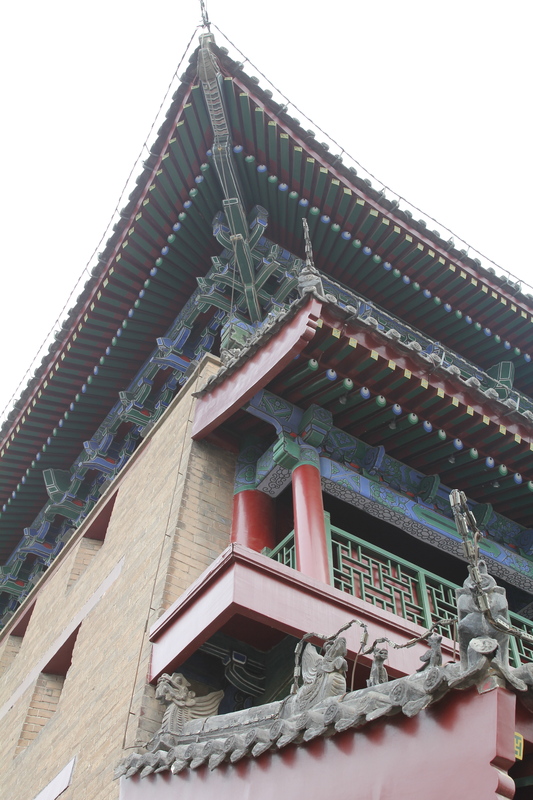 The buildings on both sides of the street are modeled on the styles of both the Ming (1368-1644) and the Qing Dynasties (1644-1911). Some of the buildings are restaurants, while others are stores selling lots of tourist souvenirs, but here there is one thing in common: the owners are all Muslims. 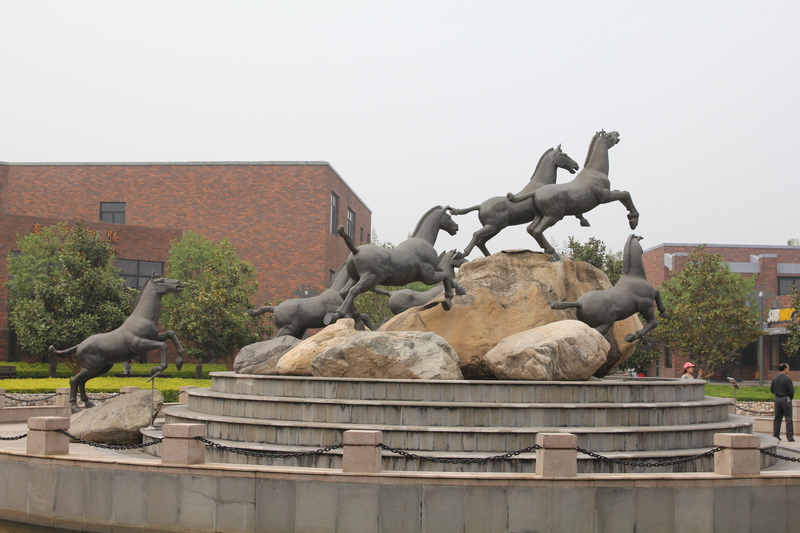 This is a big tourist attraction in Xi’an! 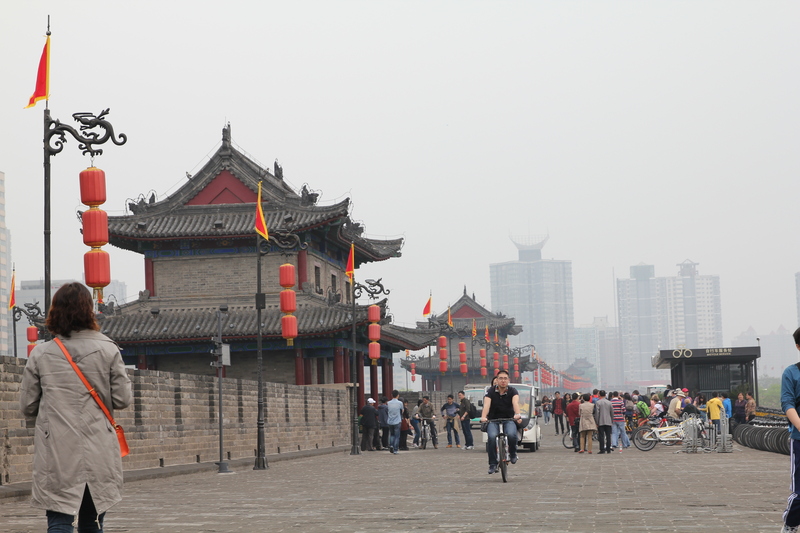 Xi’an was the starting point of the ancient Silk Road 1,000 years ago in the Western Han Dynasty (206 BC-9 AD). 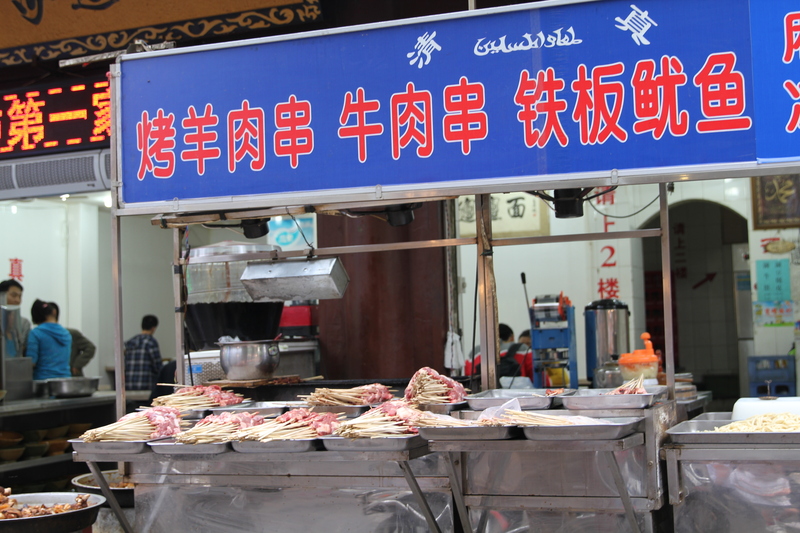 A number of merchants and overseas students from the Arabic countries and Persia went to Xi’an for business and studying since the Western Han Dynasty (206 BC-9 AD); they settled down on the present Muslim Street, and they were called the Hui people by the locals. One generation after another, the descendants of the Hui ethnic people now number over 60,000. 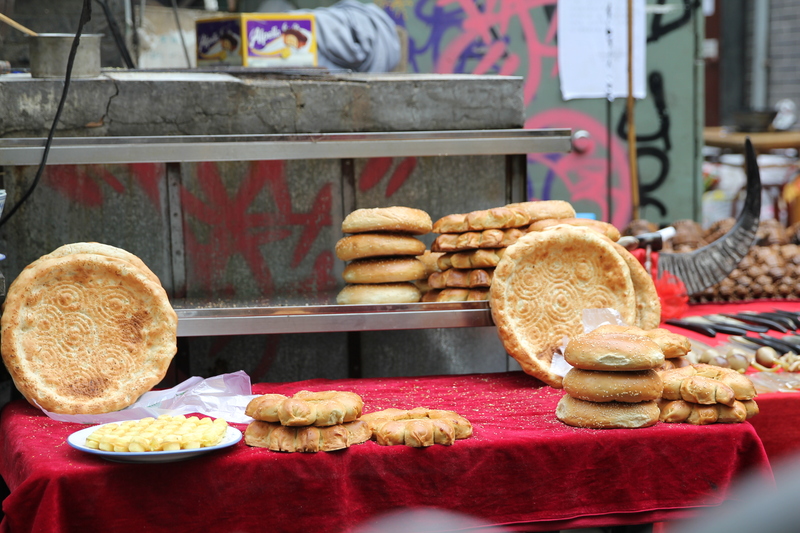 The street is lined with street food vendors. We did not try anything here, although i wanted to! Lily was a great tour guide. We had heard lots of stories about tourists being taken to certain shops and vendors and pushed into buying something, but Lily did not do this. At the end of the day, she returned us back to the train station and even wanted to come and wait with us until the train time (which we declined as we thought we could do that by ourselves!) The whole day was a brilliant experience with a lovely lady who ensured that EVERYTHING ran smoothly with no unexpected surprises or additional fees. Like Jeff the day before in Beijing, Lily is also proud of the history and culture of China and this comes through when she is explaining and discussing it. This made a huge difference to me – being able to hear from a local all the things that you would never read in a guide book. She answered all our questions with patience and detail. It could not have been a better day! Sharing a meal with a local!